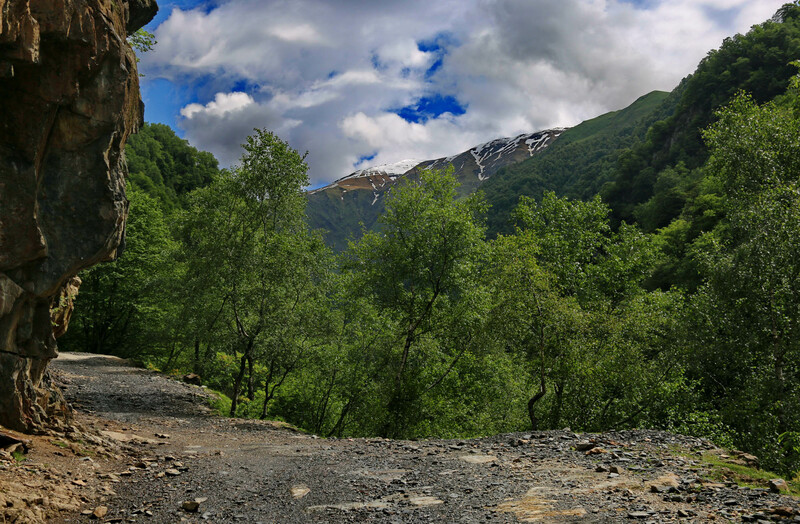 We are driving uphill on the road carved into the rock. 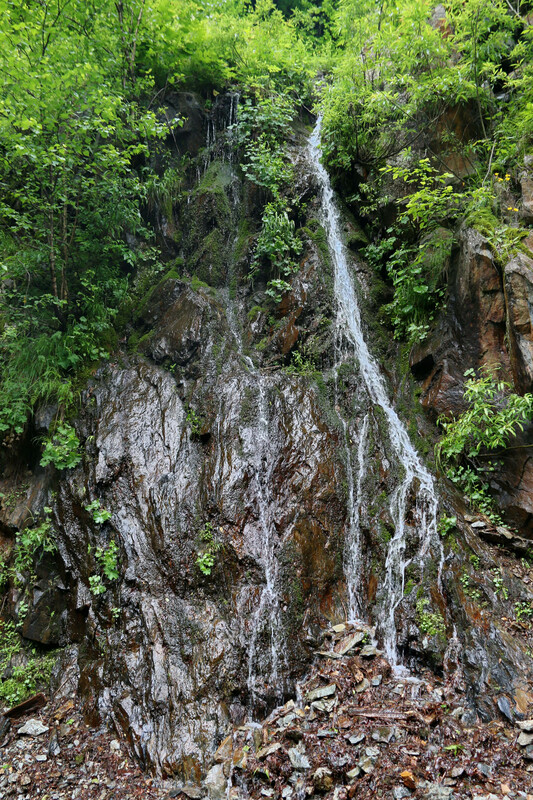 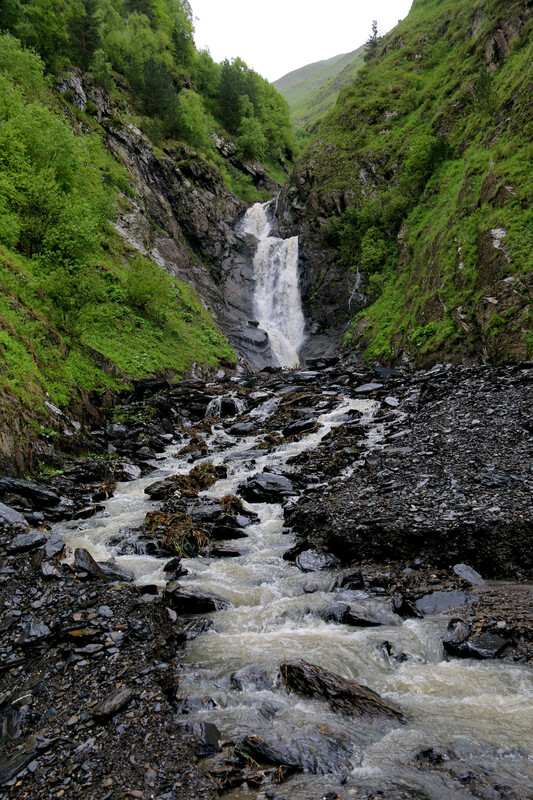 Waterfalls rush down on the vertical walls, they flow across the road in front of us, and on to the edge of the cliff, where they cascade down into the dizzying abyss. 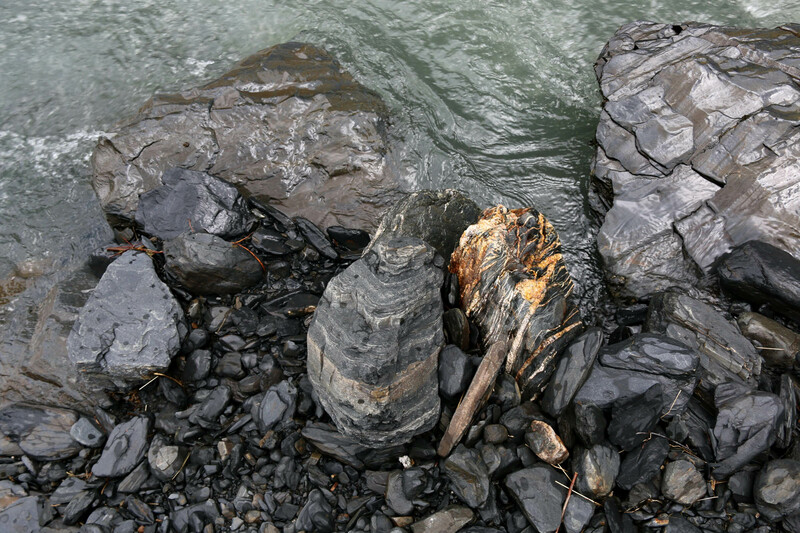 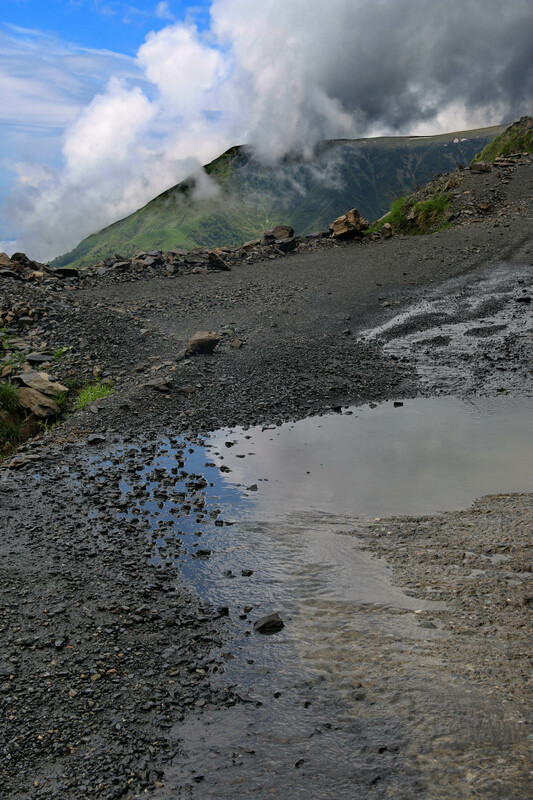 Sometimes we drive through, up to the axles in the torrent that floods the road. 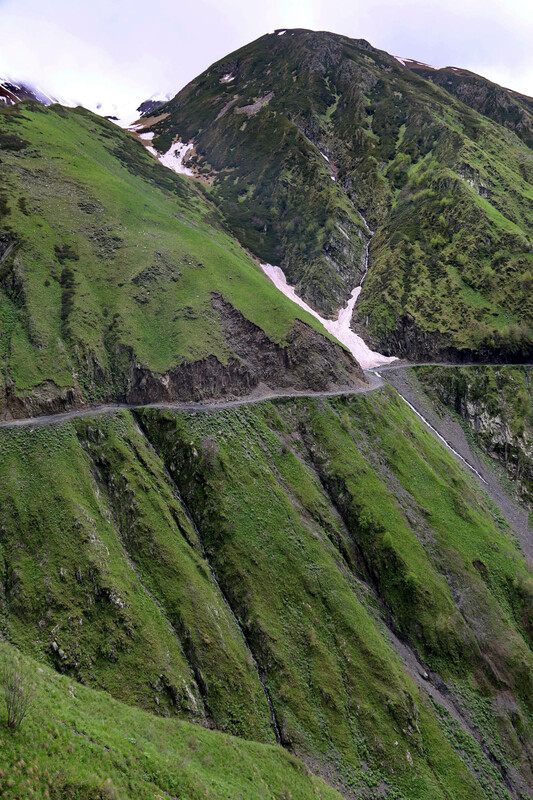 The thin strip of the road runs around the rim of a valley as a contour line, at the head of the valley it sharply turns back and rises towards the next pass. 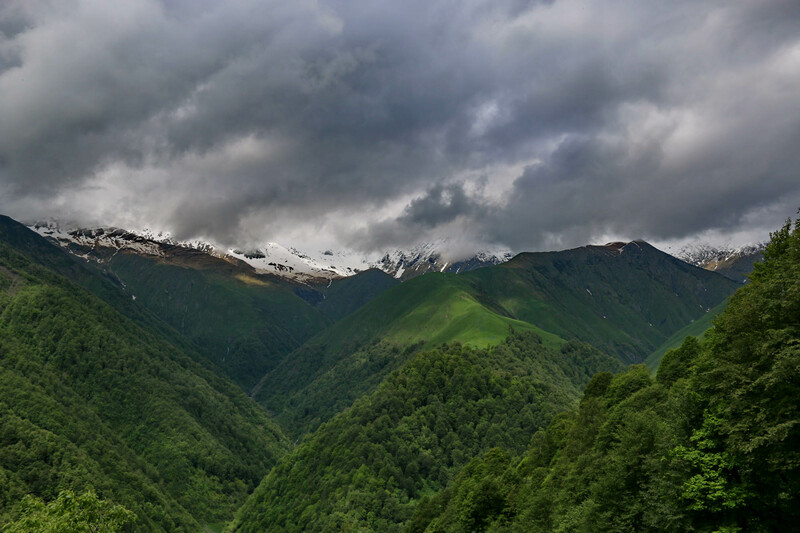 The Stori river roars deeper and deeper beneath us, the peaks of the Greater Caucasus are ever steeper, and the clouds, like large gray birds of prey, descend ever lower over our heads. 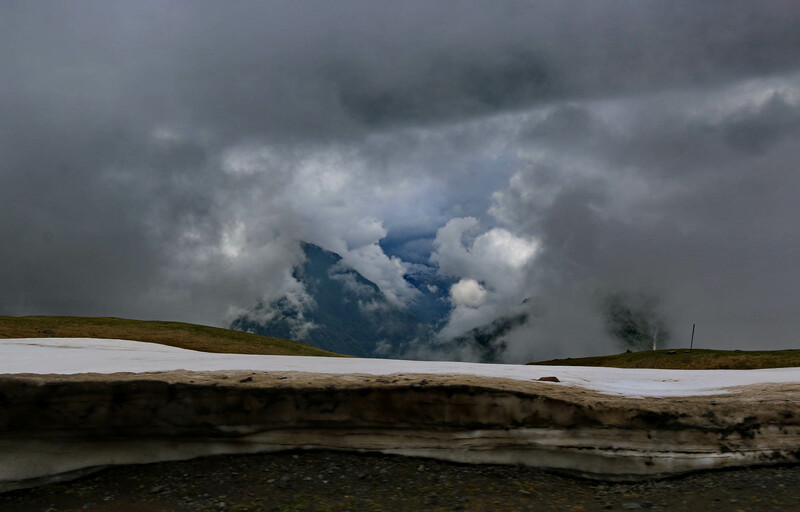 It is the end of June. 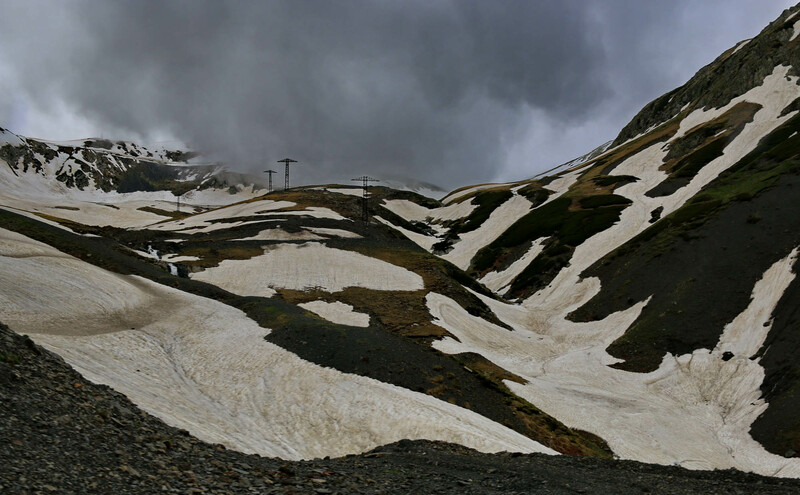 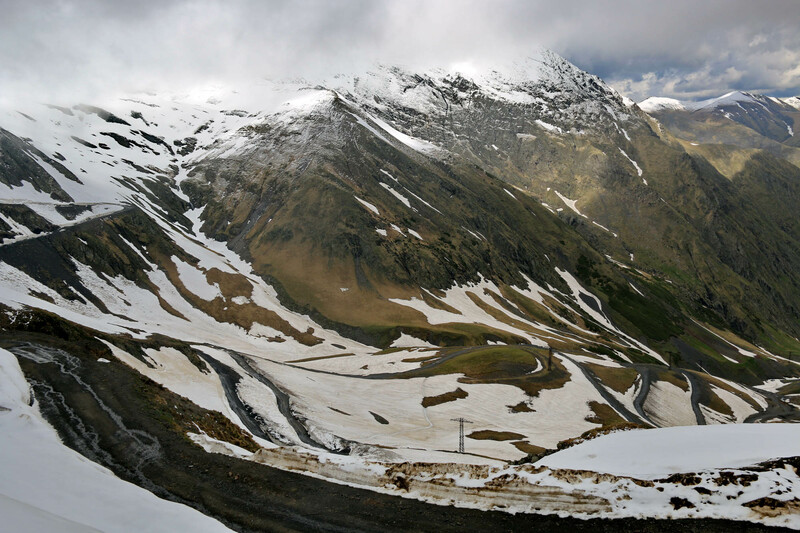 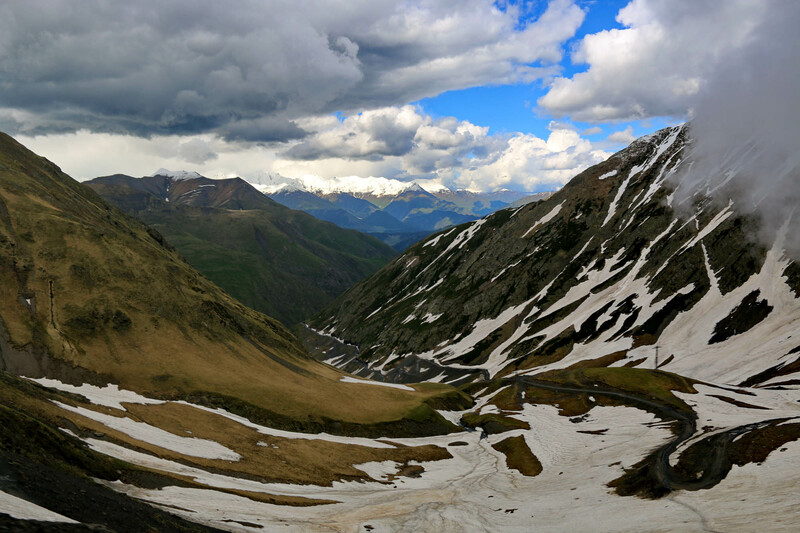 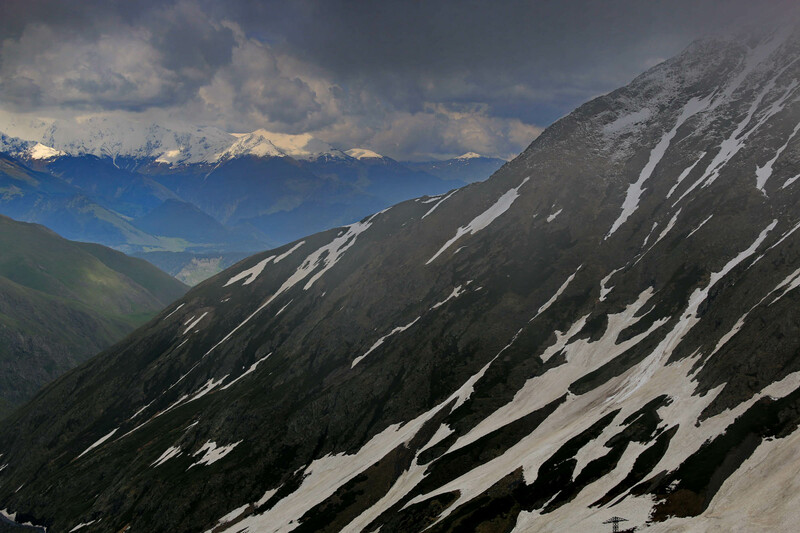 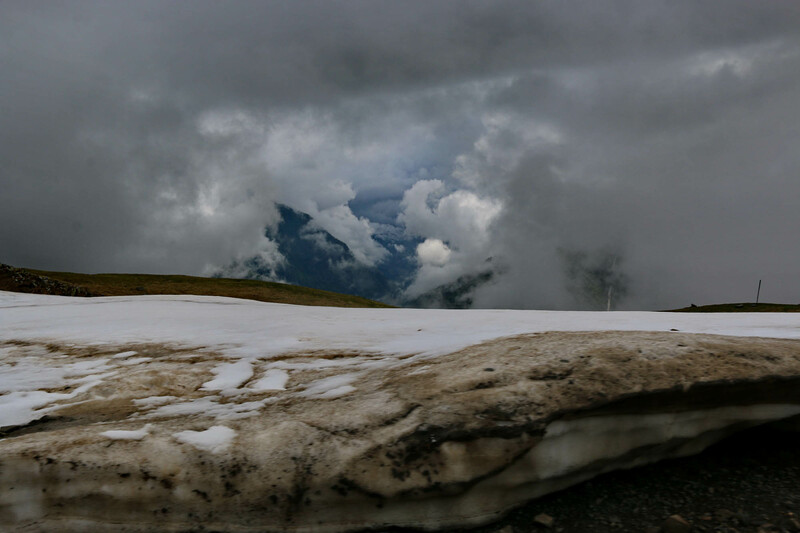 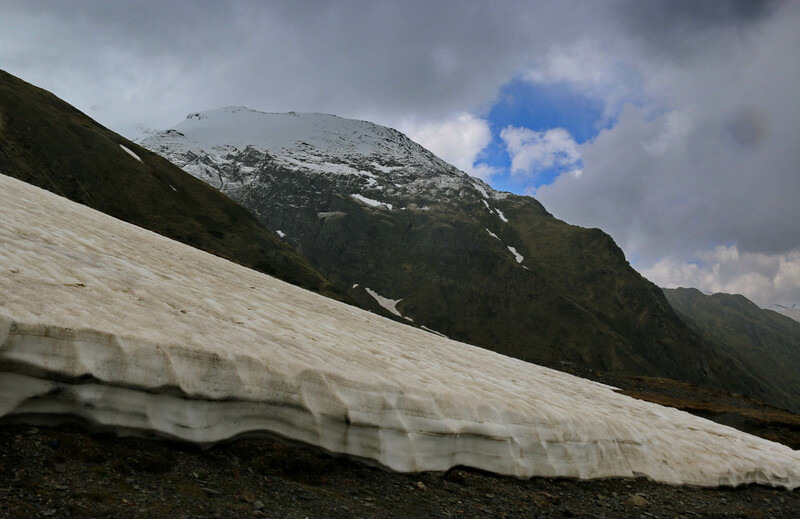 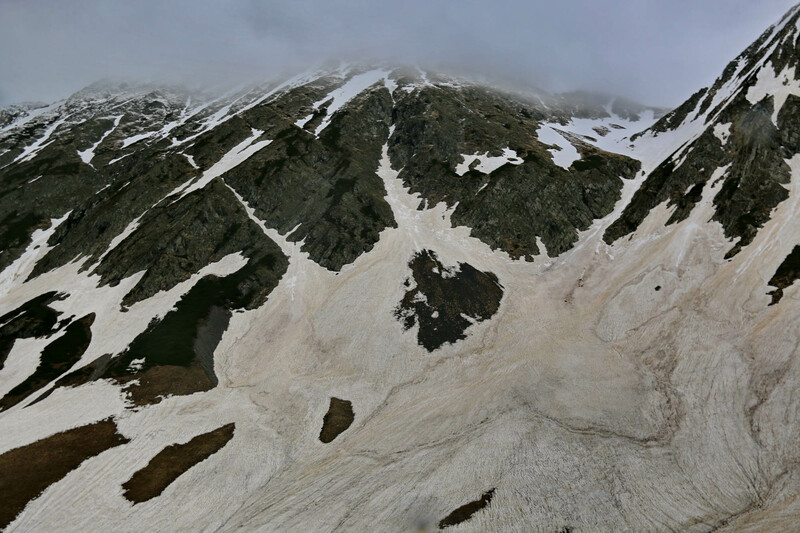 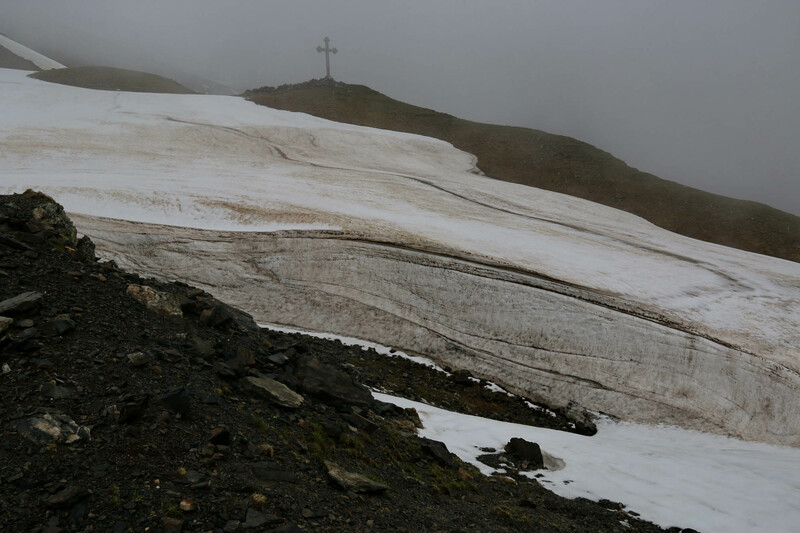 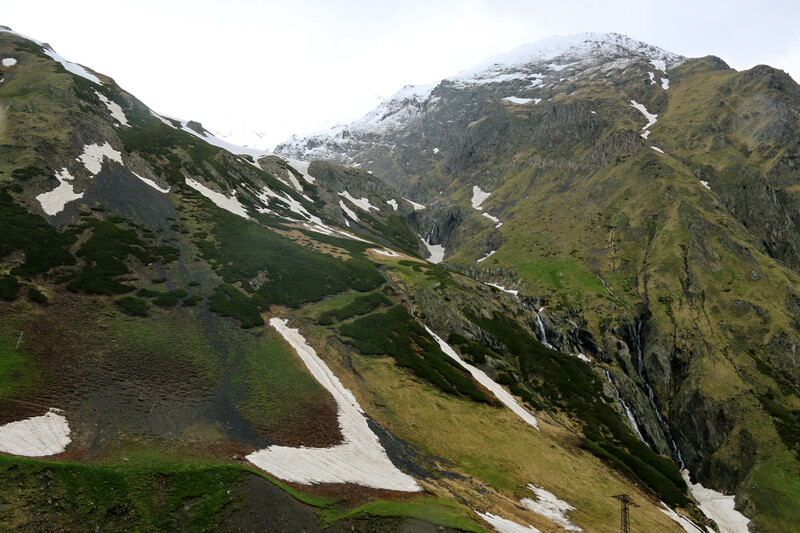 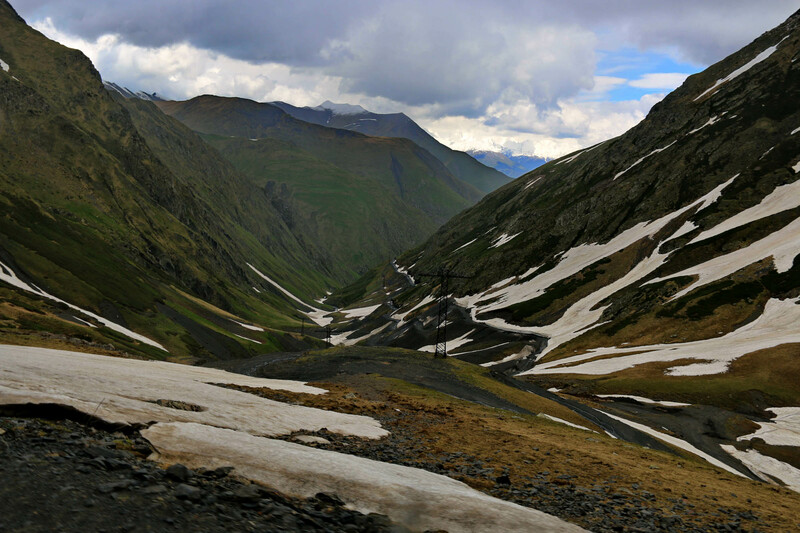 Snow has just melted on the 2900-meter-high Abano Pass, the snow walls, with colored layers, tower beside the road as sections of grained minerals. 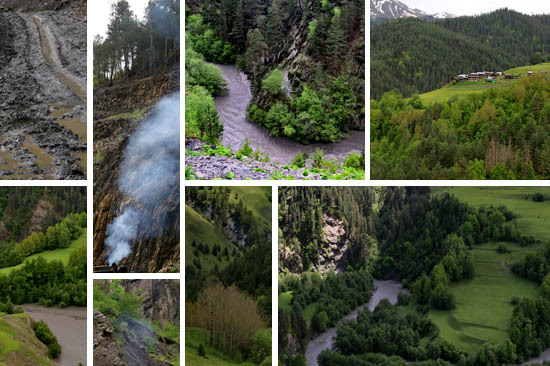 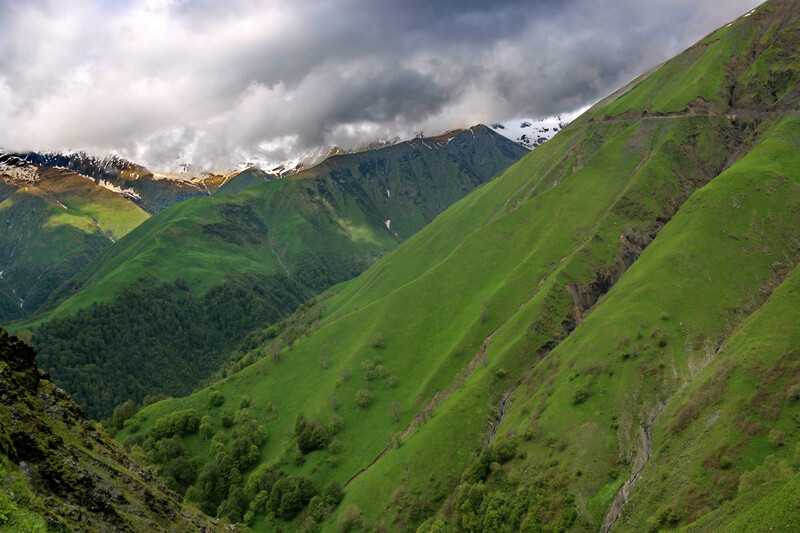 This is the watershed of the Caucasus, from here the rivers run to the north, across the valley of Tusheti, and over the Dagestani border. 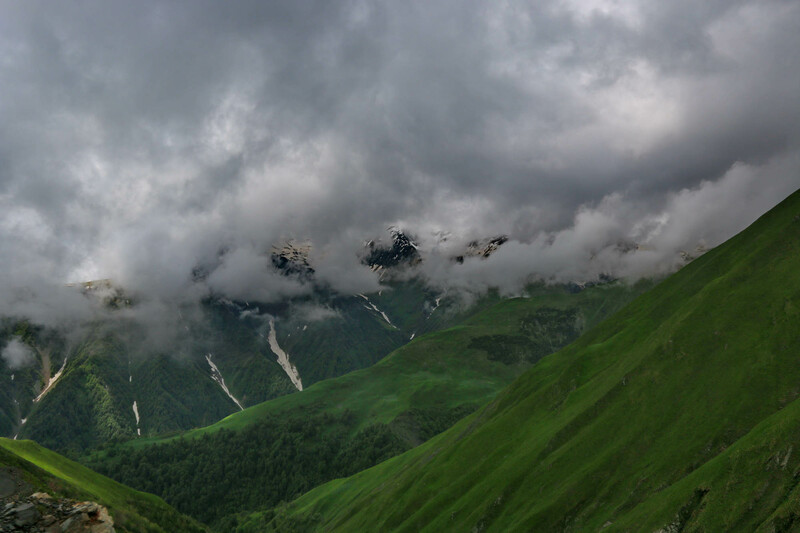 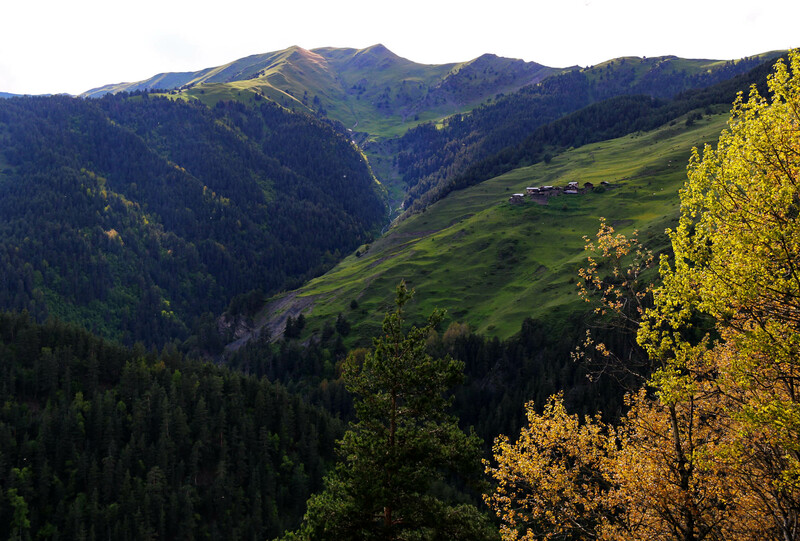 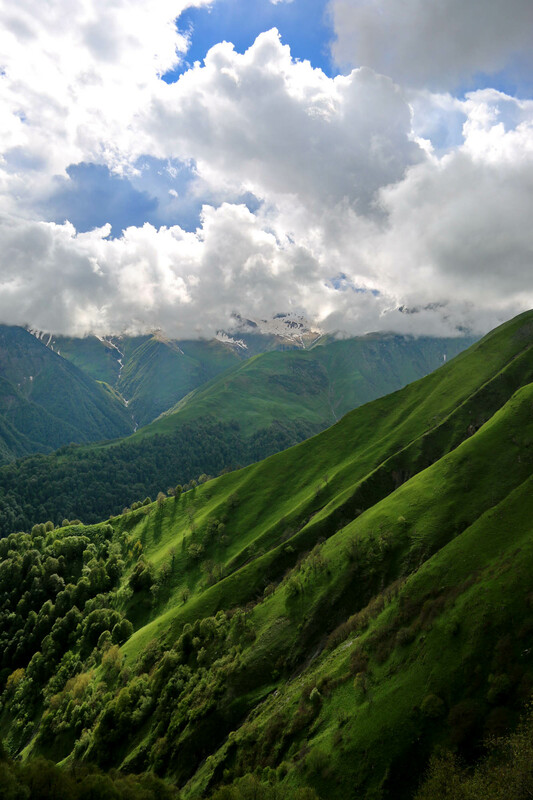 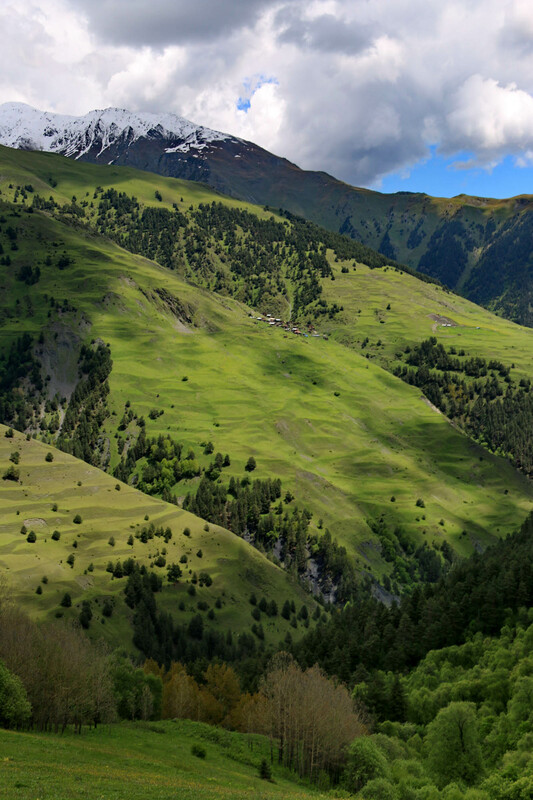 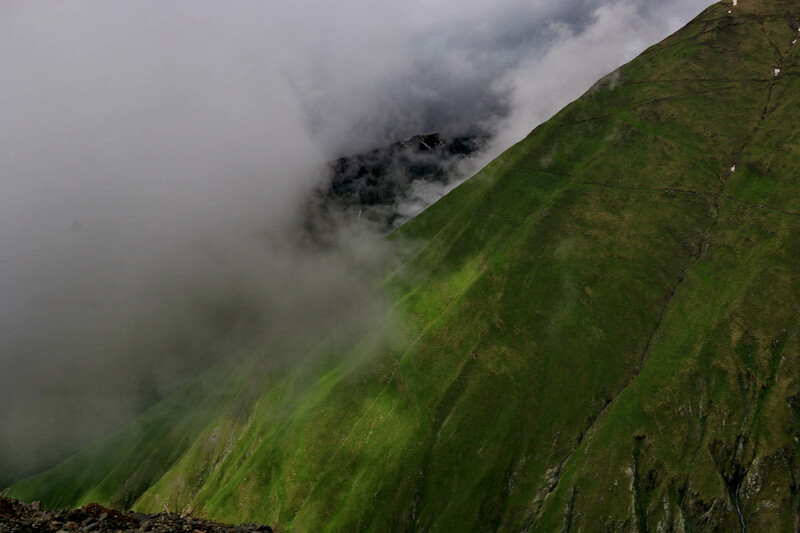 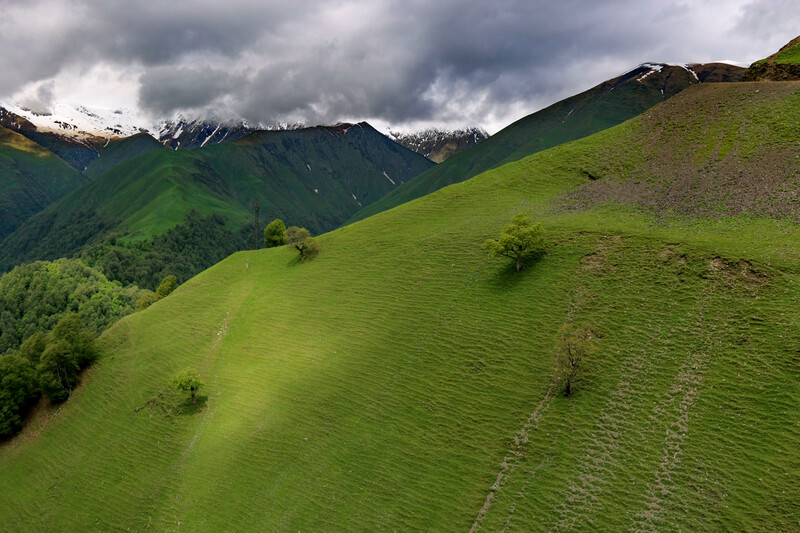 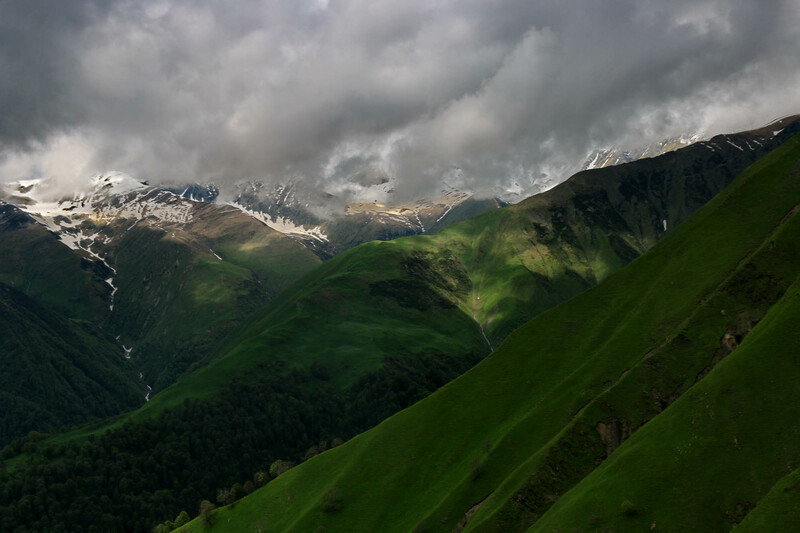 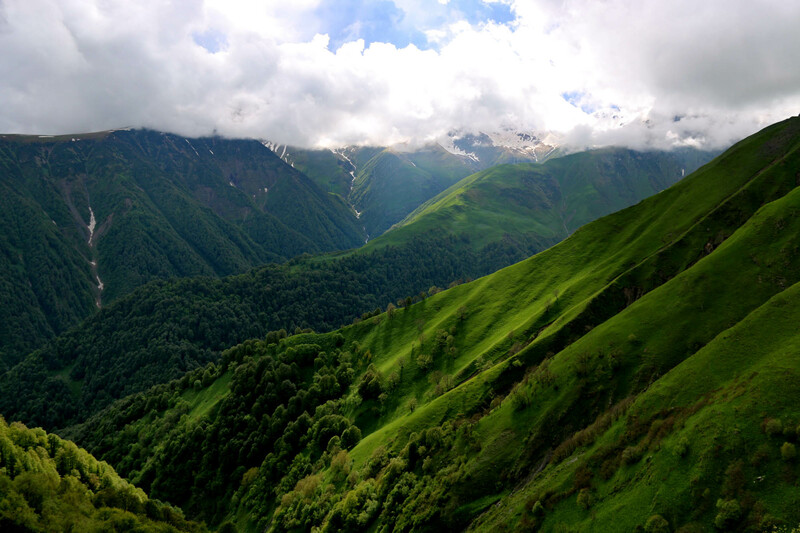 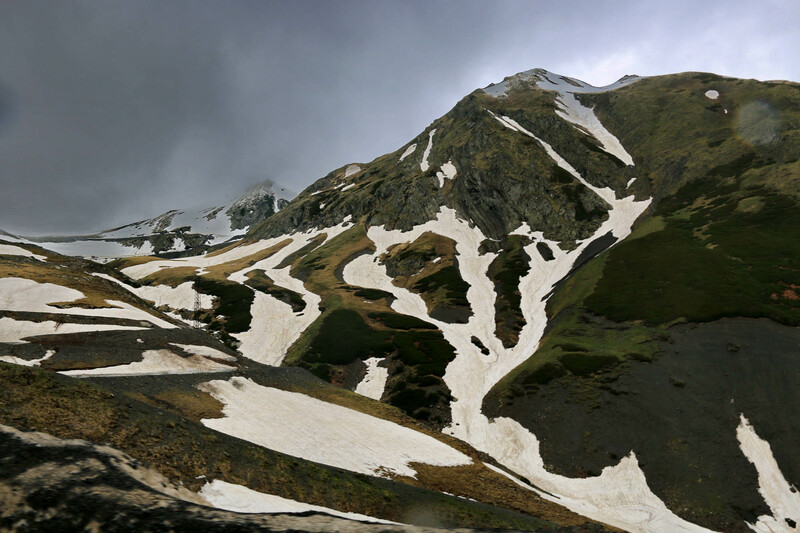 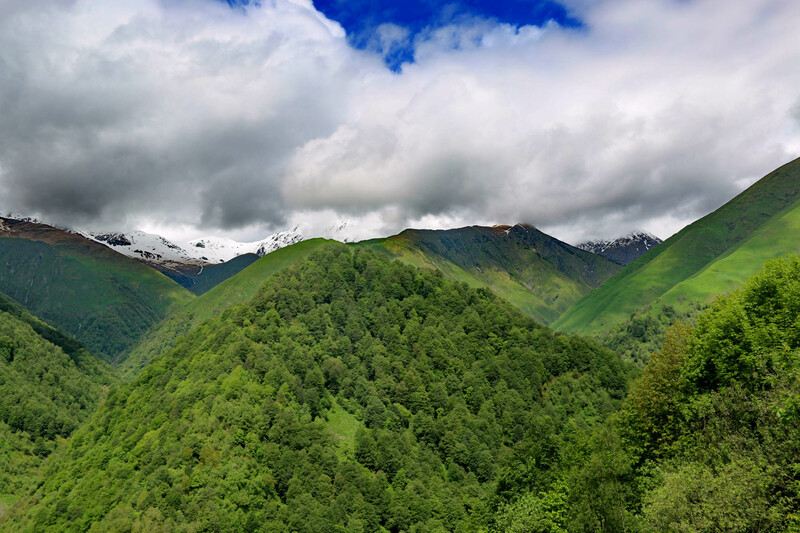 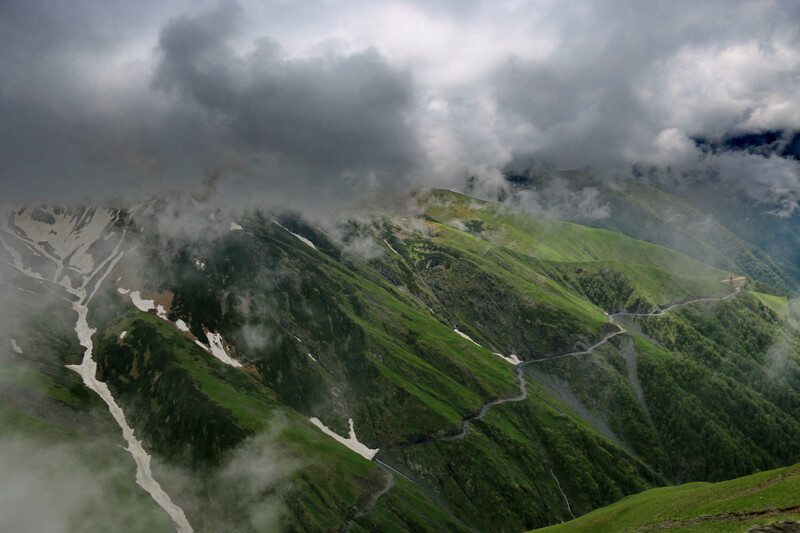 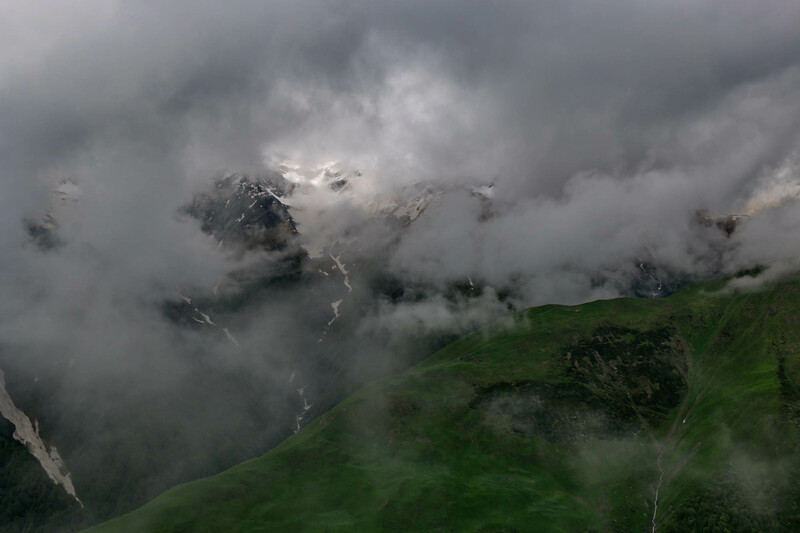 Below us, the green Tusheti mountains. 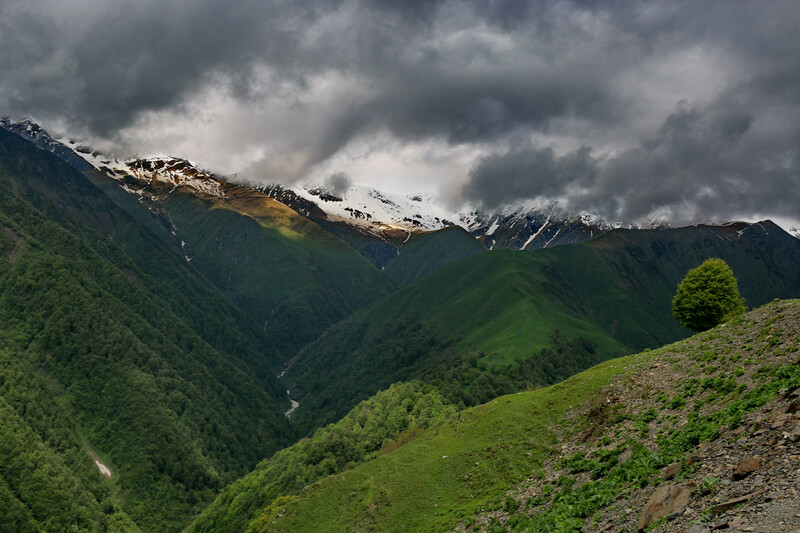 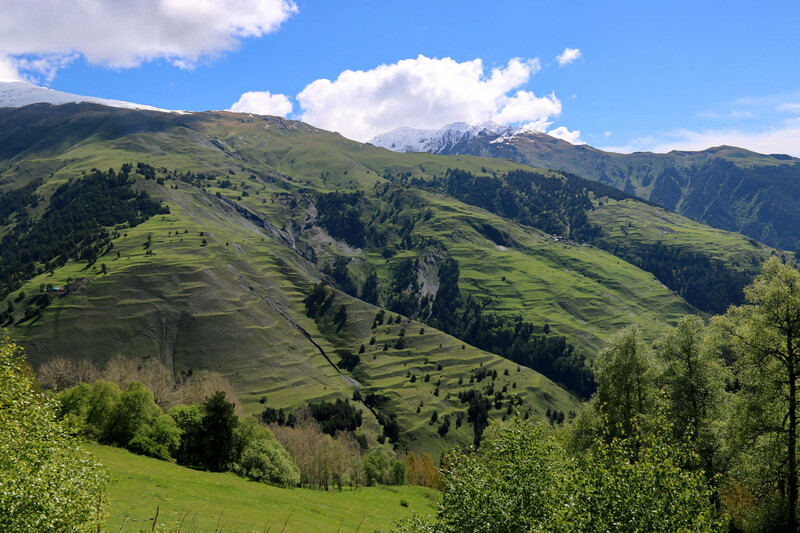 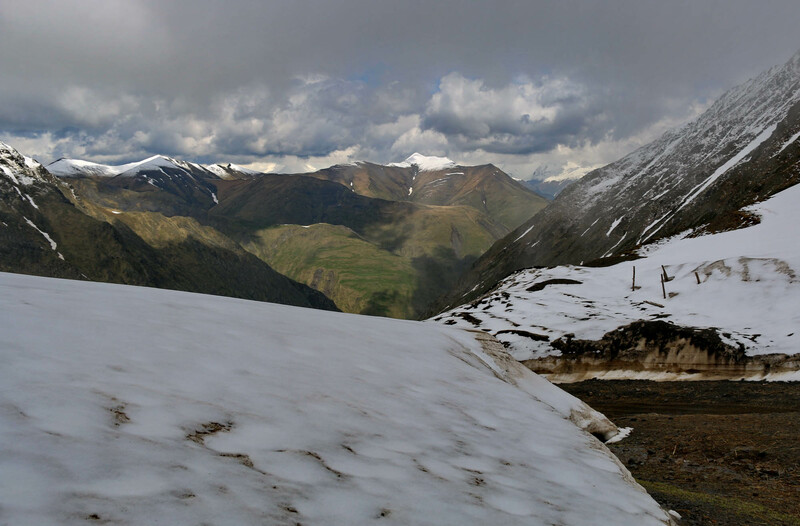 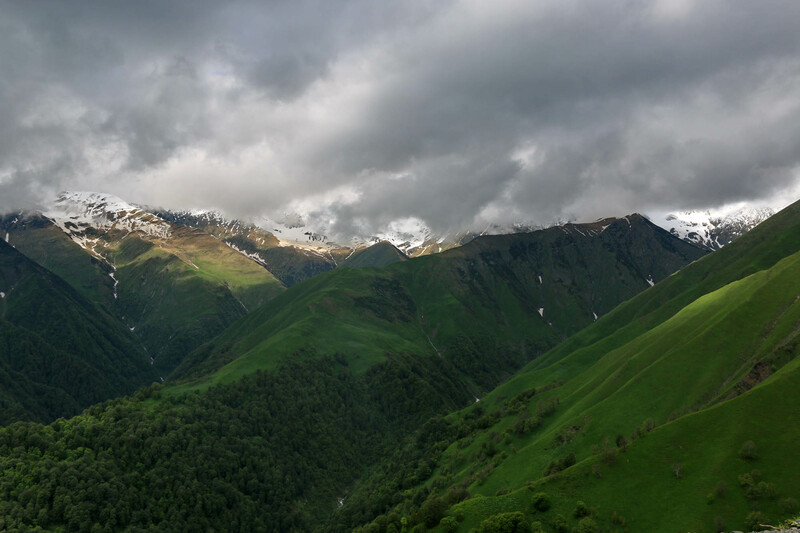 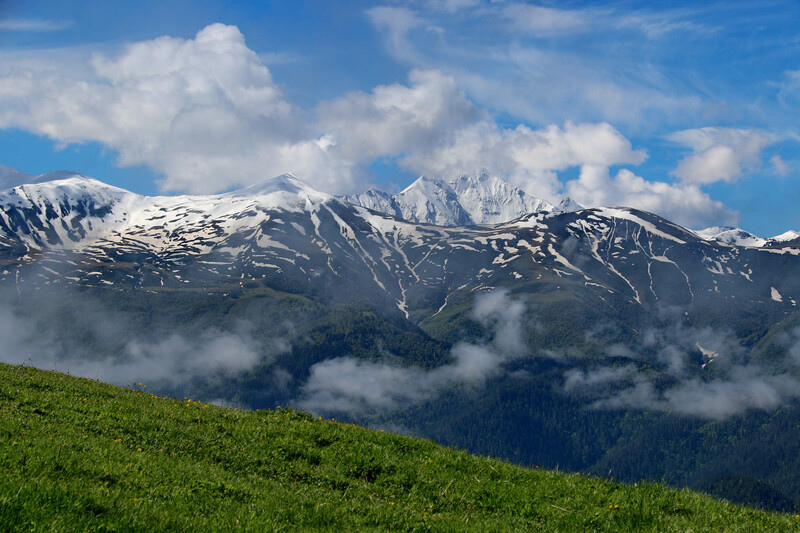 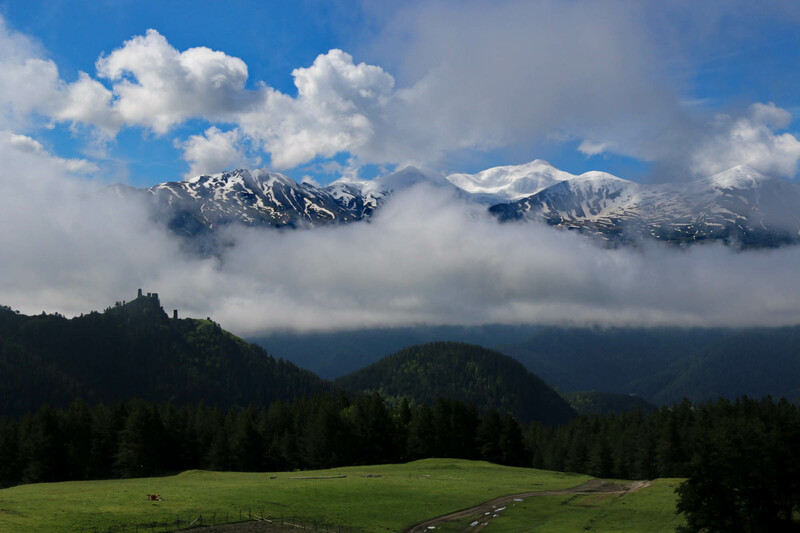 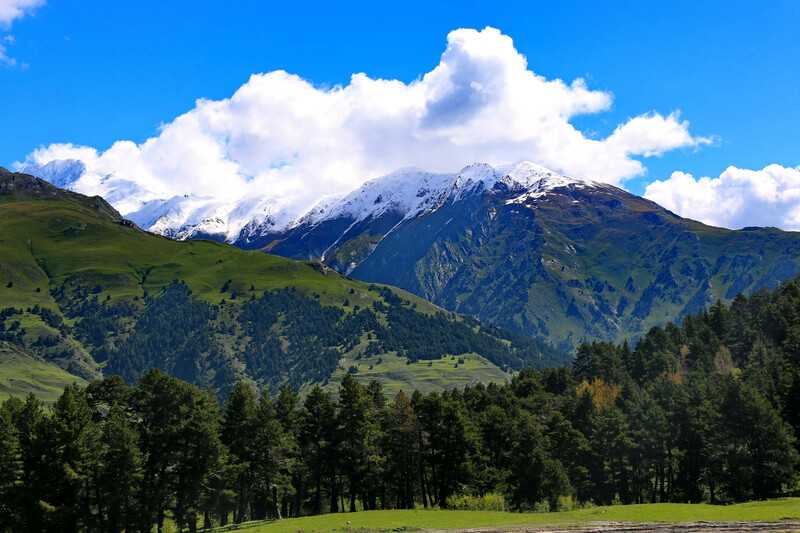 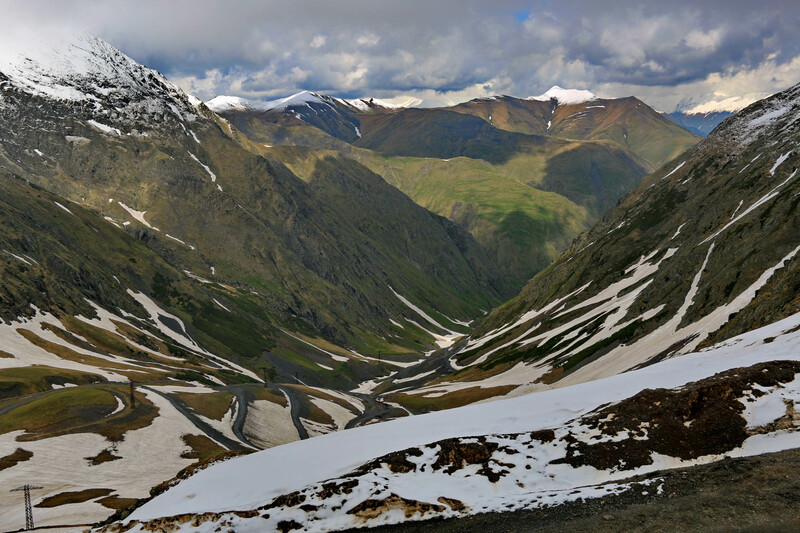 From the pass you can still see beyond them the snowy ridges of Pirikita, the Chechen border mountains, which then gradually sank, and will only appear spectacular once again when we are in Tusheti. 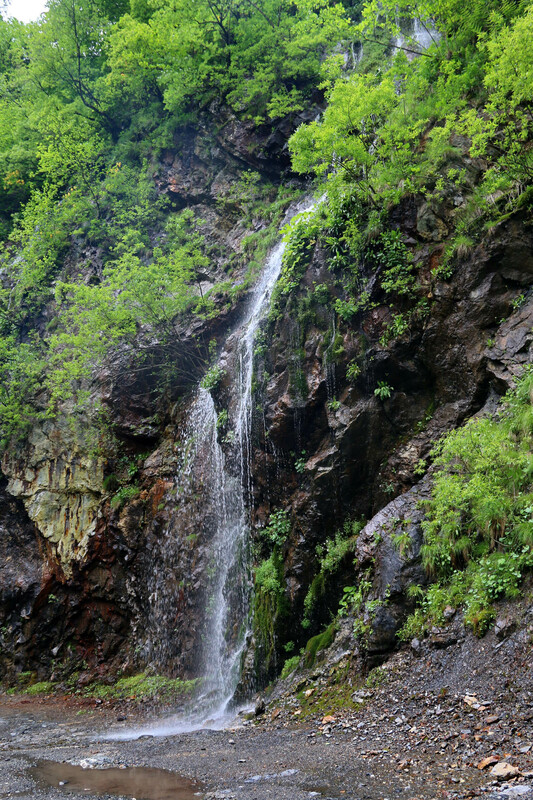 It has been raining for days. 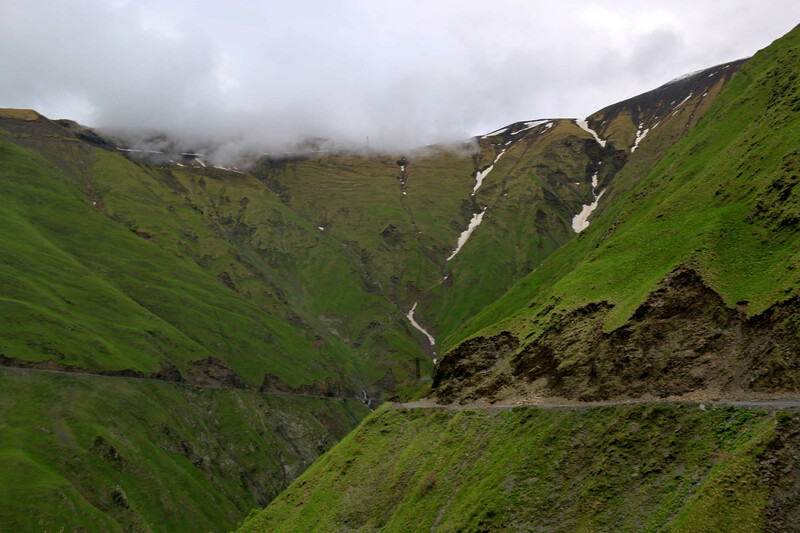 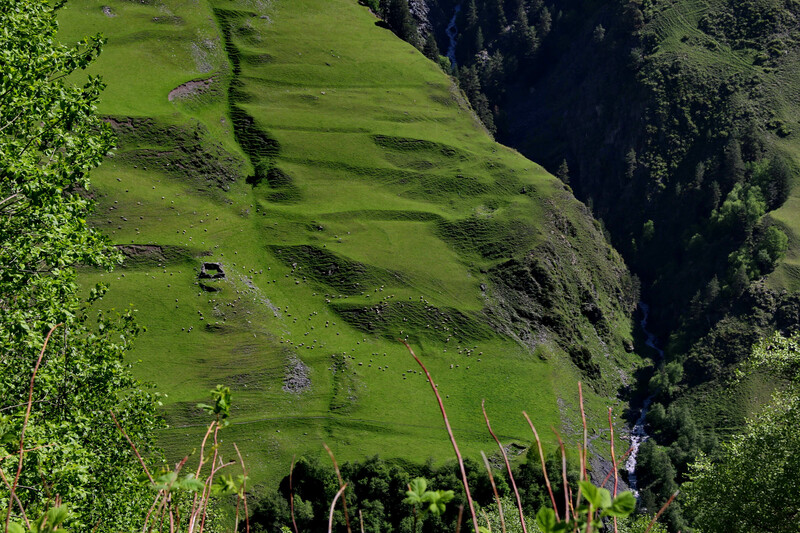 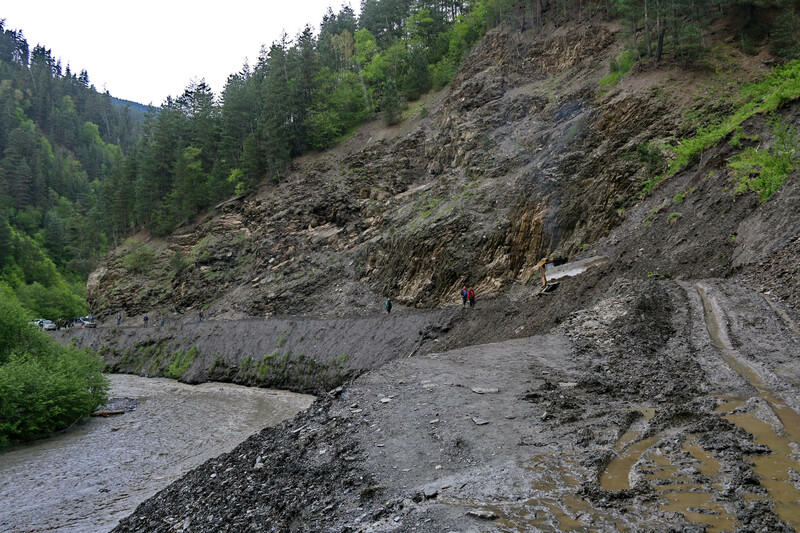 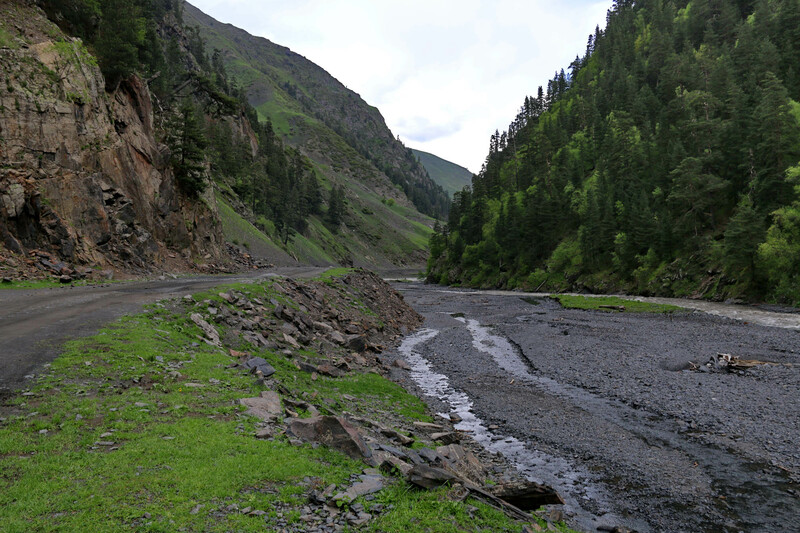 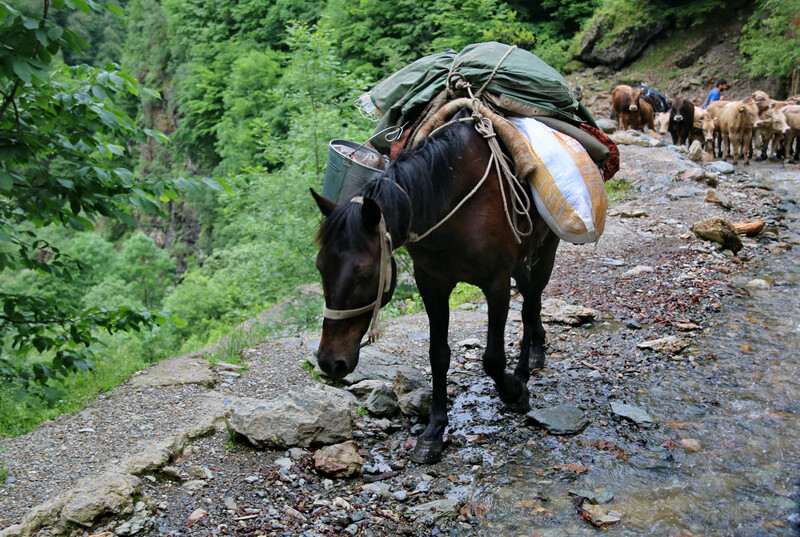 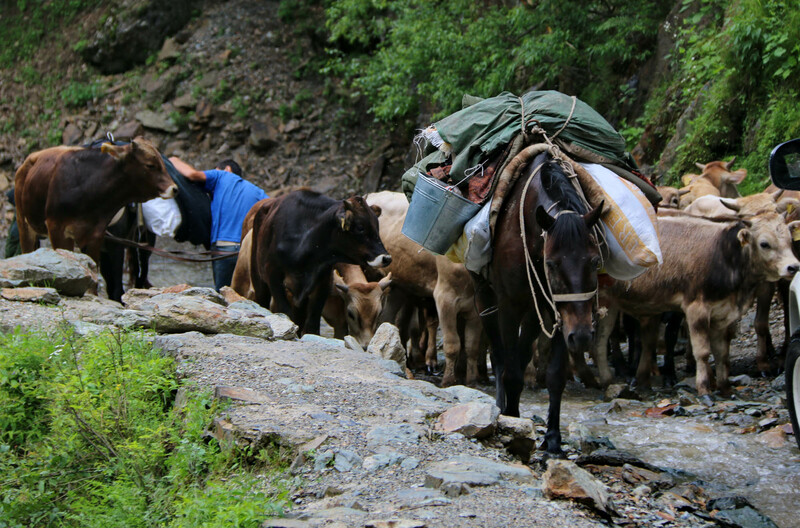 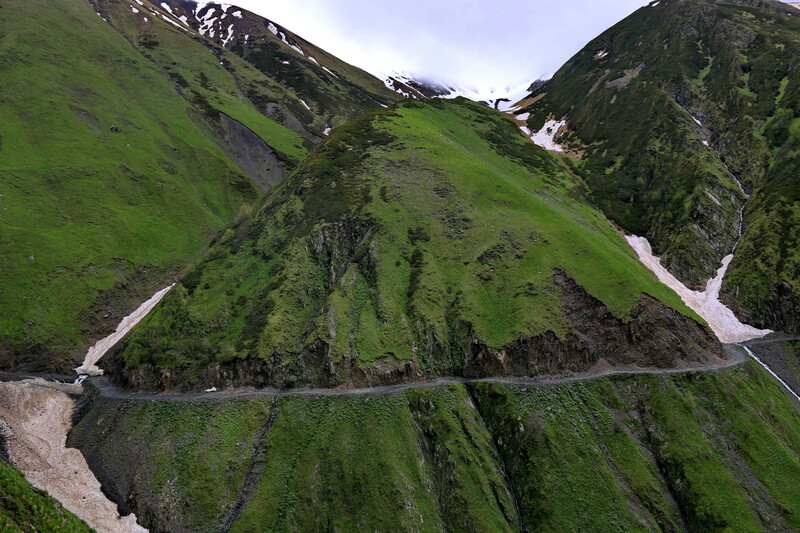 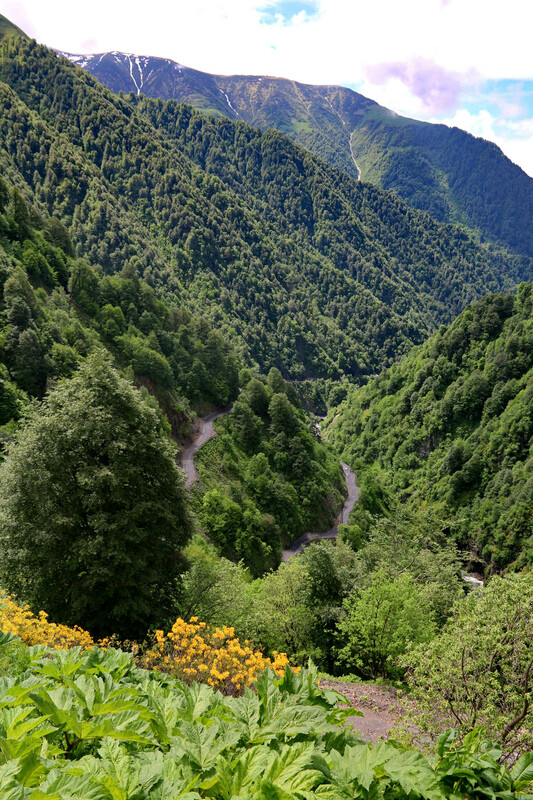 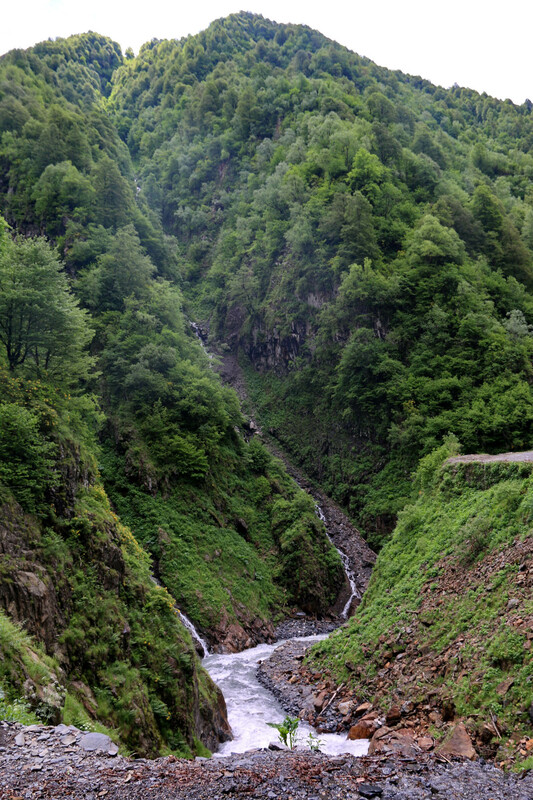 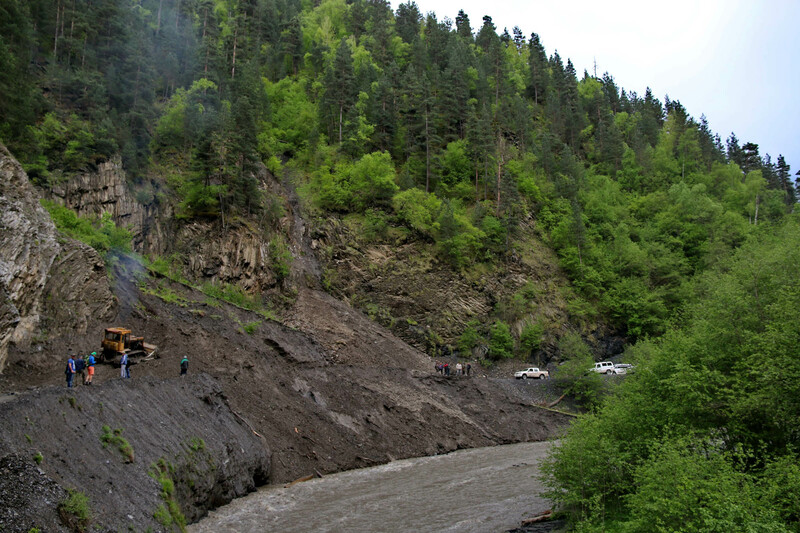 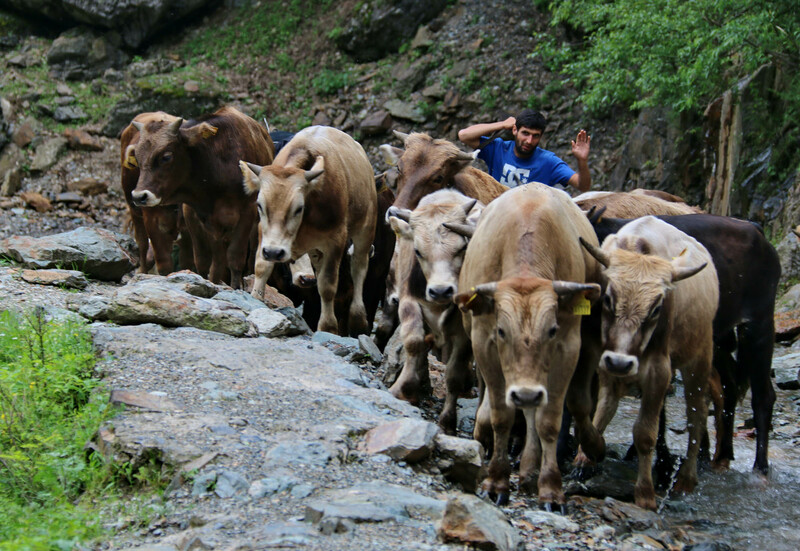 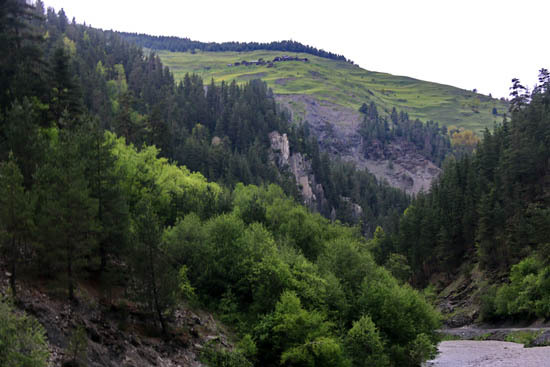 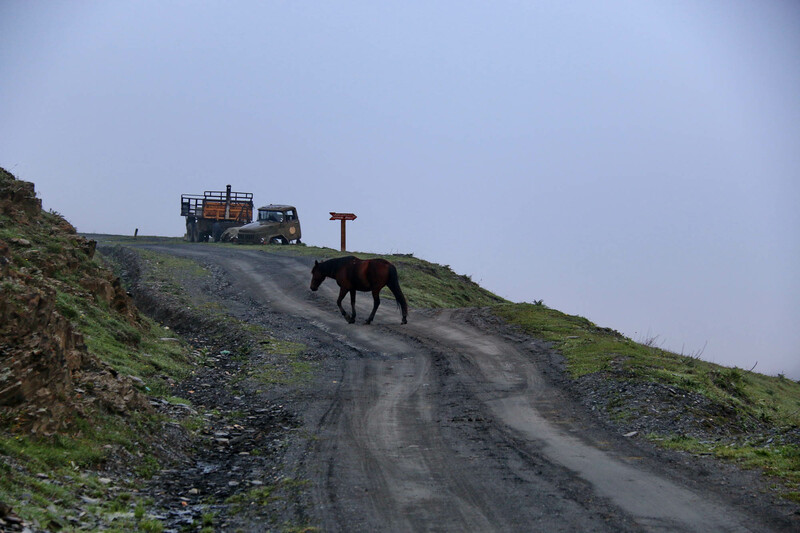 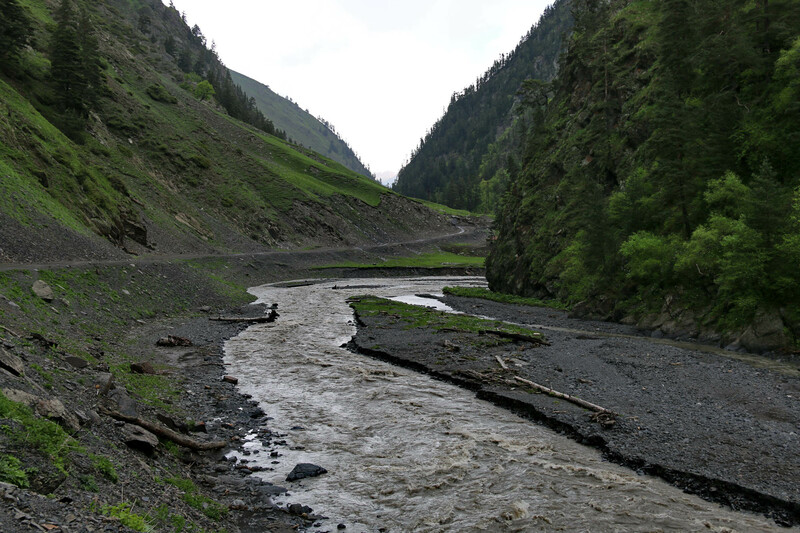 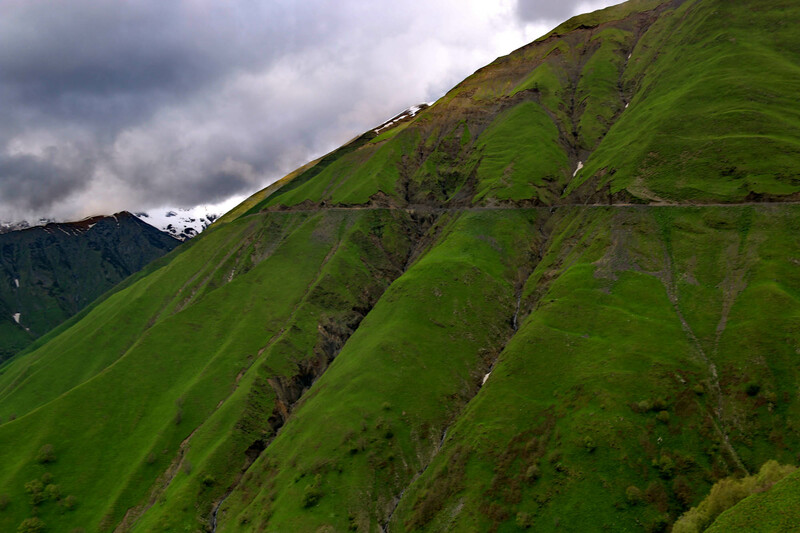 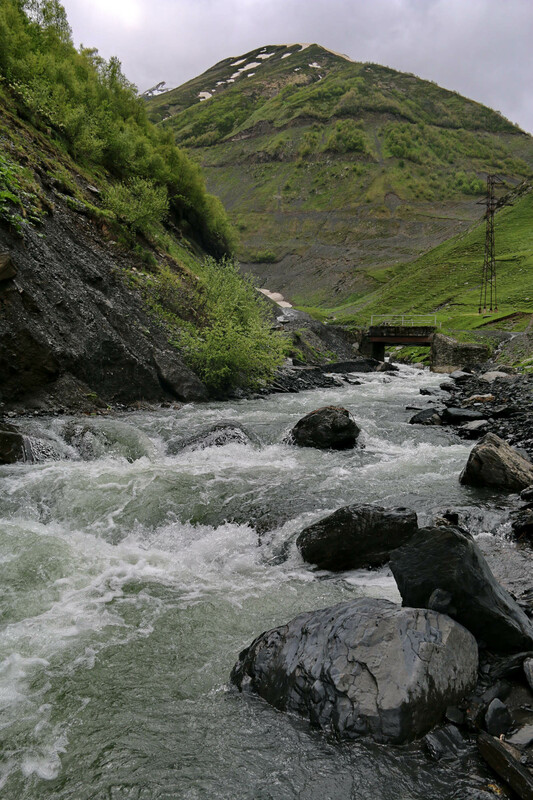 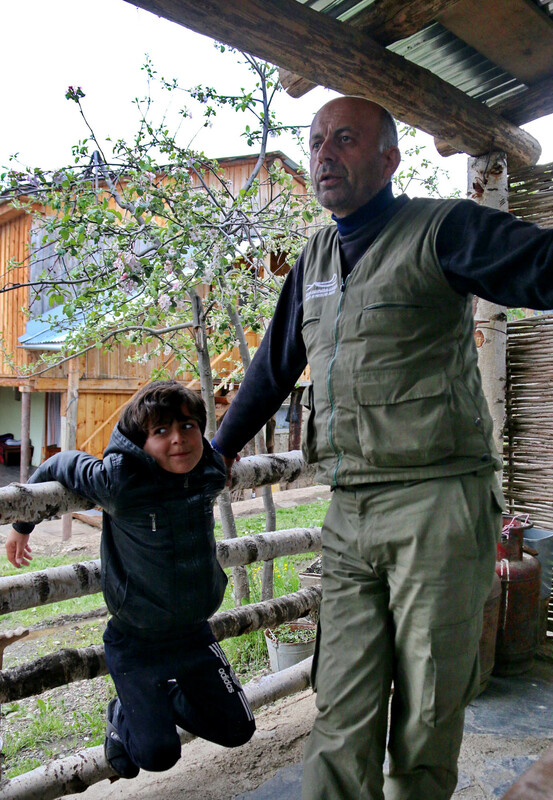 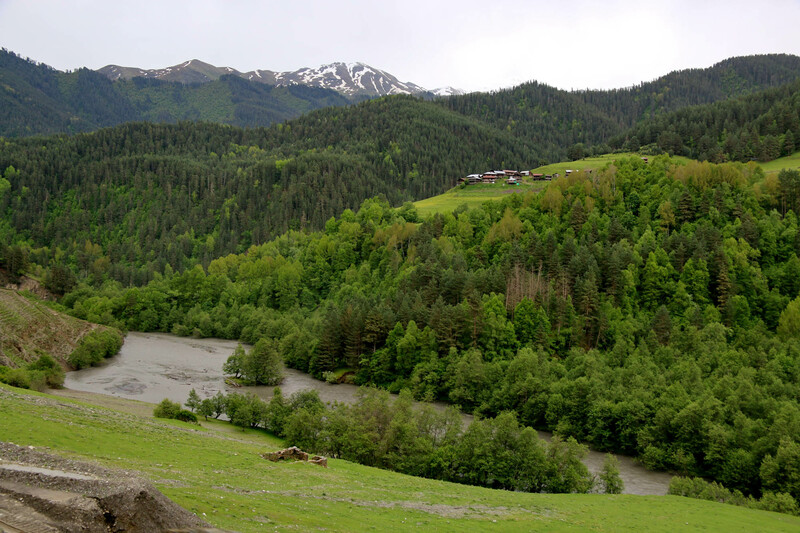 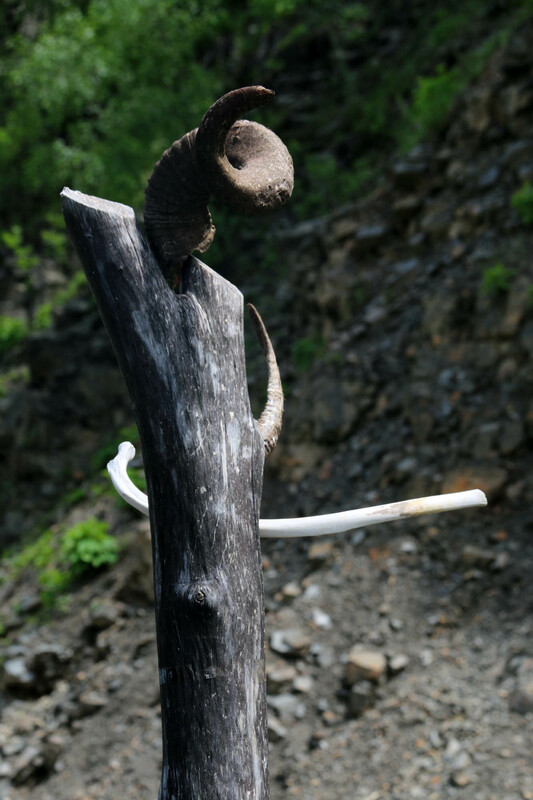 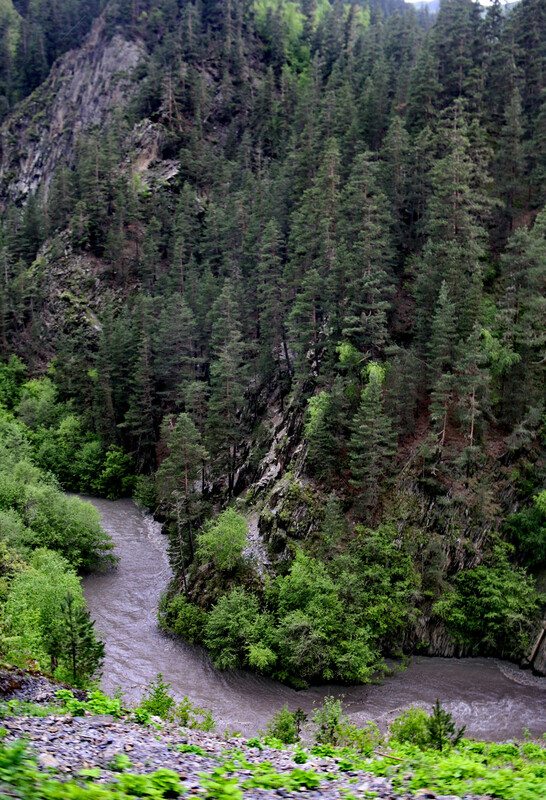 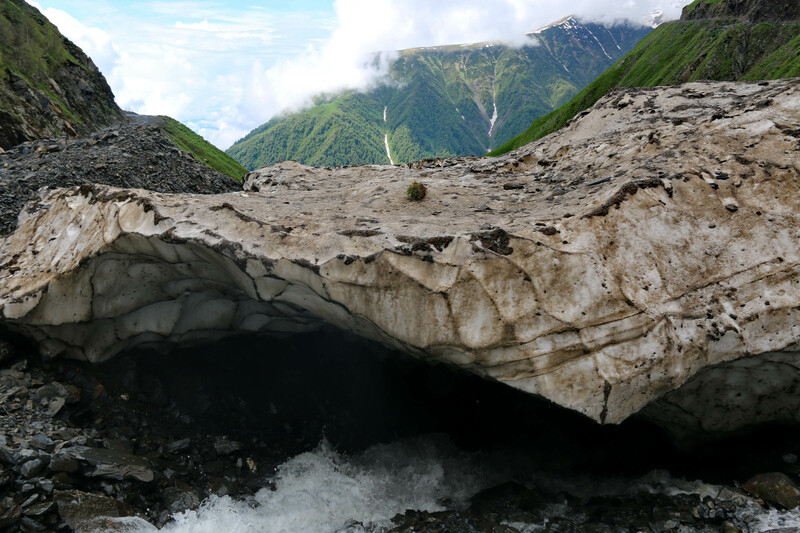 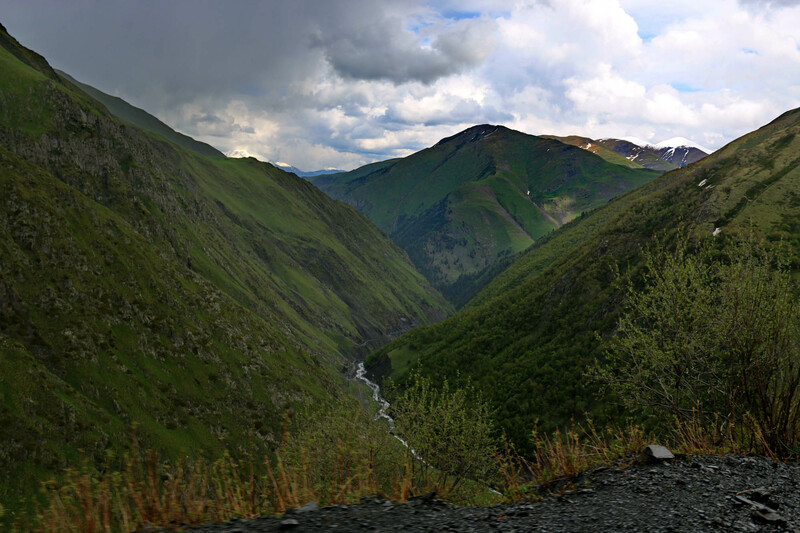 Shortly before Tusheti, the hillside slipped into the river, blocking the road. 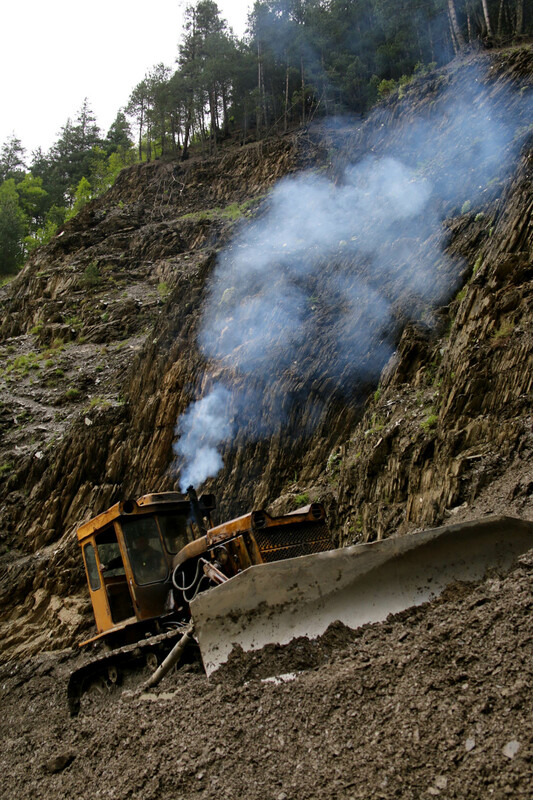 A lonely bulldozer is trying to clean off the mudslide, the unequal struggle will apparently last for several days. 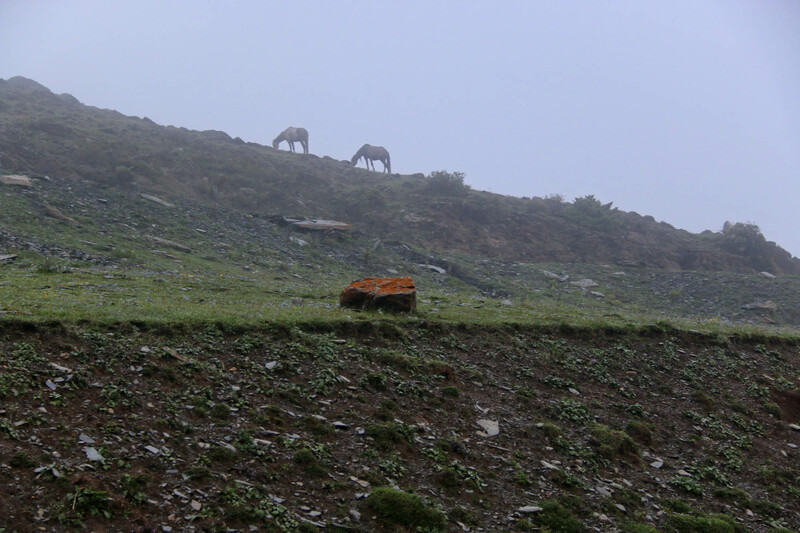 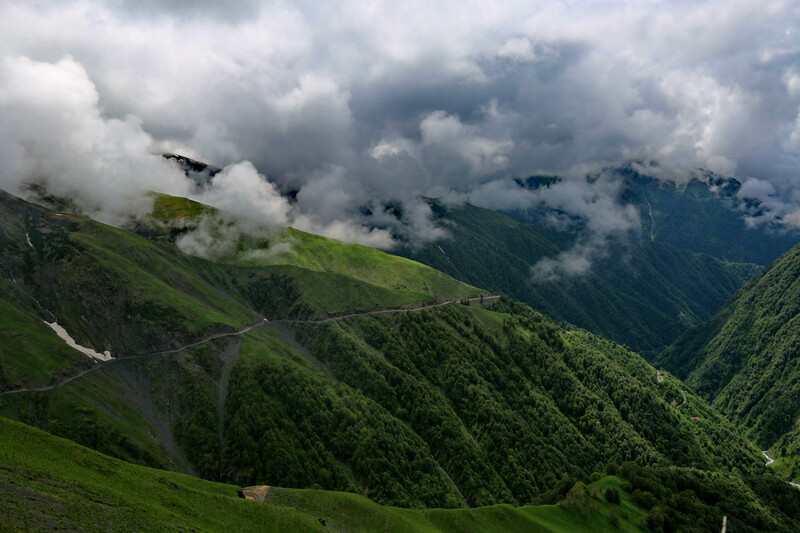 We must walk a few hundred meters atop of the still moving earth, to then take the off-road jeeps sent up for us from the villages of Tusheti. 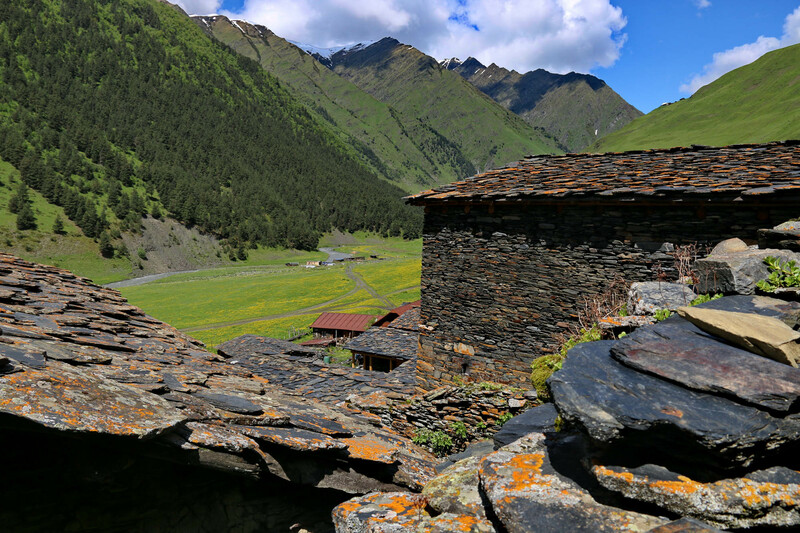 Only a few more lonely cliffs, some river bends under us, and high up on the mountainside the first lonely village appears. 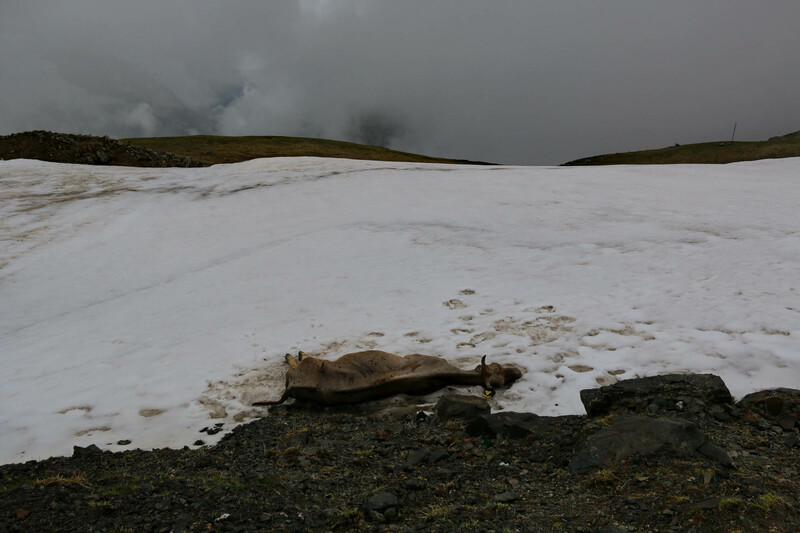 After Ushguli, Xinaliq and Masouleh, we are again on one of the tops of the world. 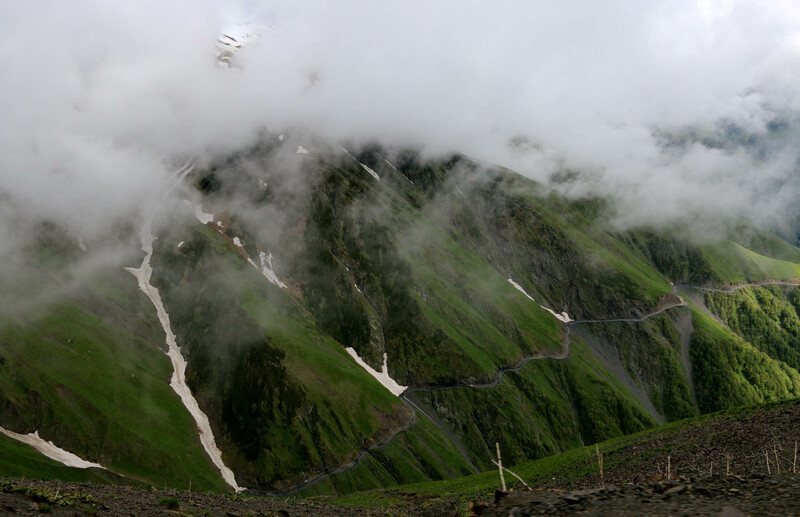 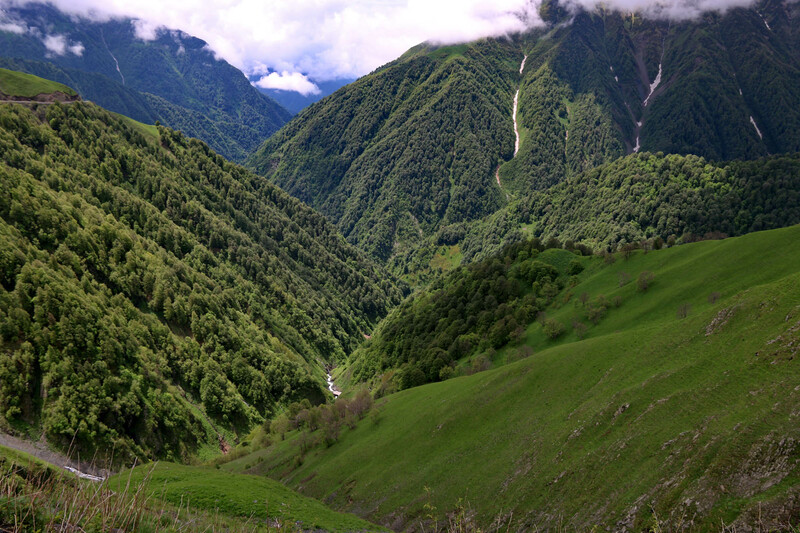 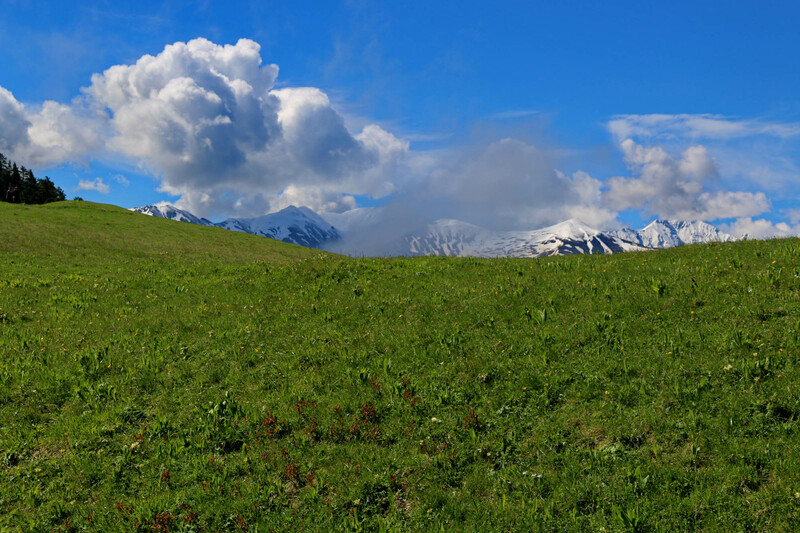 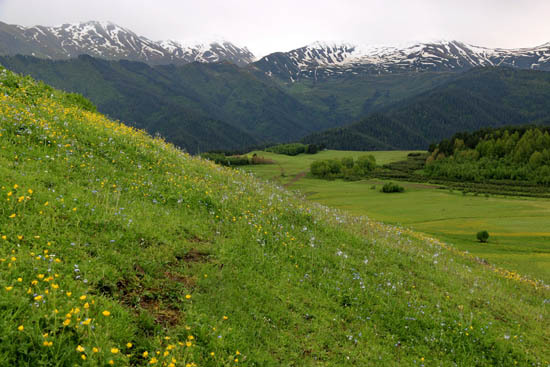 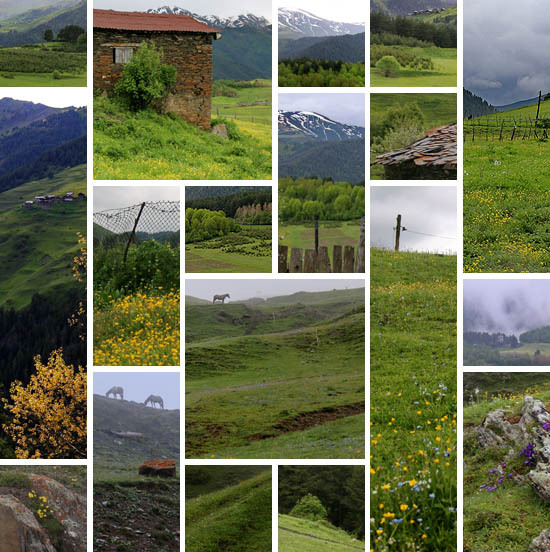 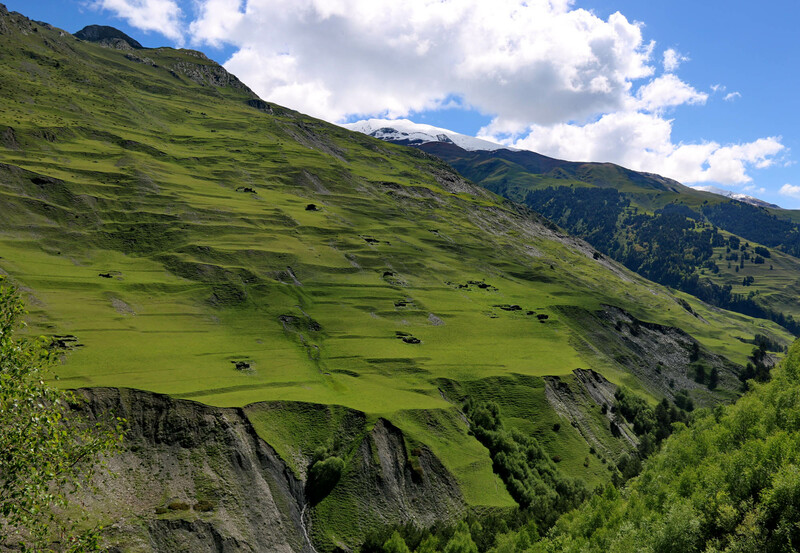 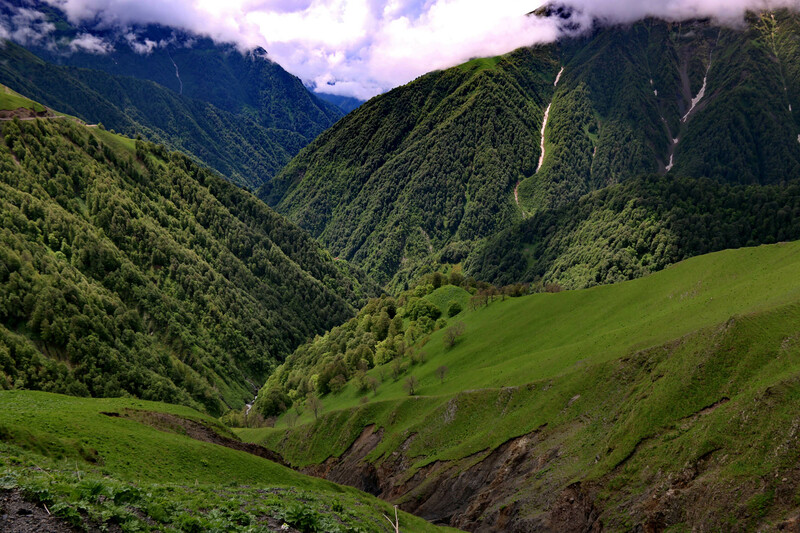 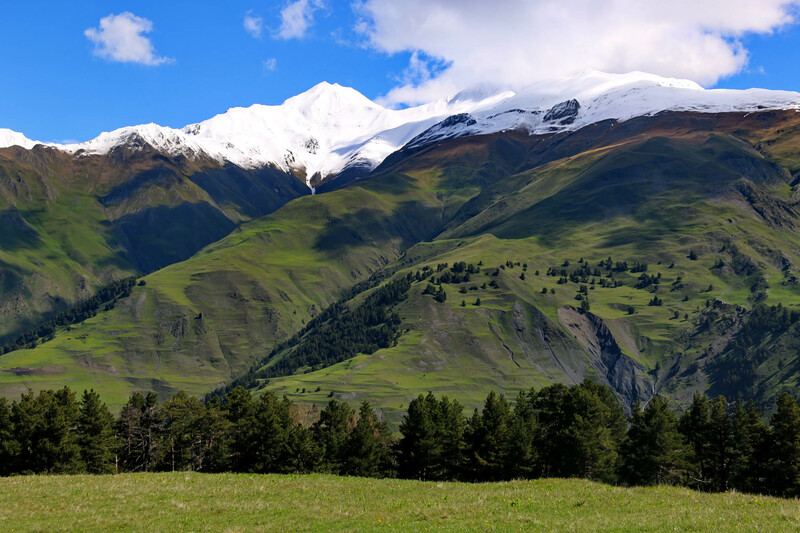 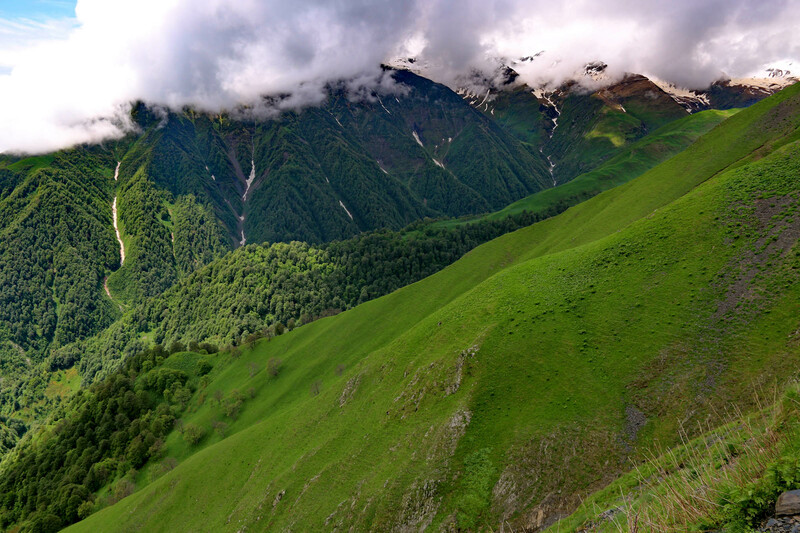 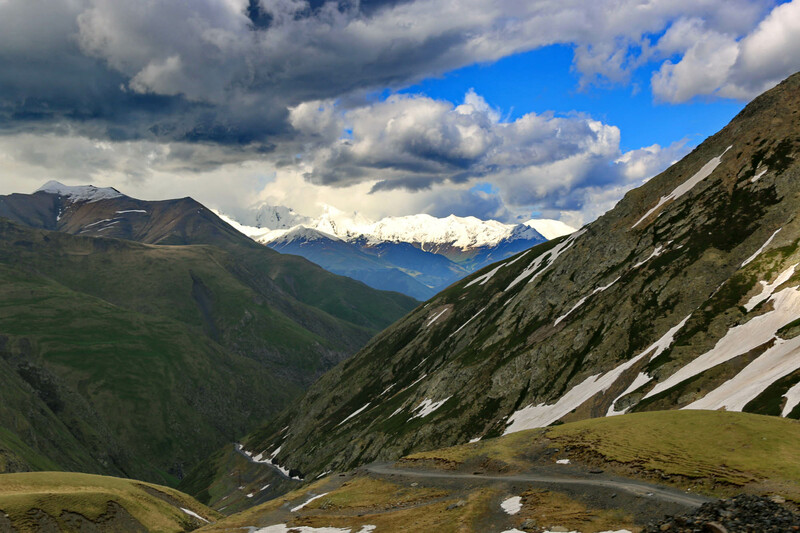 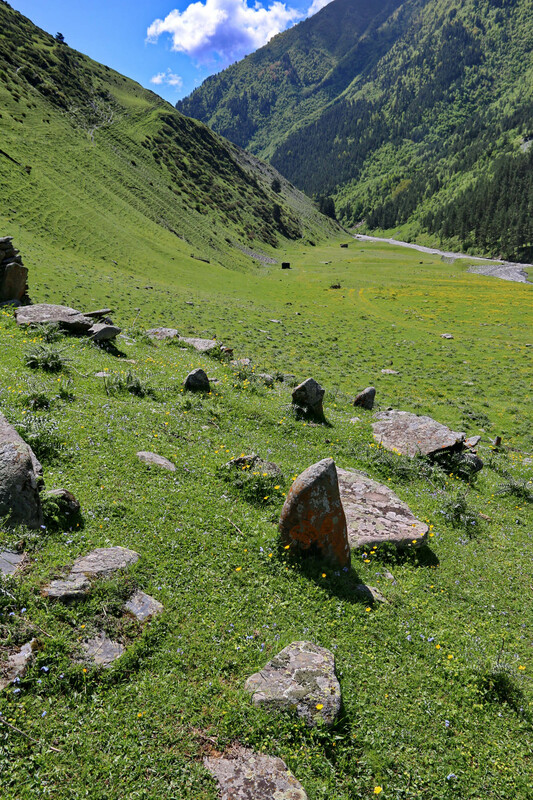 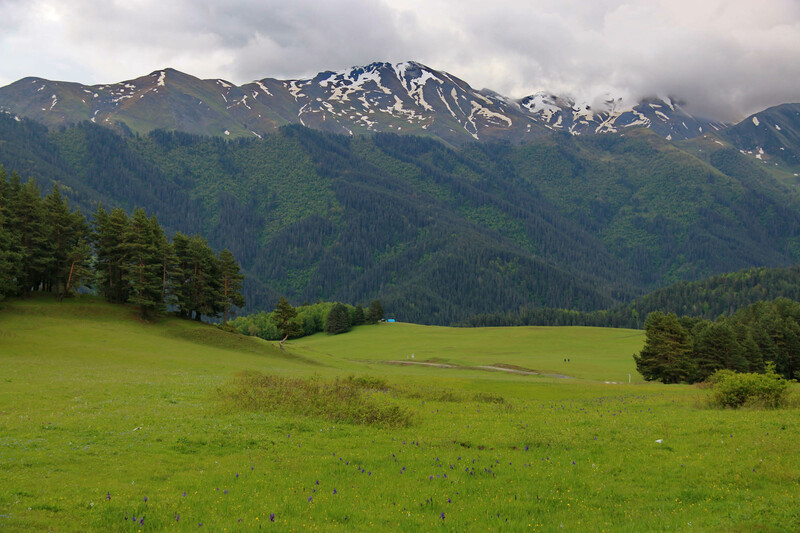 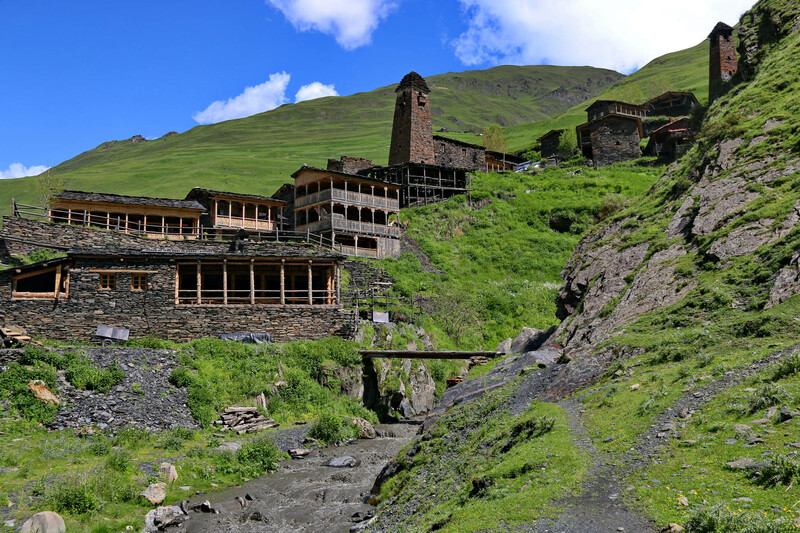 Tusheti is the second highest populated mountain region of today’s Georgia, after Svaneti in the northwest, but it is far more isolated than that. 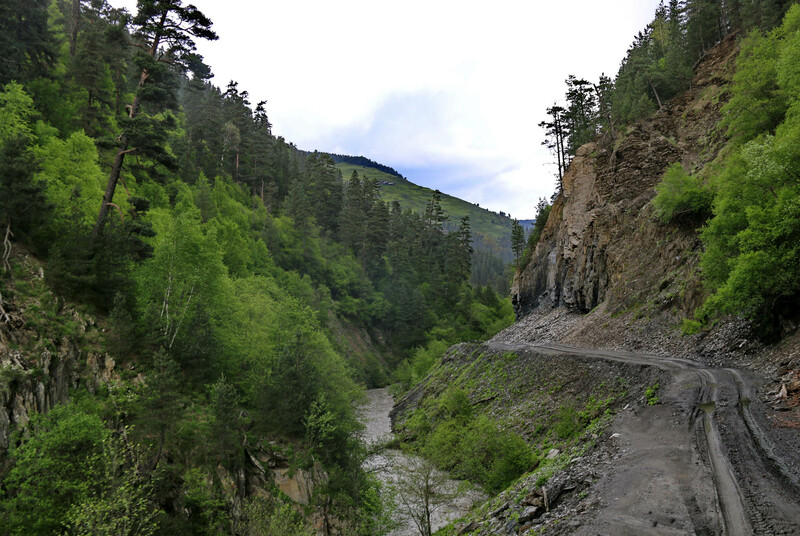 A single road leads up here, the same seventy-kilometer-long dirt road we have just taken, which is only viable between early June and late September, because the pass is covered with snow in the rest of the year. 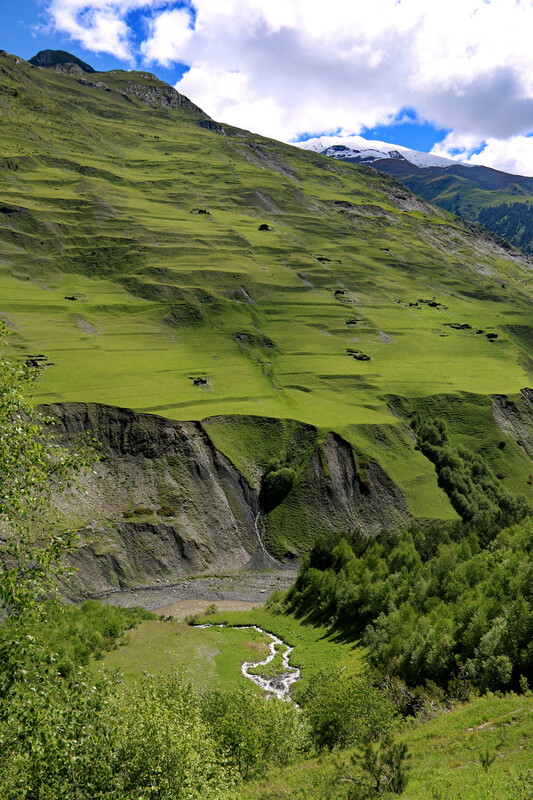 At this time, the landscape turns green, and the plants start a spectacular blossoming to take advantage of the short summer. 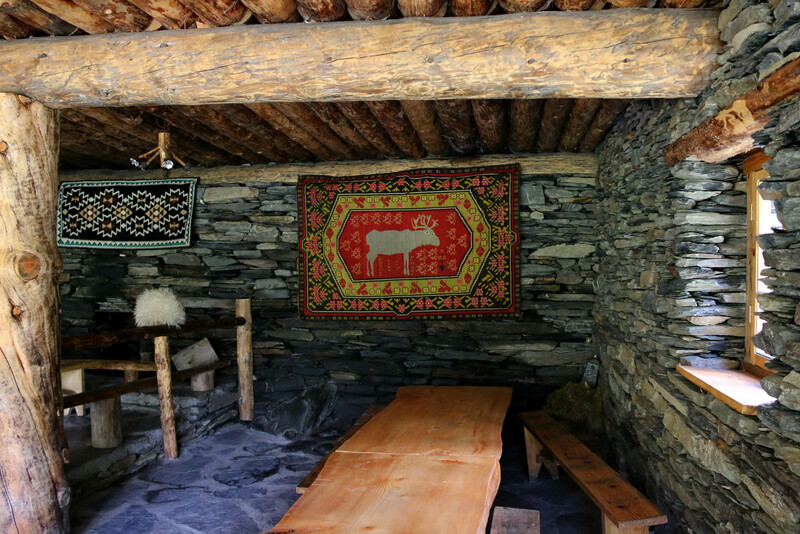 And at this time the inhabitants of Tusheti come up from their villages in the south, along the Alazani river, down to where they have moved in recent decades, to repair their houses, to take over the care of the sheep and cows from the few old men who take care of the animals of all the village during winter, and to offer accommodation to the tourists, who also appear, though not in massive numbers, but more and more boldly, in this archaic area of Georgia. 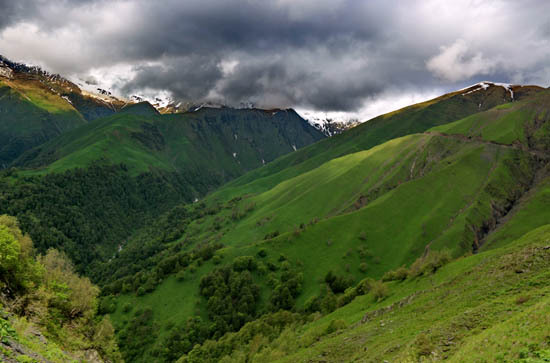 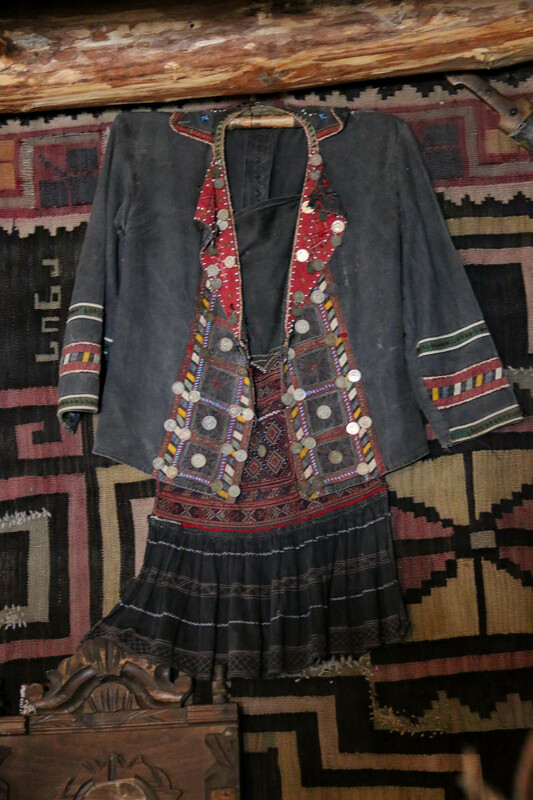 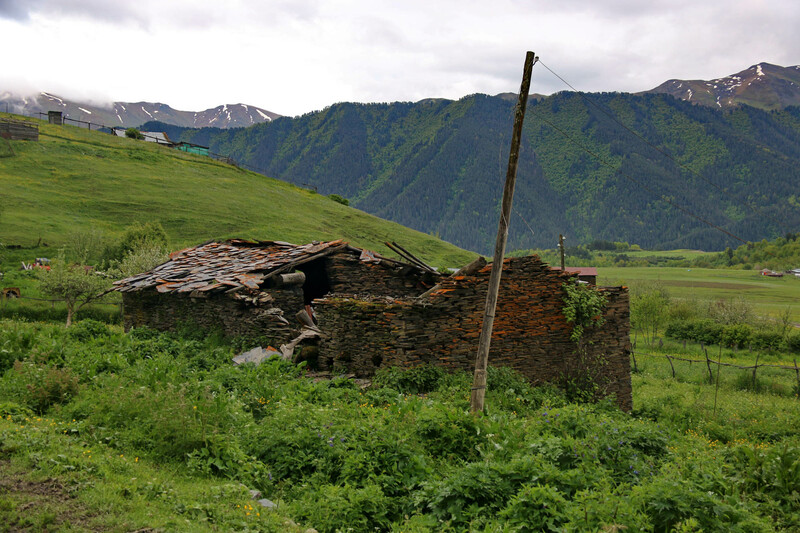 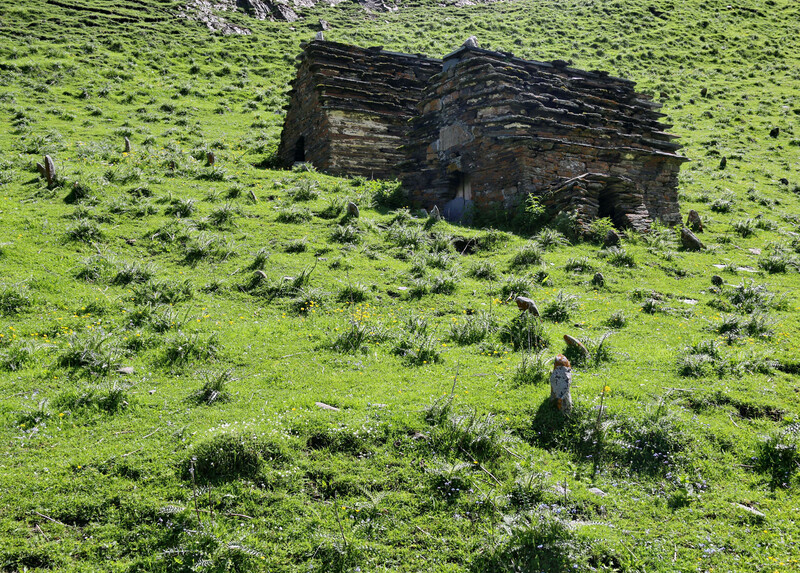 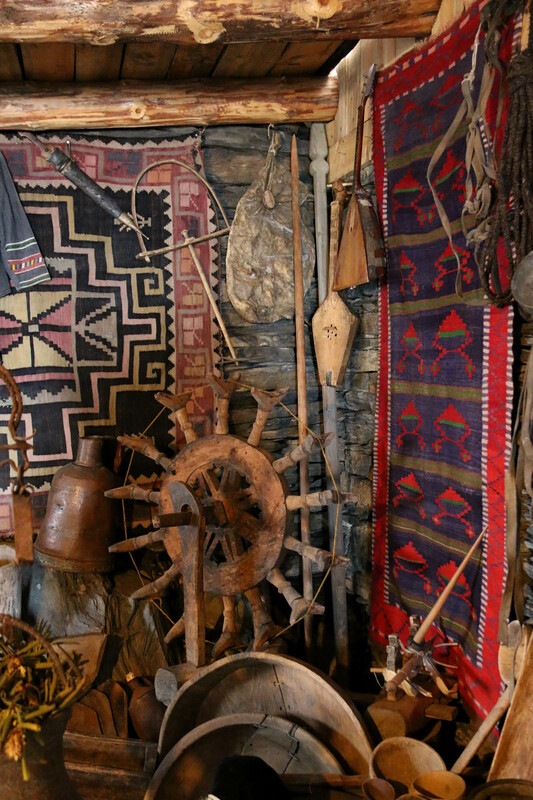 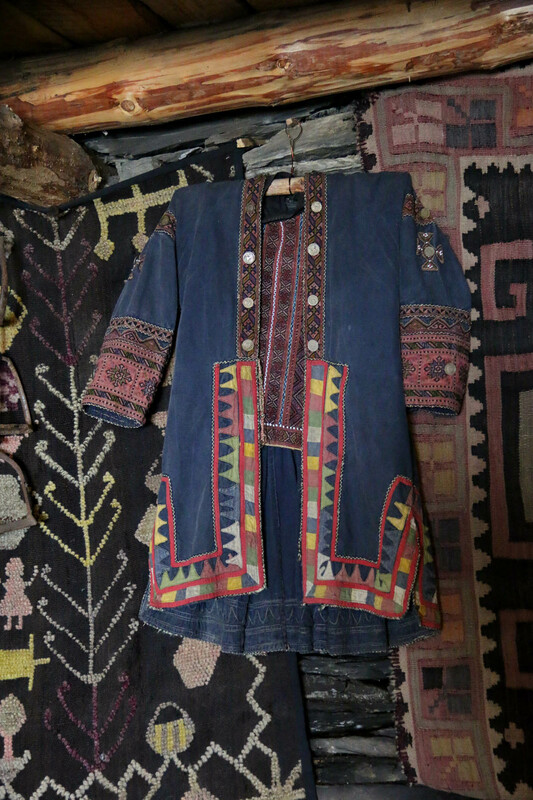 The inhabitants of Tusheti are mostly Kakhetian Georgians speaking an ancient Georgian dialect, who, in their own tradition, fled here to the north from the Christianization of Georgia around the 4th century. 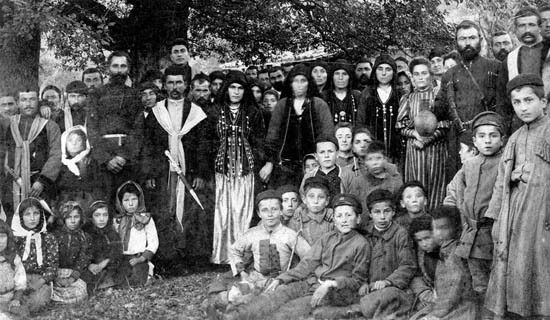 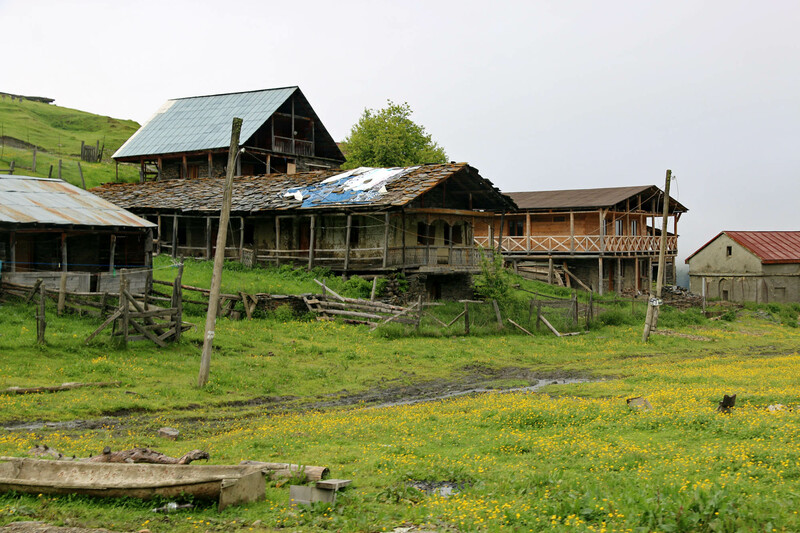 The other part of them, the Bats tribe, which speaks a language related to Chechen and Ingush, fled here to the south from the Islamization on the northern side of the Caucasus in the 16th century. Today both peoples are nominally Orthodox Christian, but the first church just recently opened in the valley, and the pre-Christian animistic religious traditions are still very fresh. 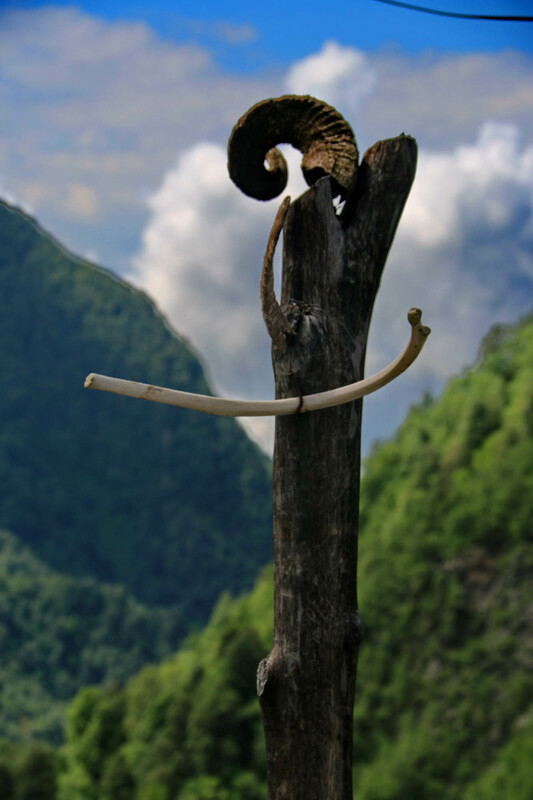 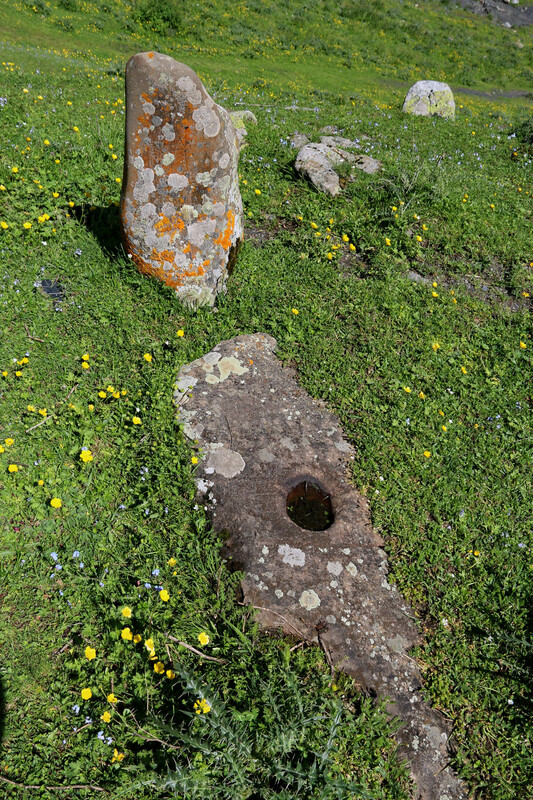 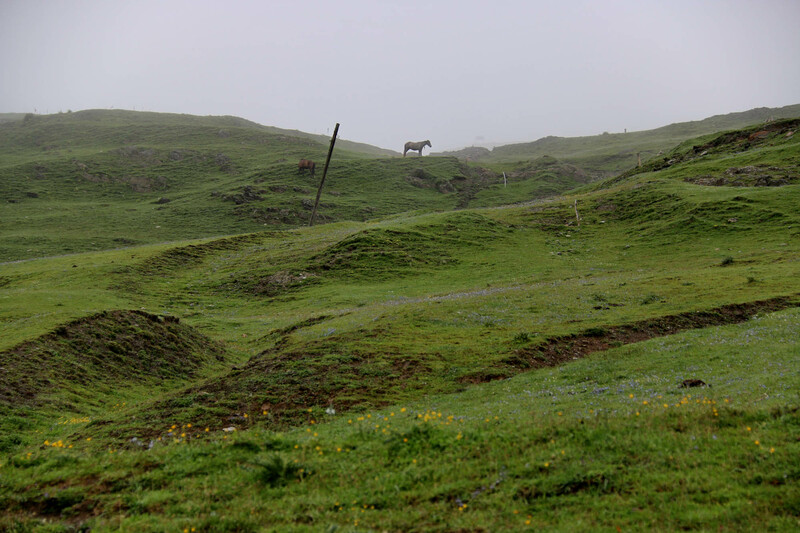 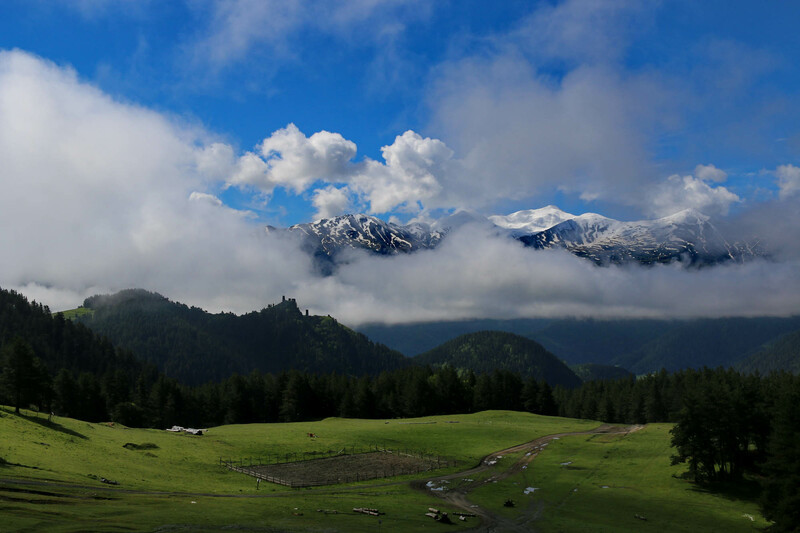 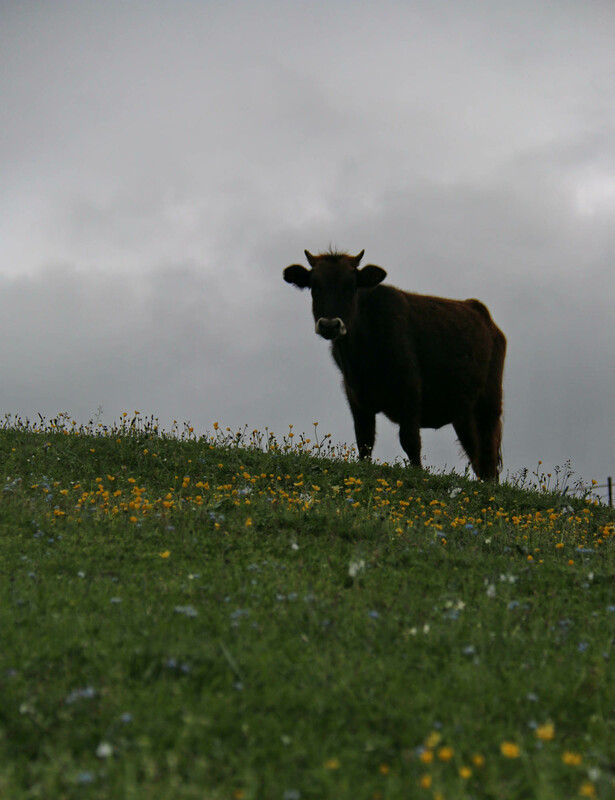 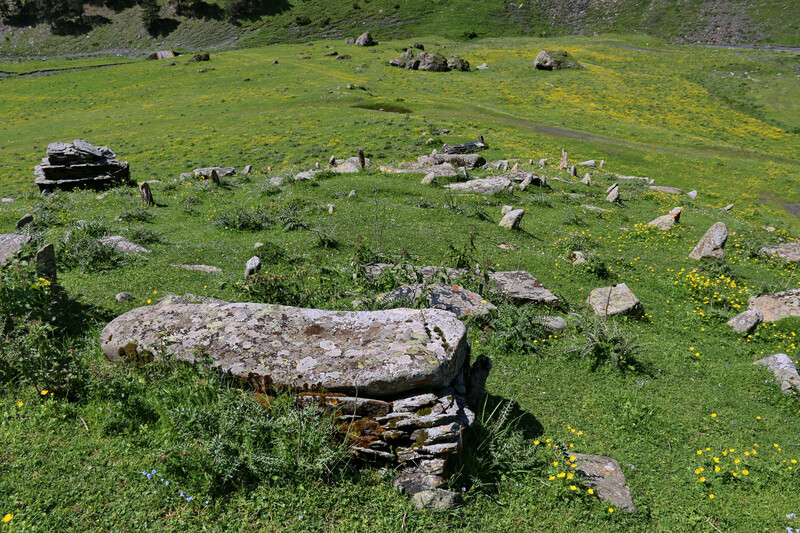 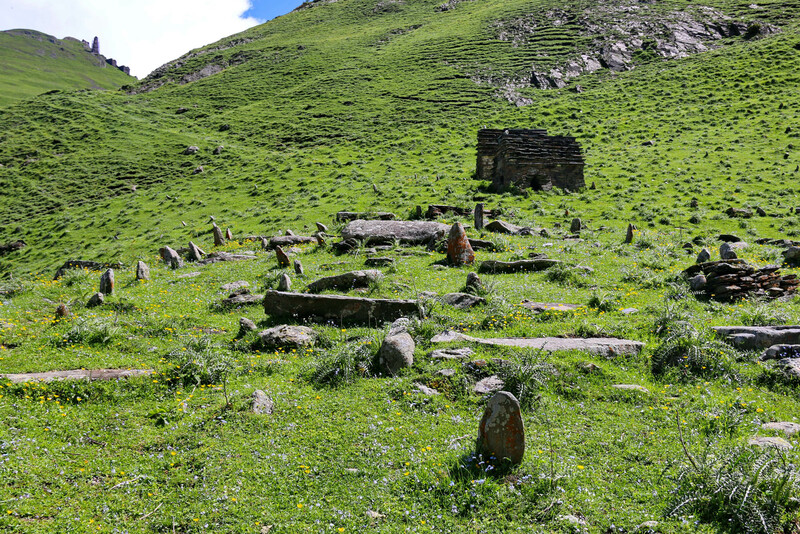 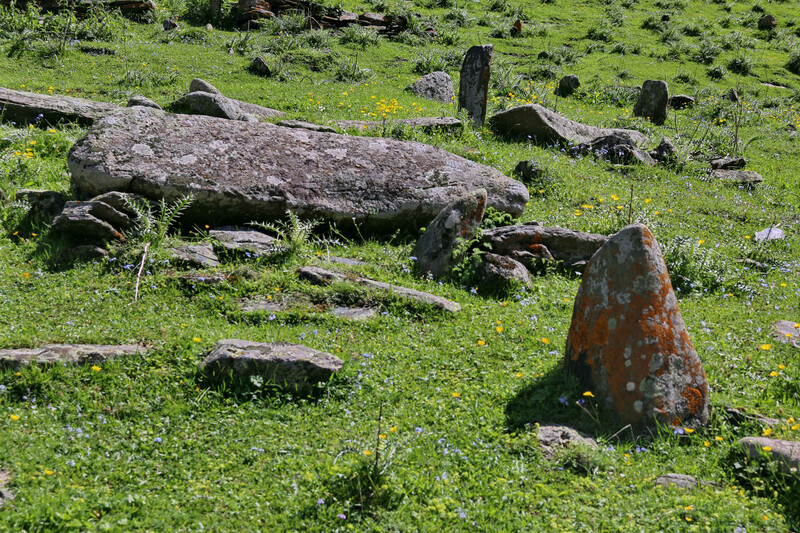 The borders of the inhabited areas are designated with sacred ram horn columns, and there are fenced meadows around every village, where the men gather for fertility rituals. 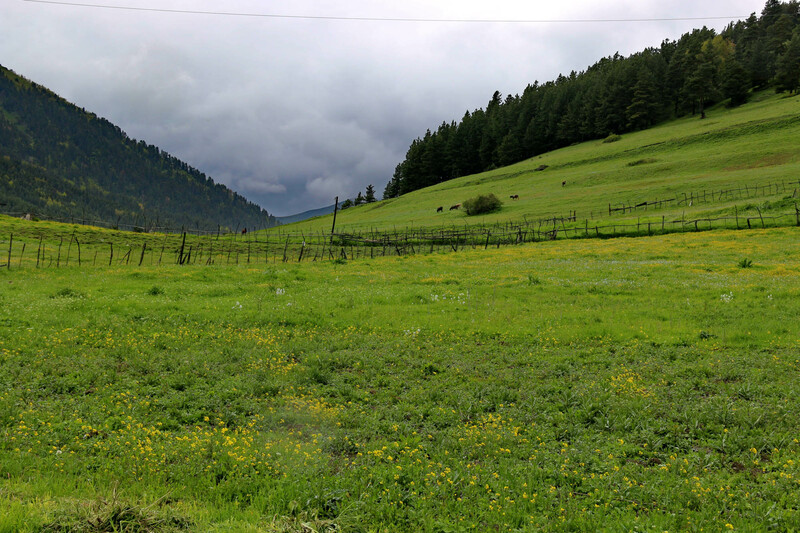 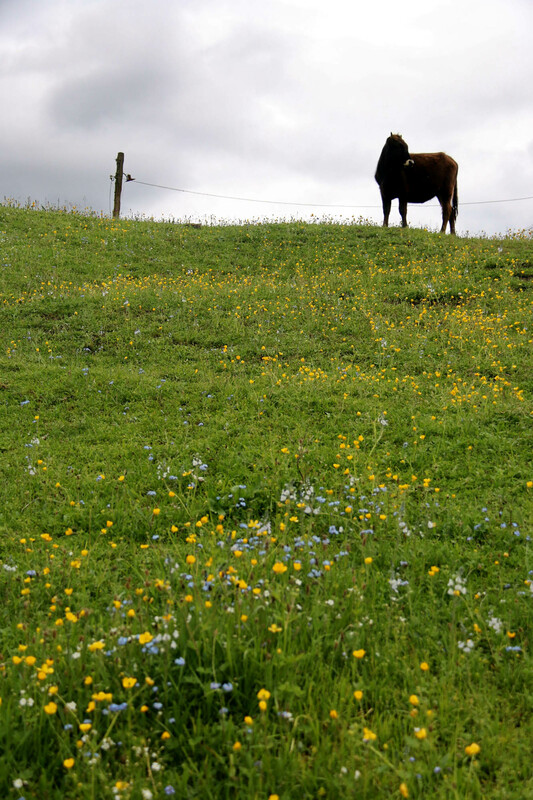 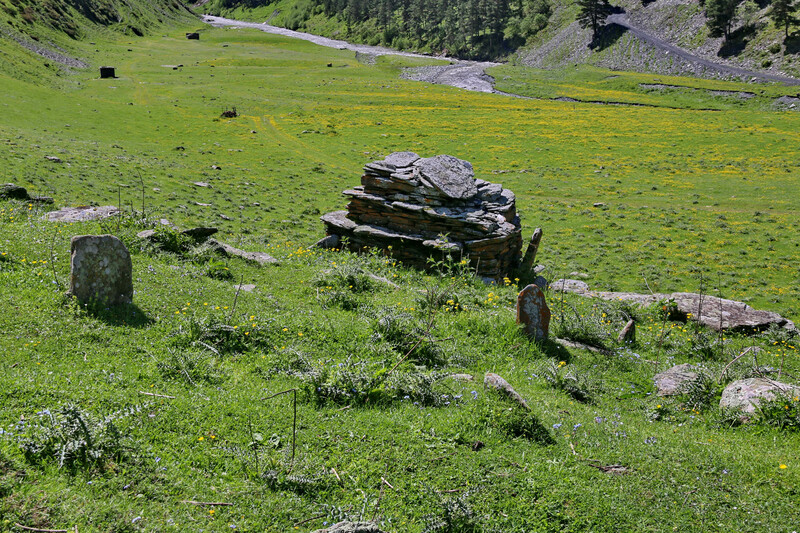 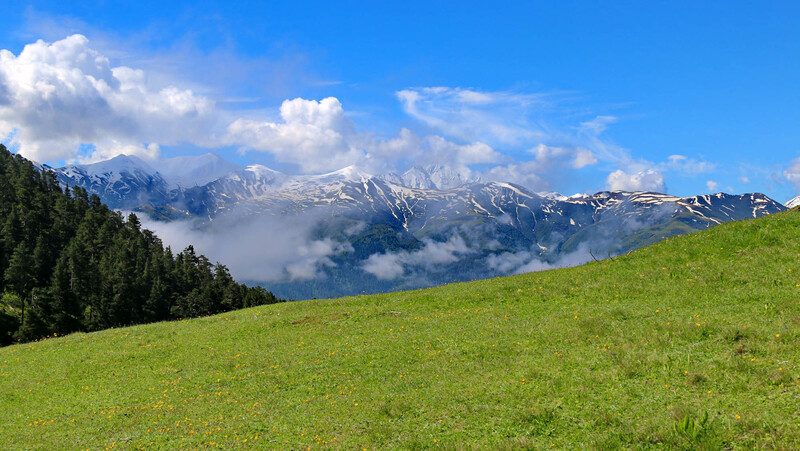 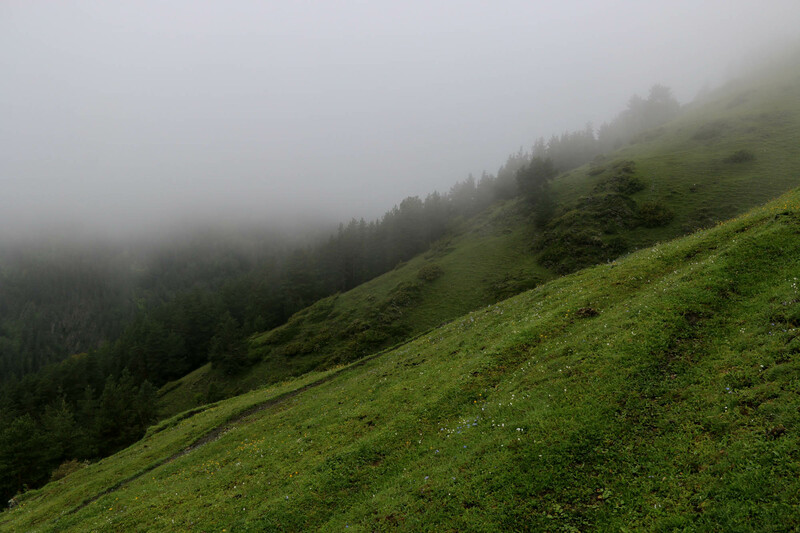 In summer it is the task of small children playing near these meadows to warn women tourists not to enter the sacred area, because the presence of women will break its power. 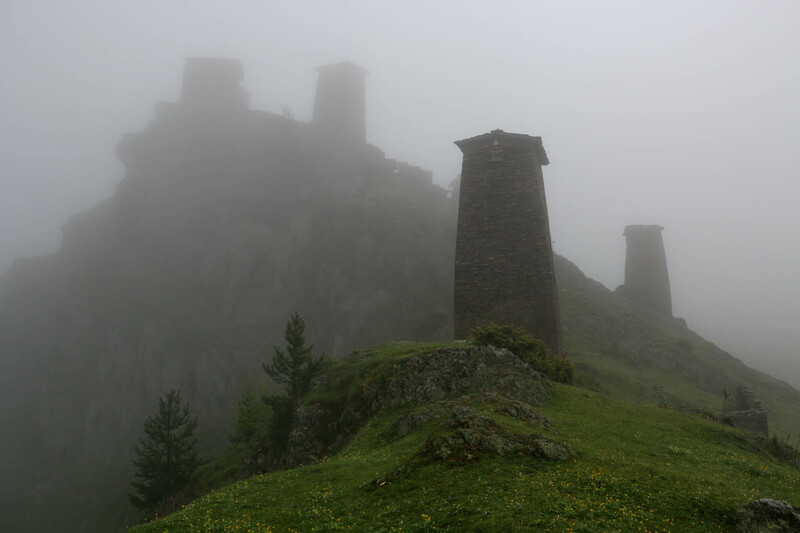 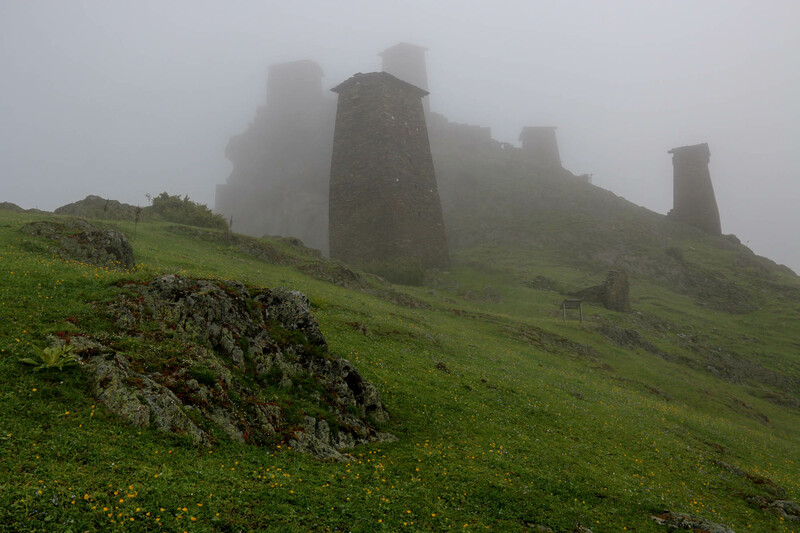 The central town of the valley is Omalo, a loose ensemble of centuries-old farmsteads around the five-towered castle of Keselo. 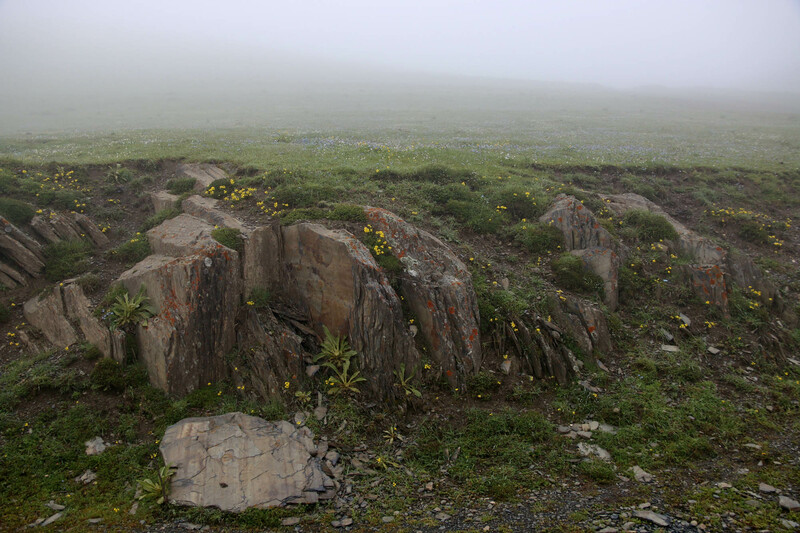 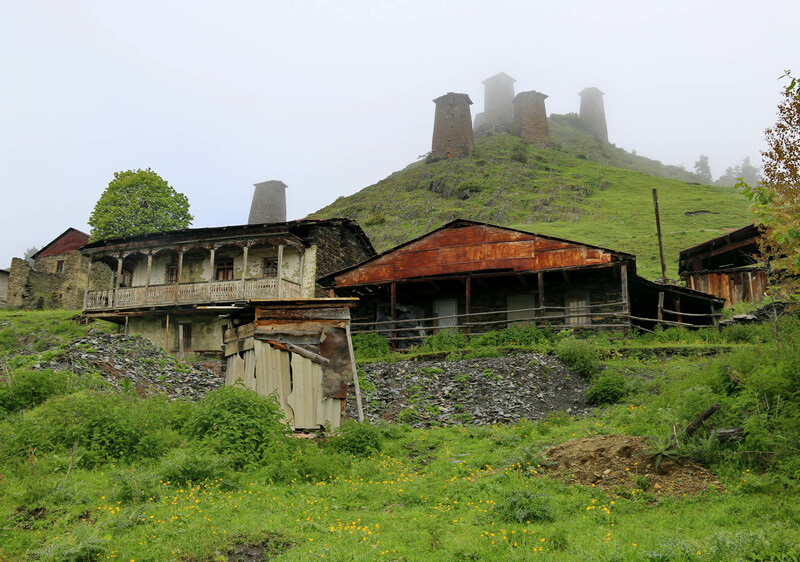 The fortress, which rises impressively below the white ridge of the Dagestani border mountains, had even resisted the assault of the Mongolian army. 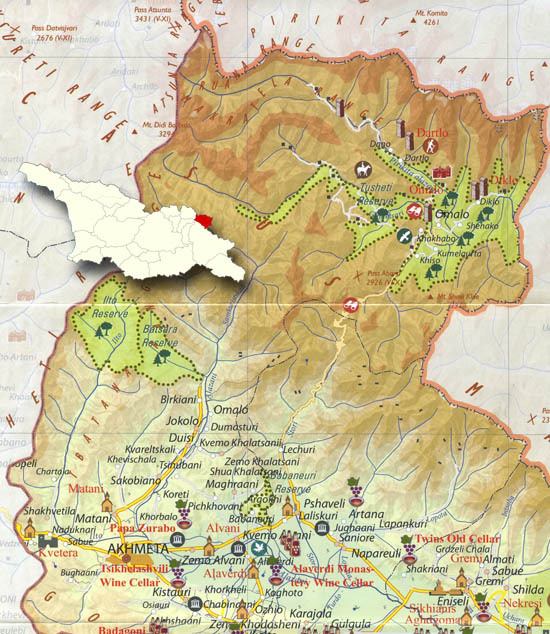 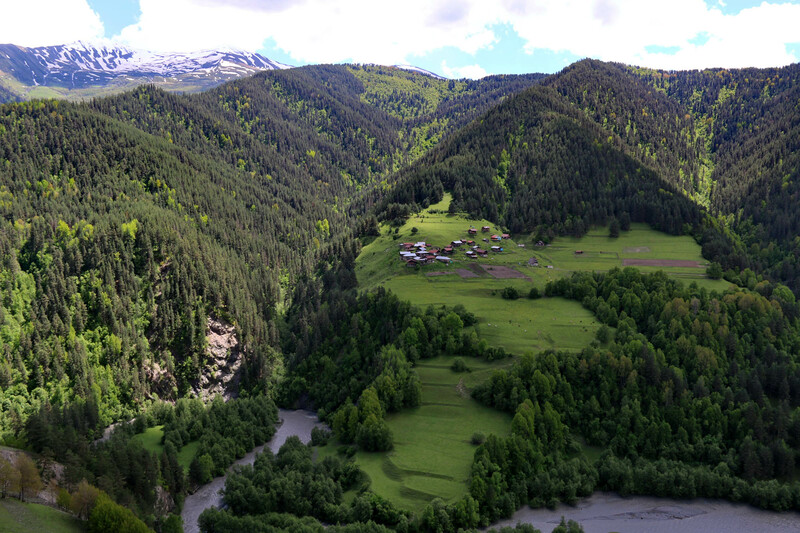 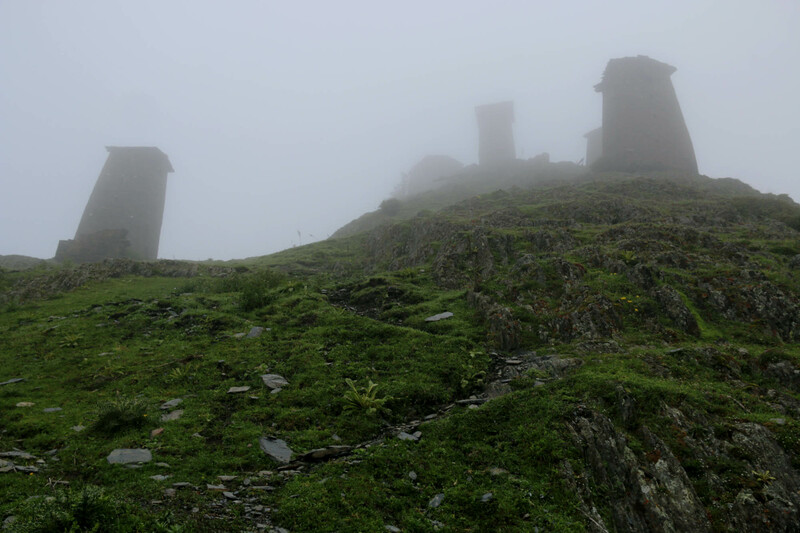 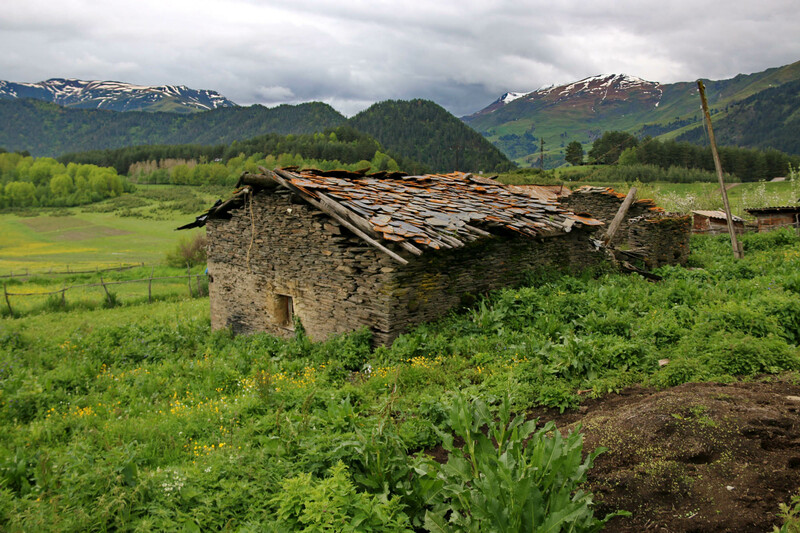 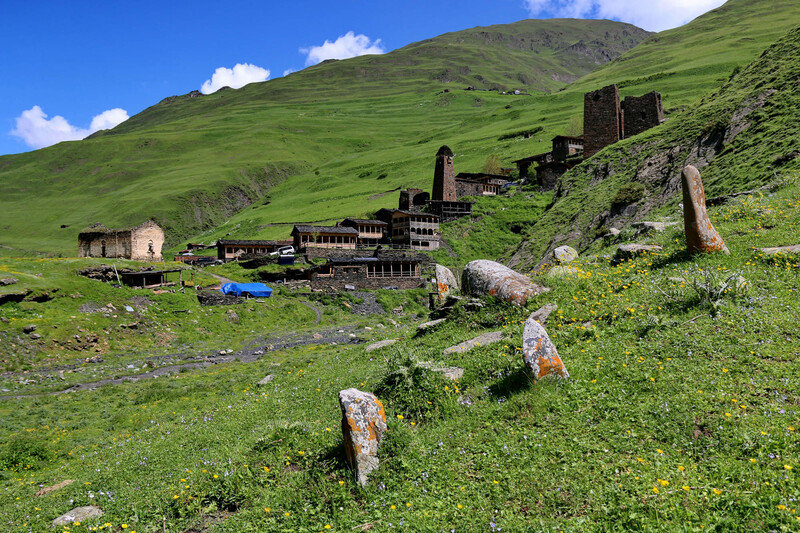 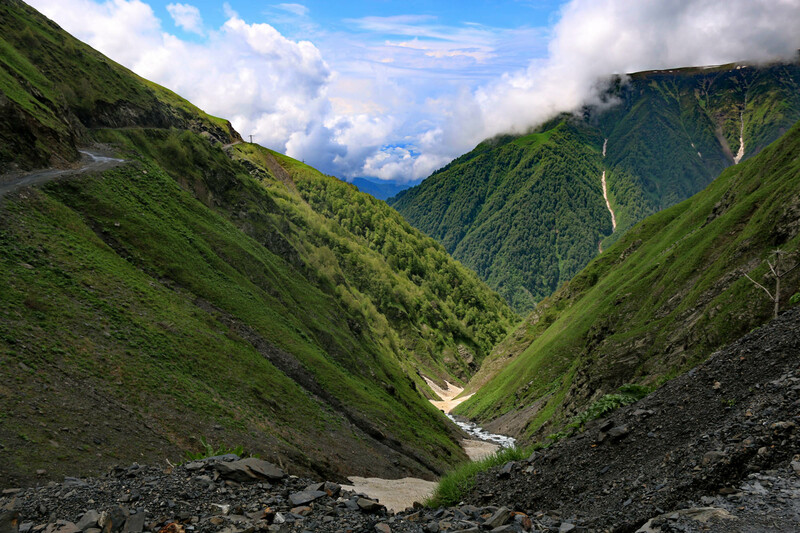 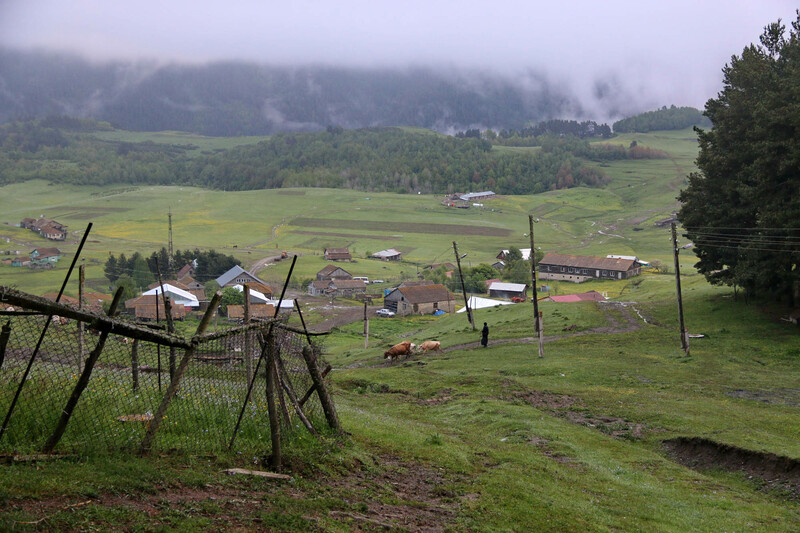 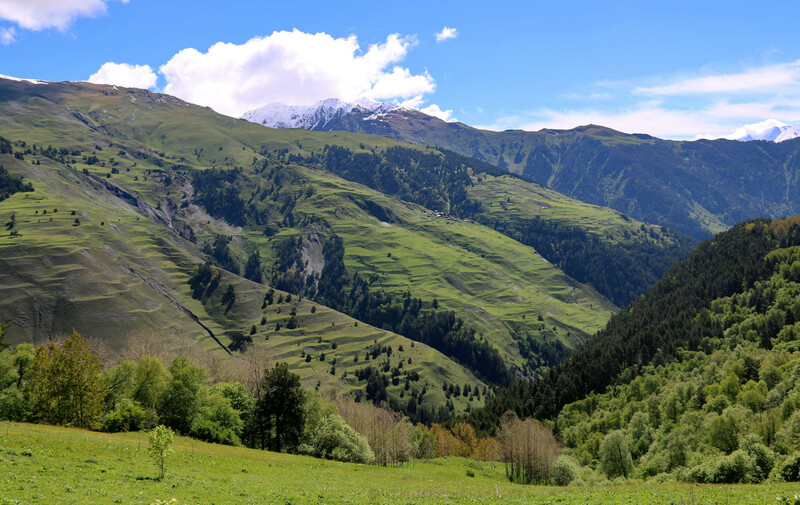 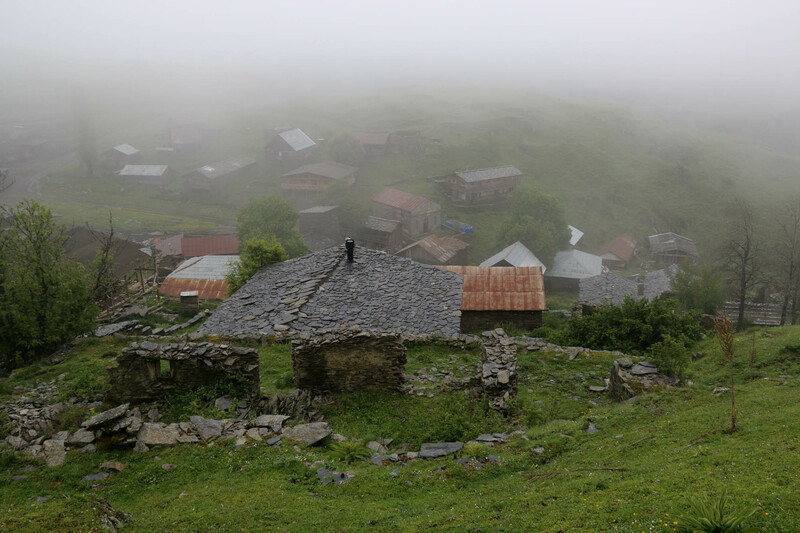 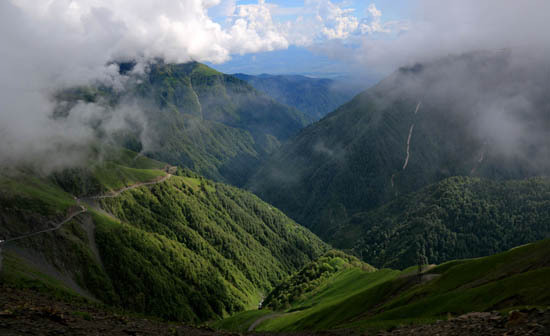 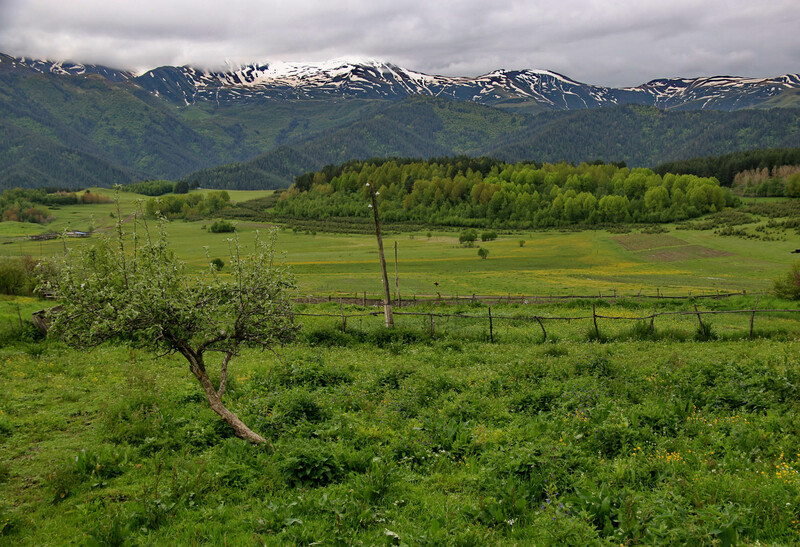 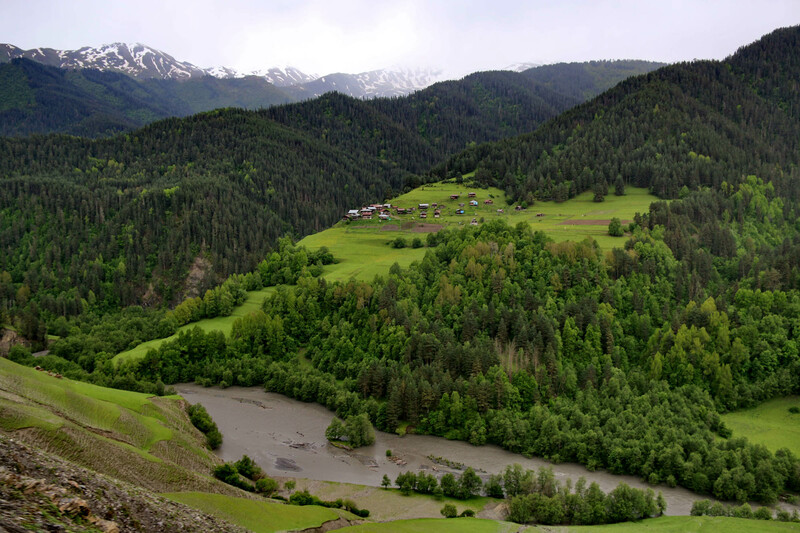 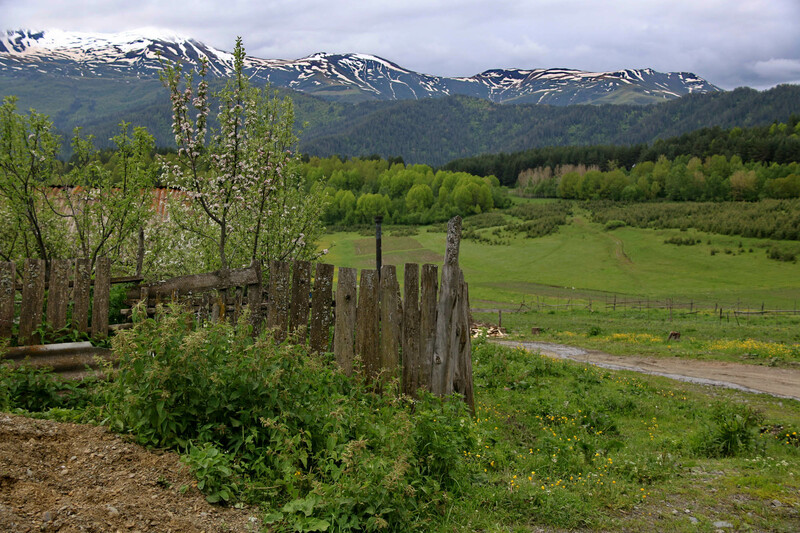 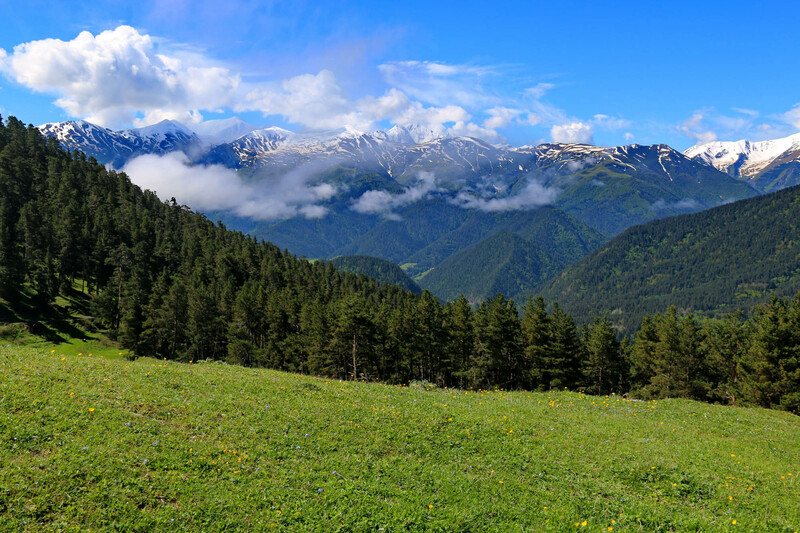 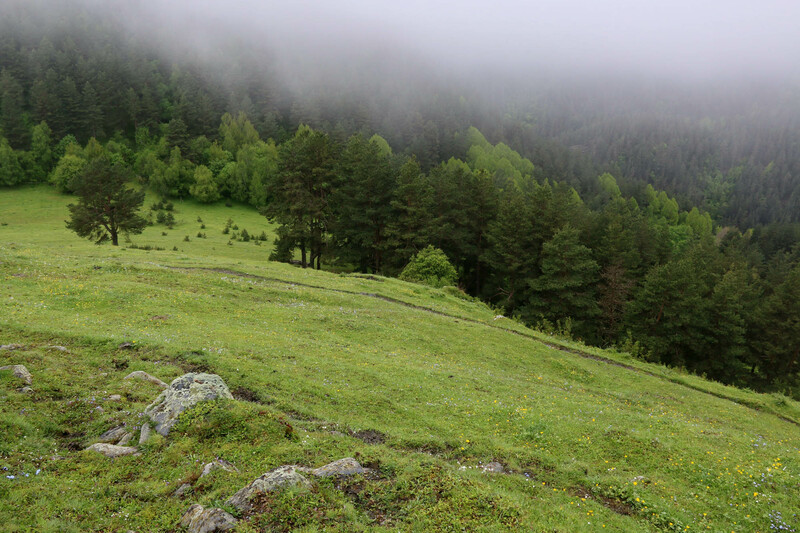 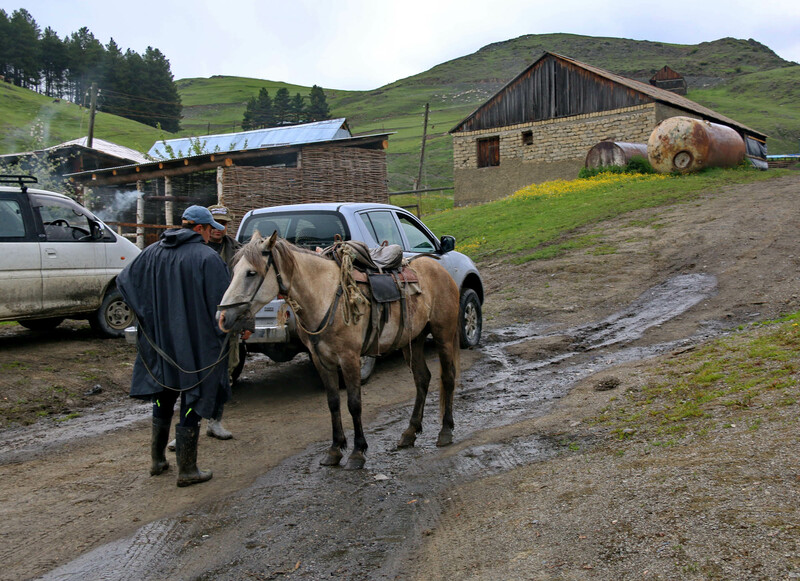 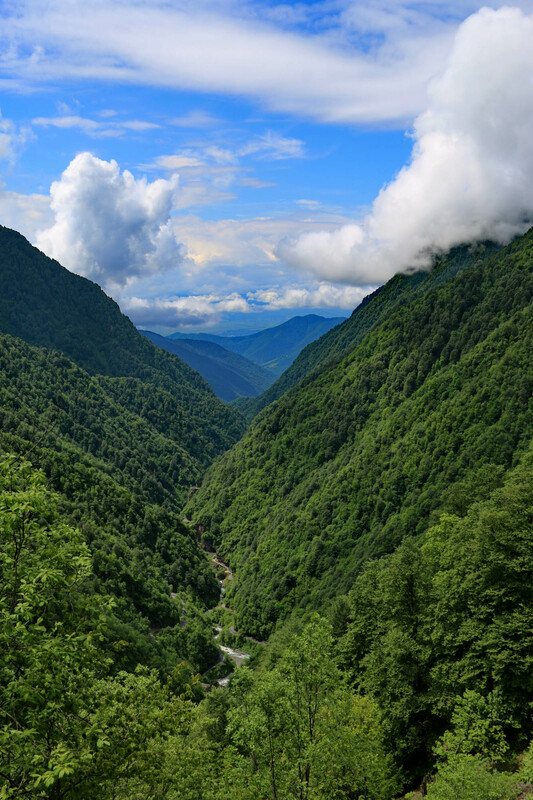 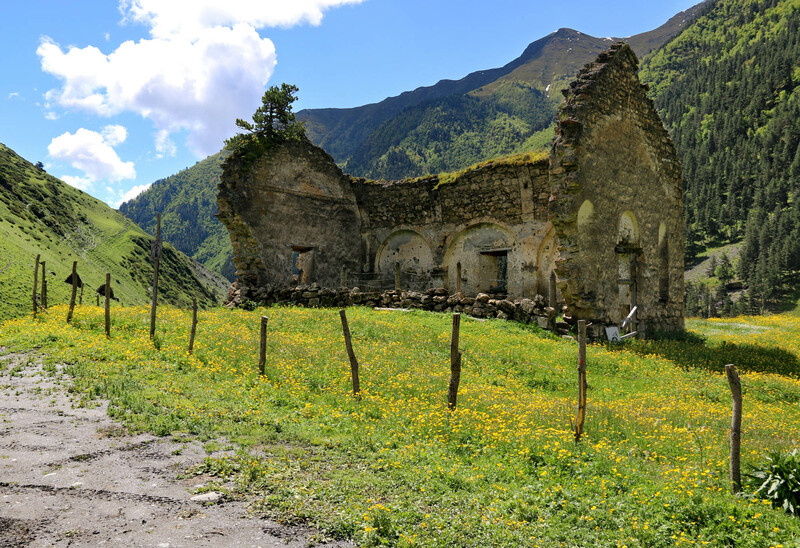 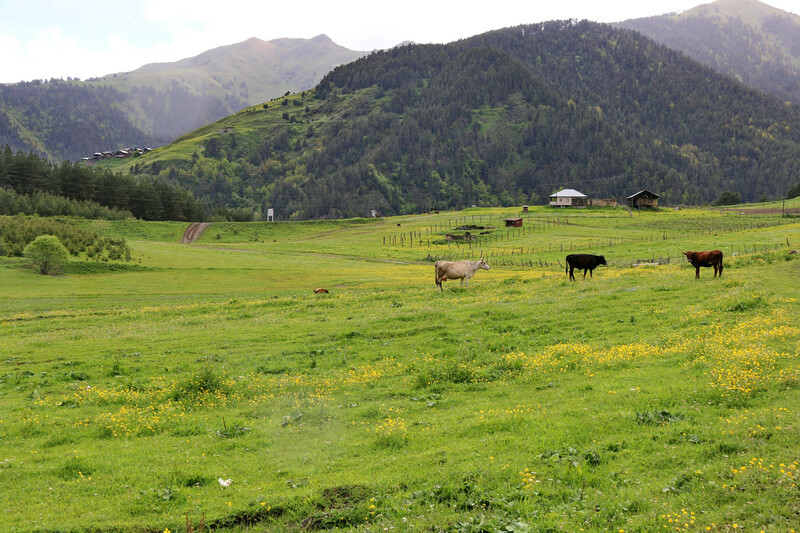 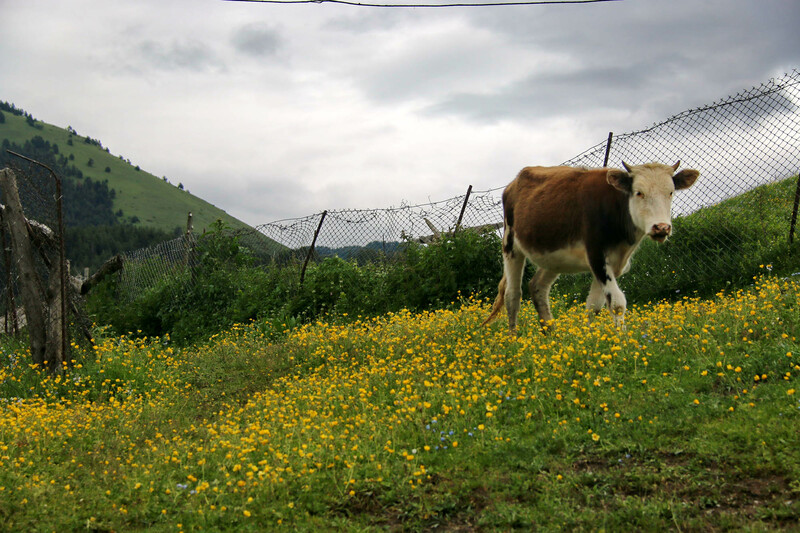 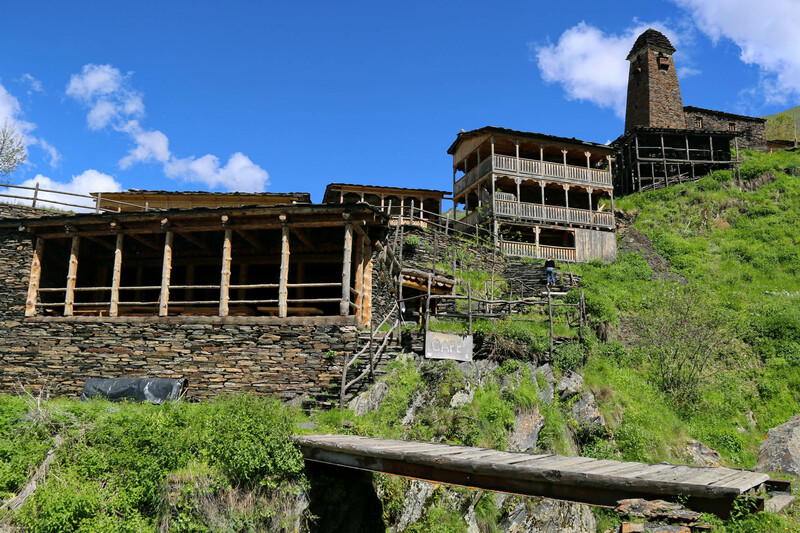 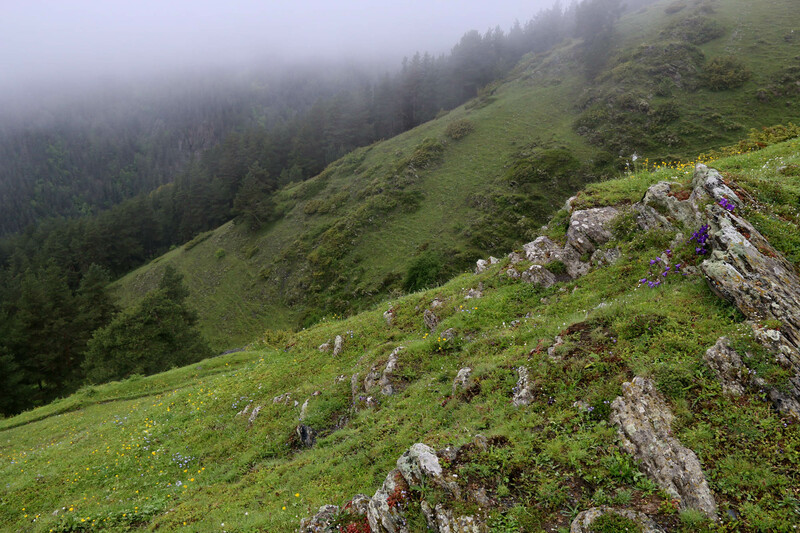 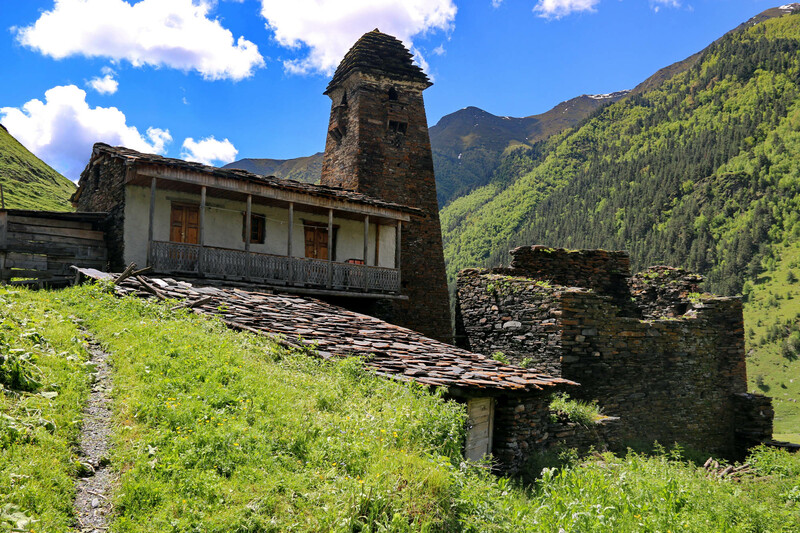 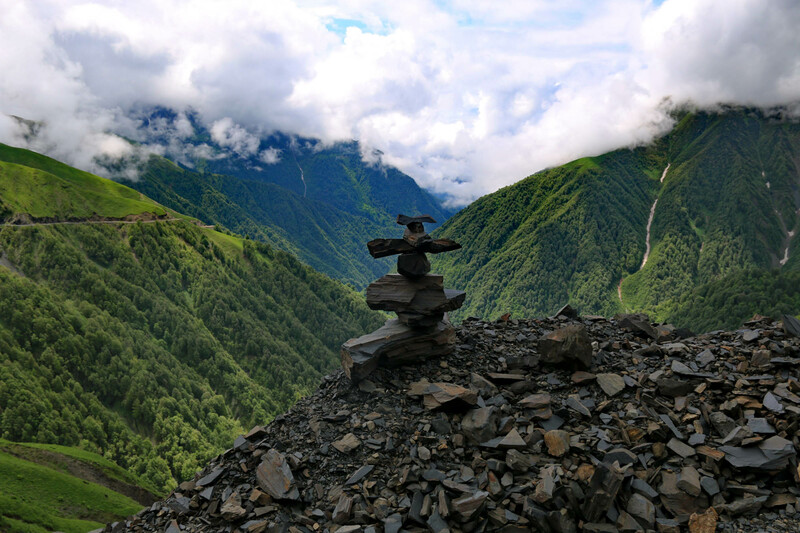 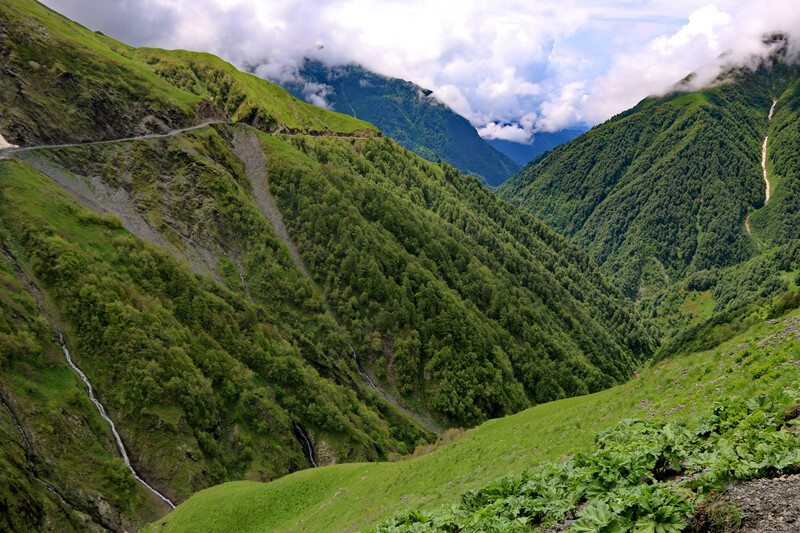 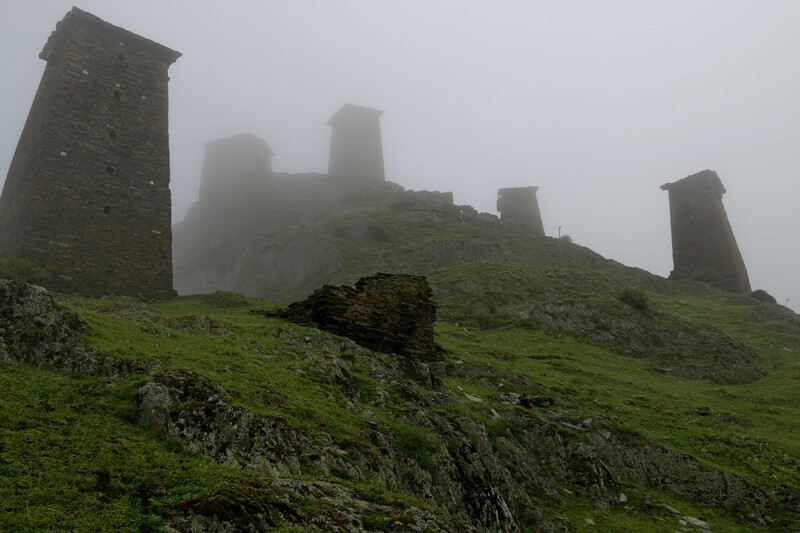 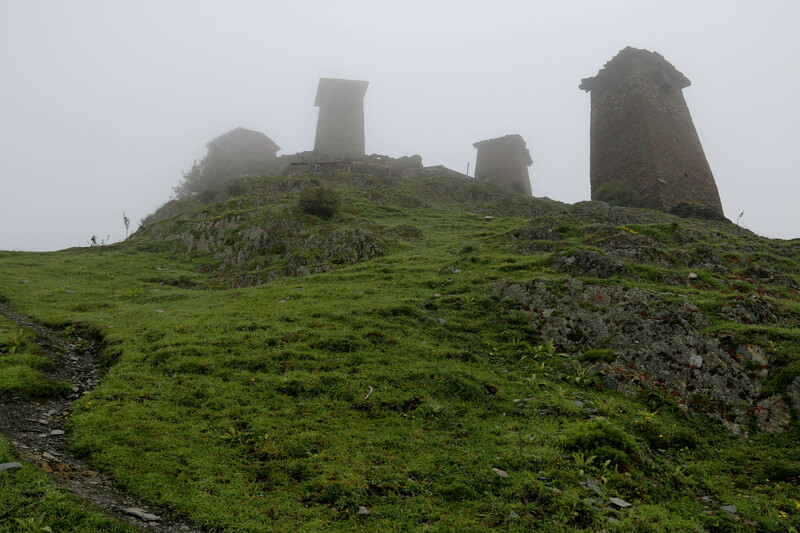 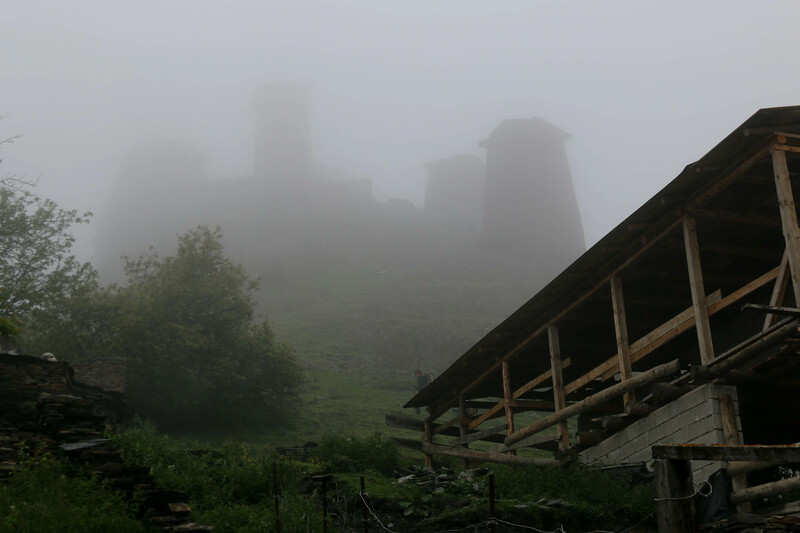 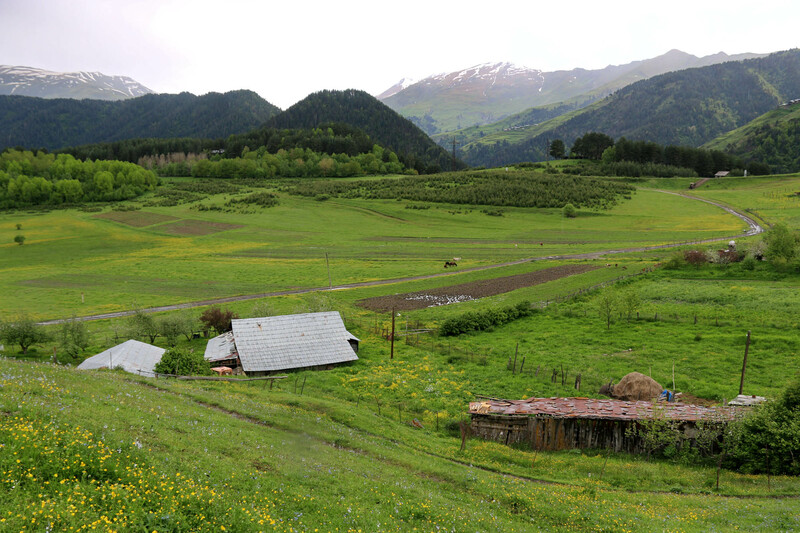 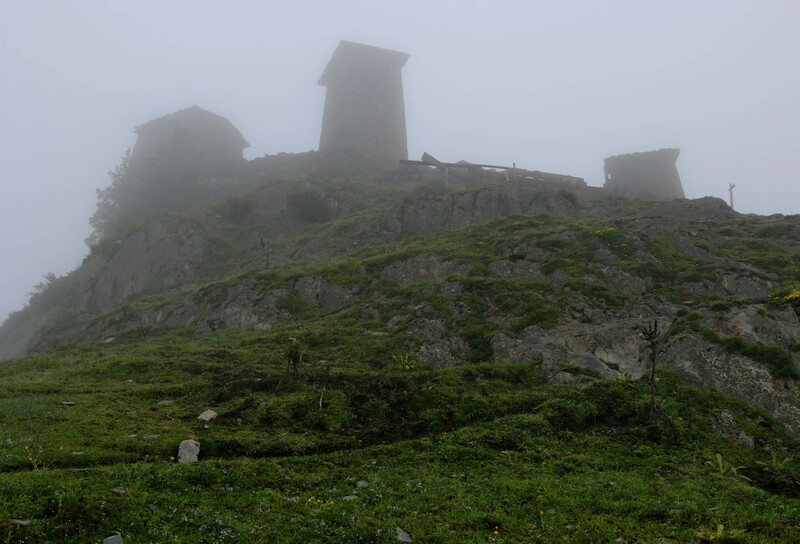 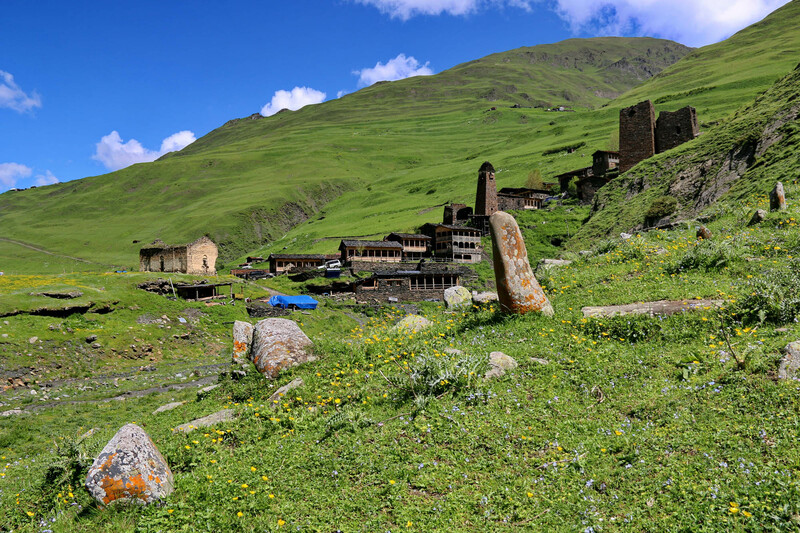 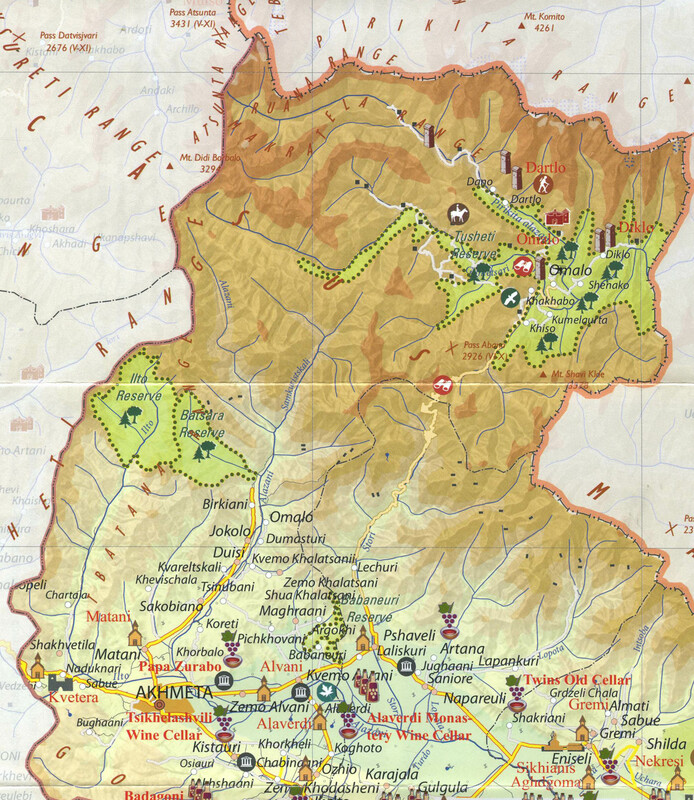 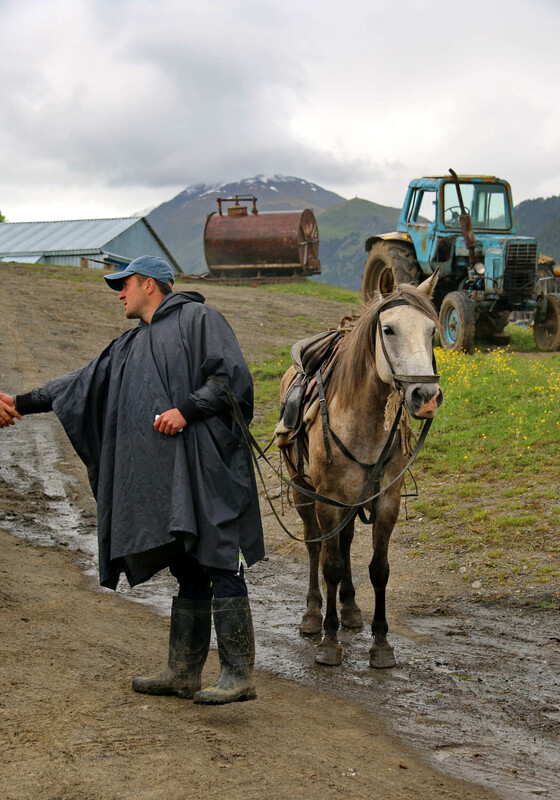 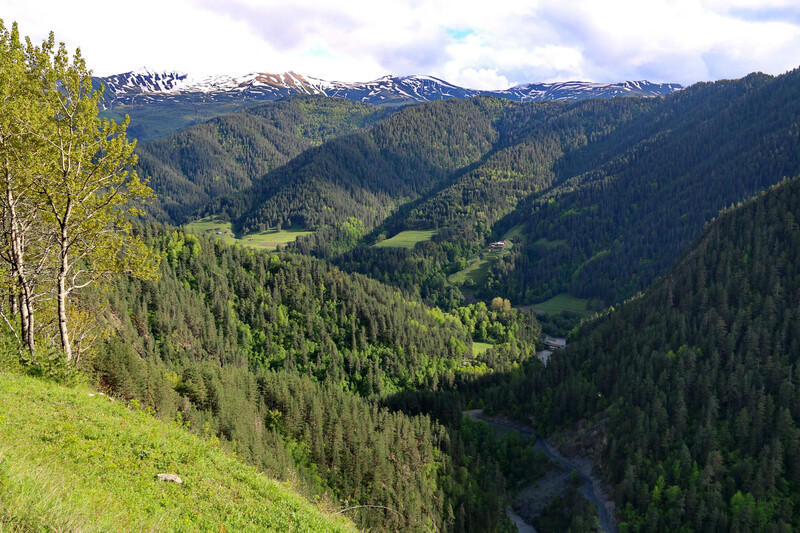 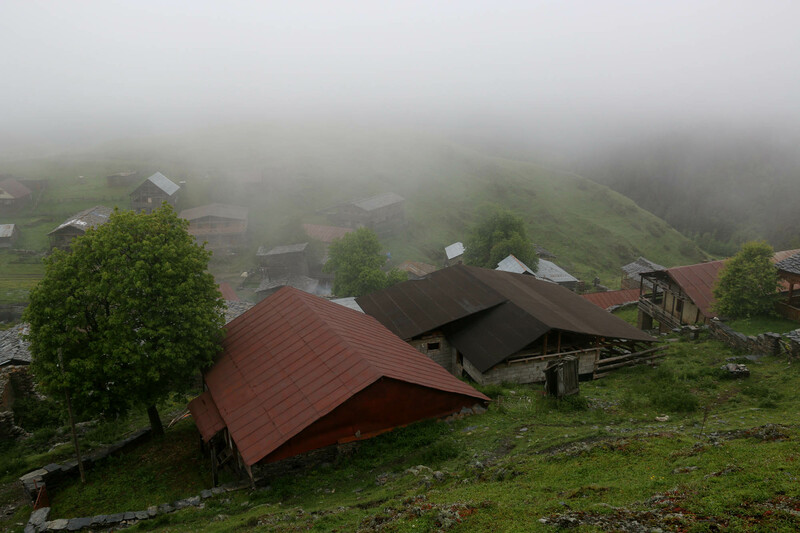 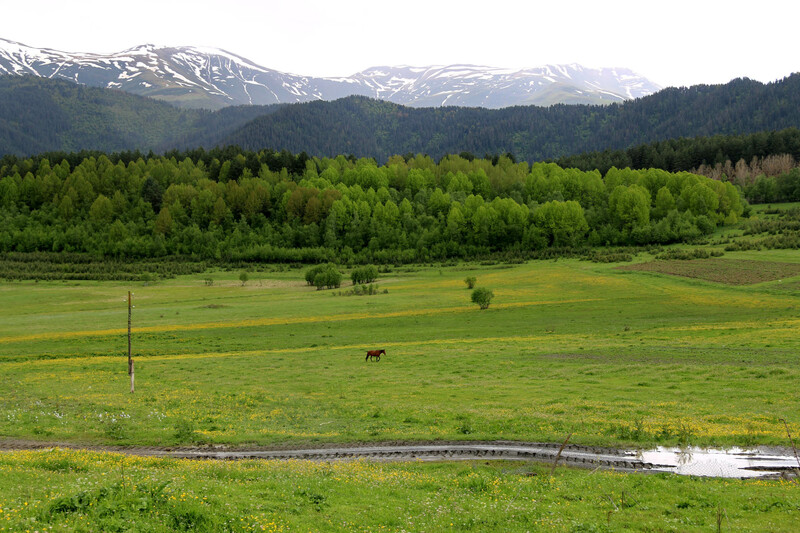 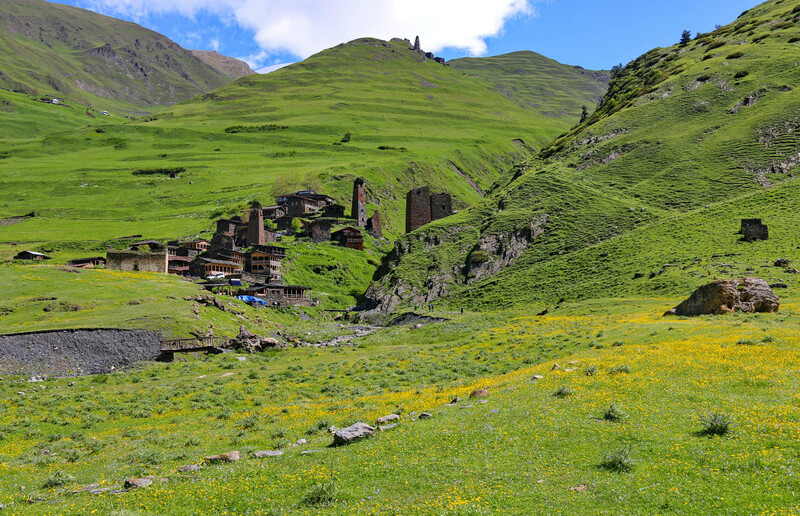 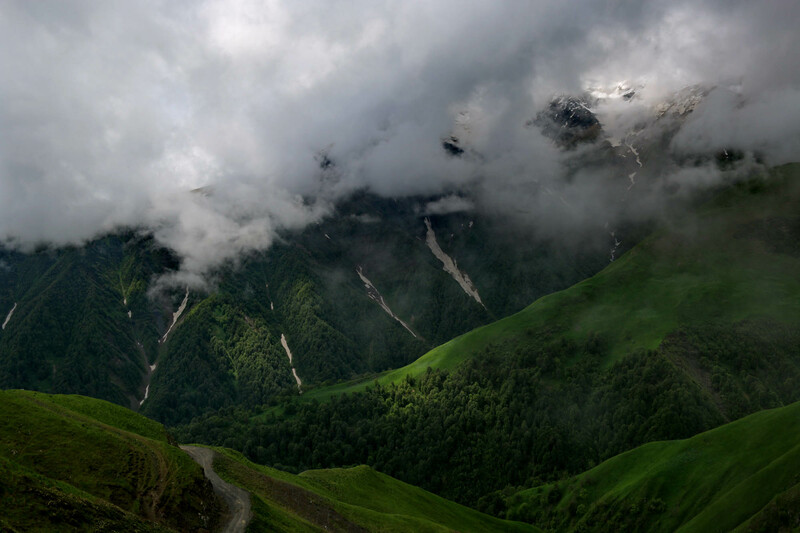 The other center of Tusheti, the medieval village of Dartlo, is fifteen kilometers away, about an hour by four-wheel drive, to the west of Omalo in the valley of Pirikita Alazani river. 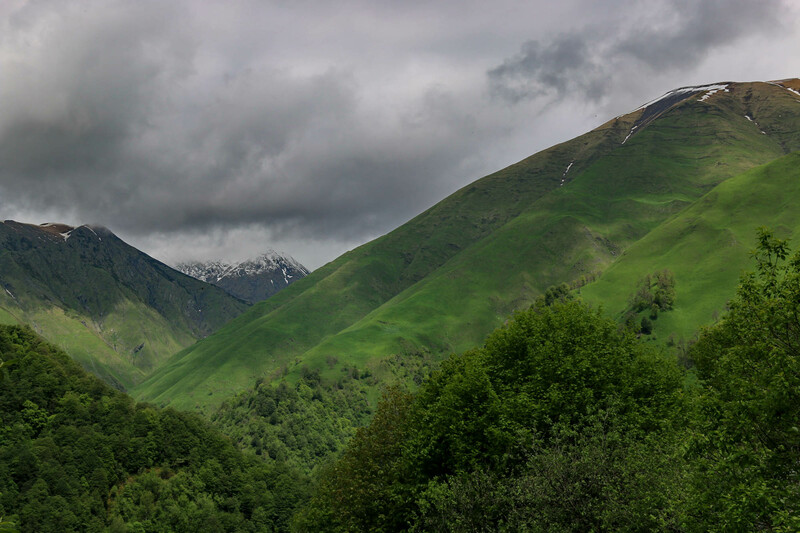 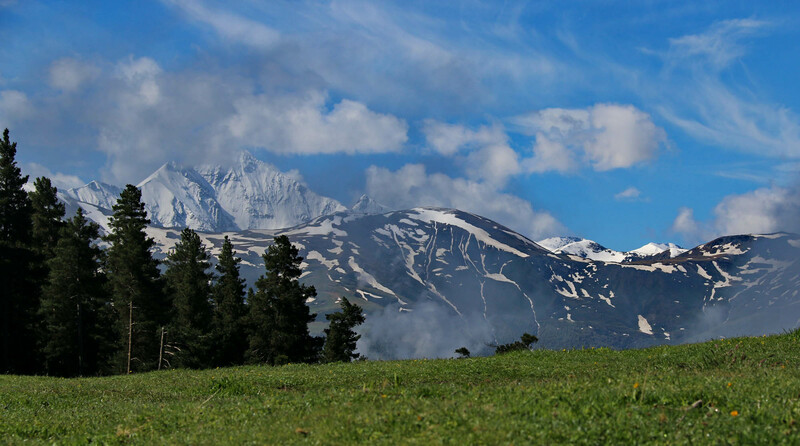 Above the village rises the 4300-meter-high Mount Dartlo, on whose peak the Chechen, Dagestani and Georgian triple border meets, and through whose passes the Dagestani robbers invaded Georgia for centuries. 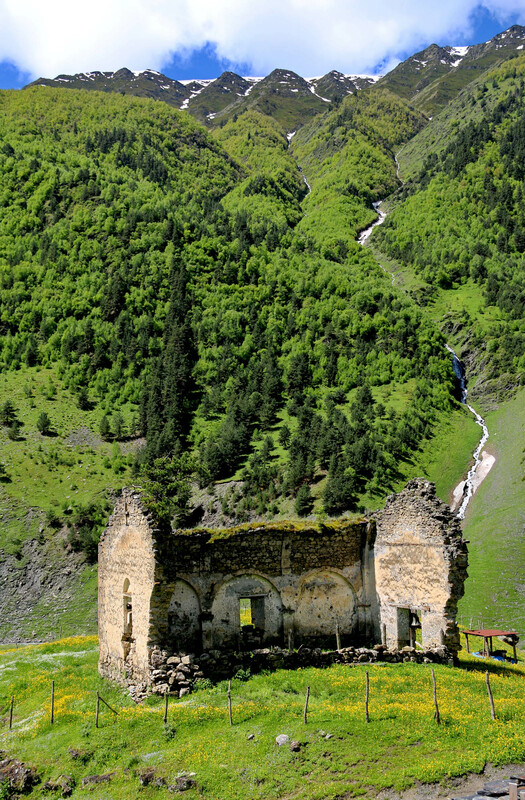 Against them they built the fortress of Dartlo and the watchtowers of the village houses, which imitate the style of the enemy, the structure of the upward tapering, conical-topped Chechen and Ingush watchtowers on the northern side of the Caucasus, rather than the straight-walled Georgian towers of Svaneti. 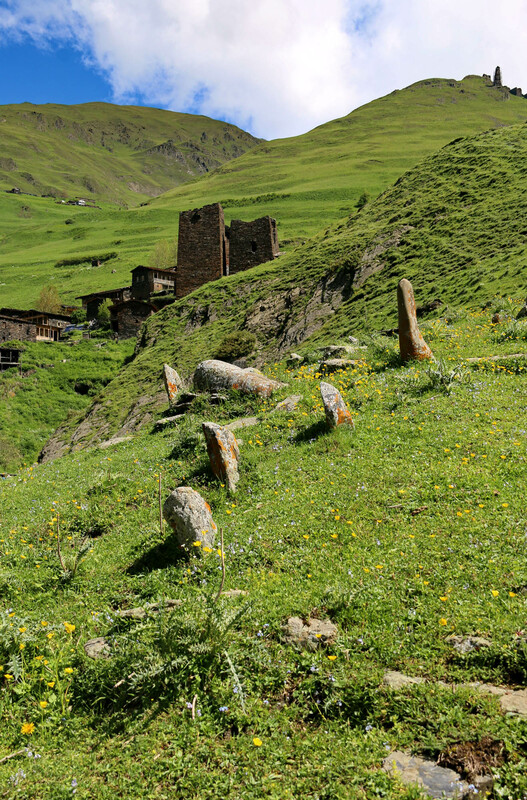 Next to the village, beyond the creek, so the dead may not mix with the living, lies the cemetery, where the graves are designated only with unmarked stones, according to the ancient Caucasian custom. 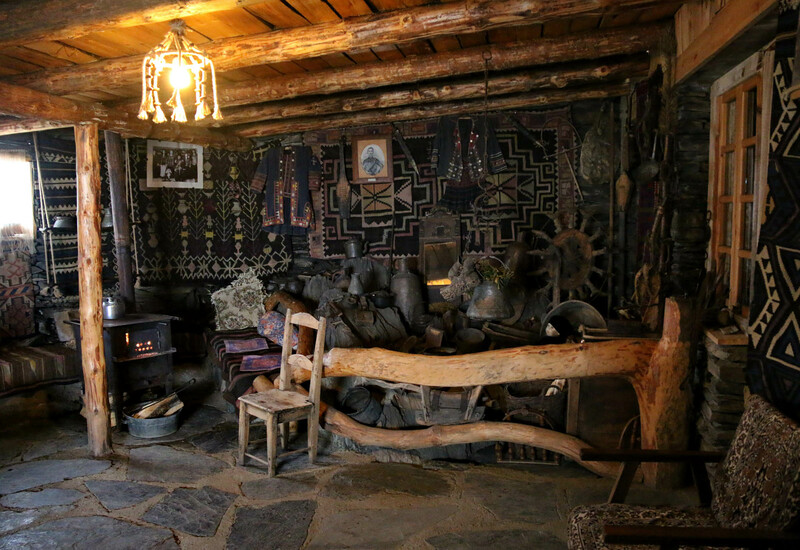 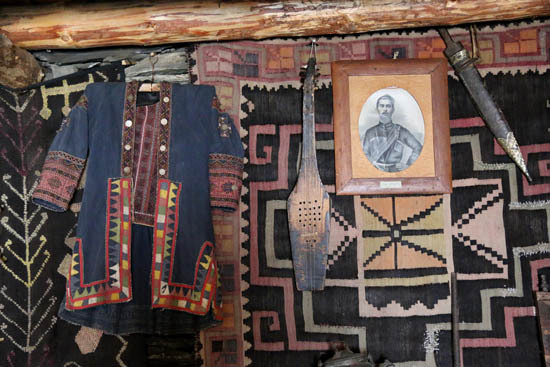 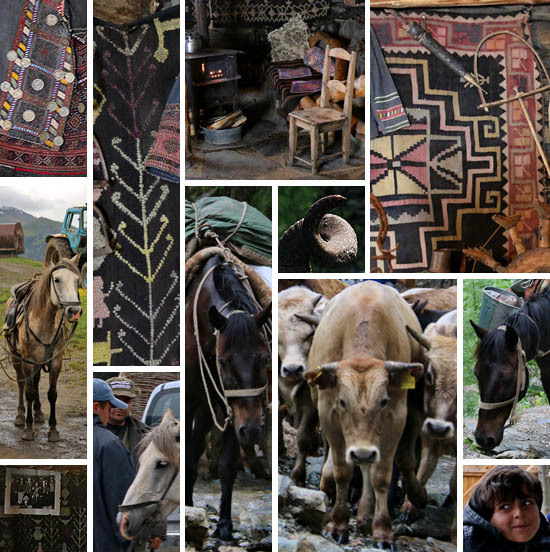 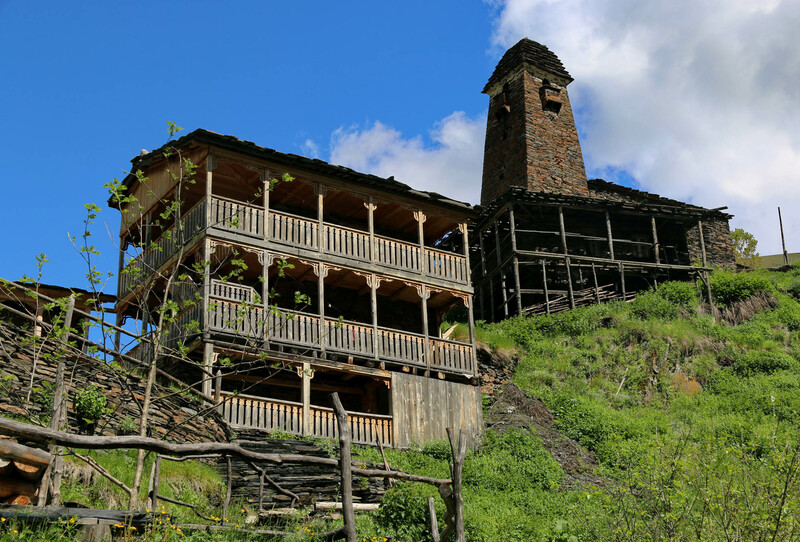 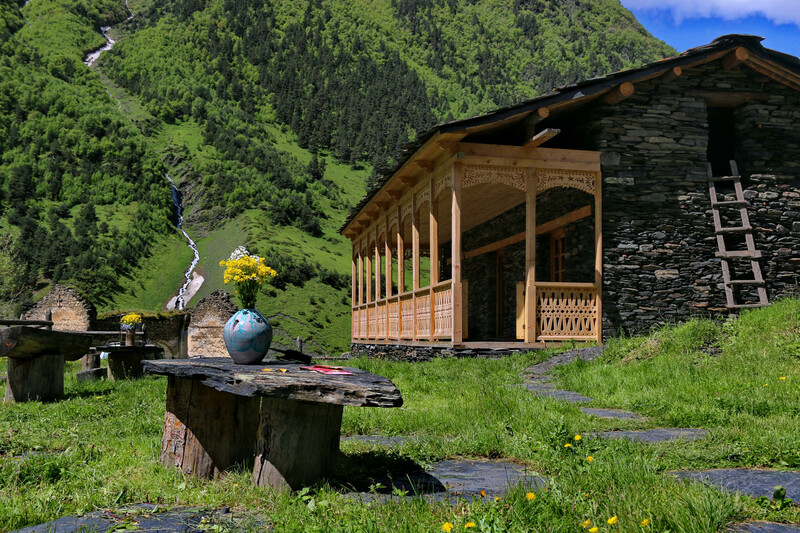 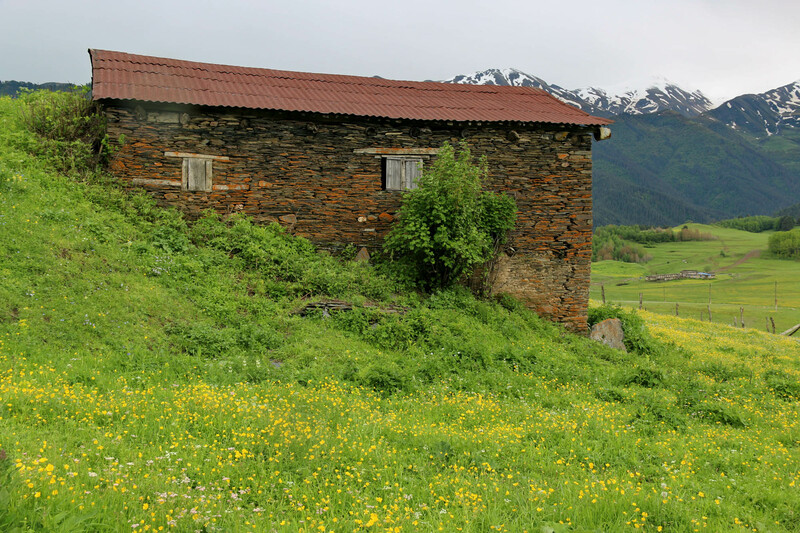 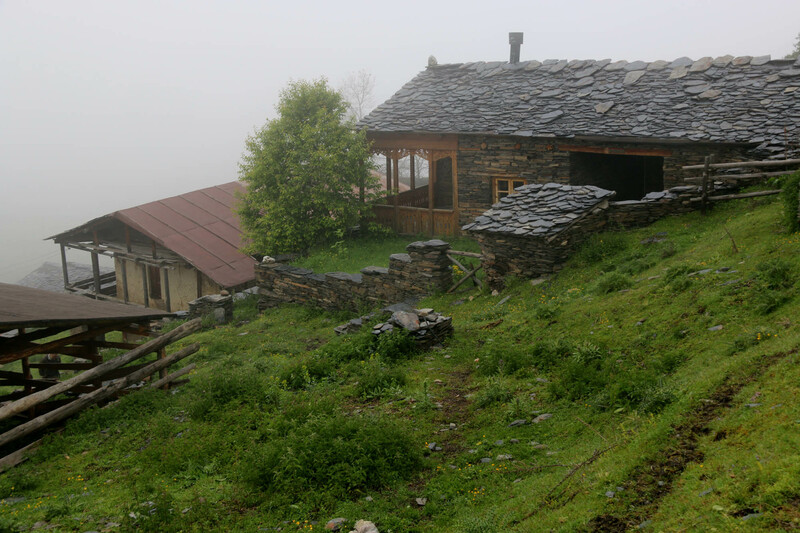 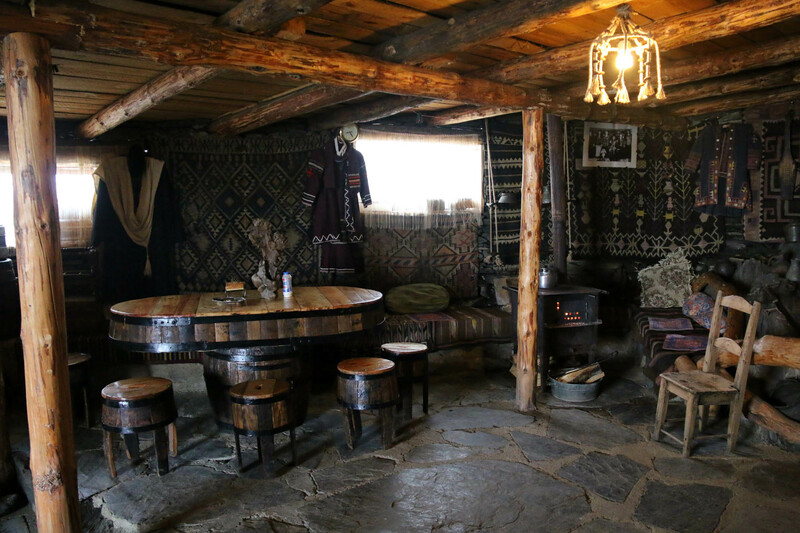 The houses are being beautifully restored, even a classy pub is built in old Tusheti style. 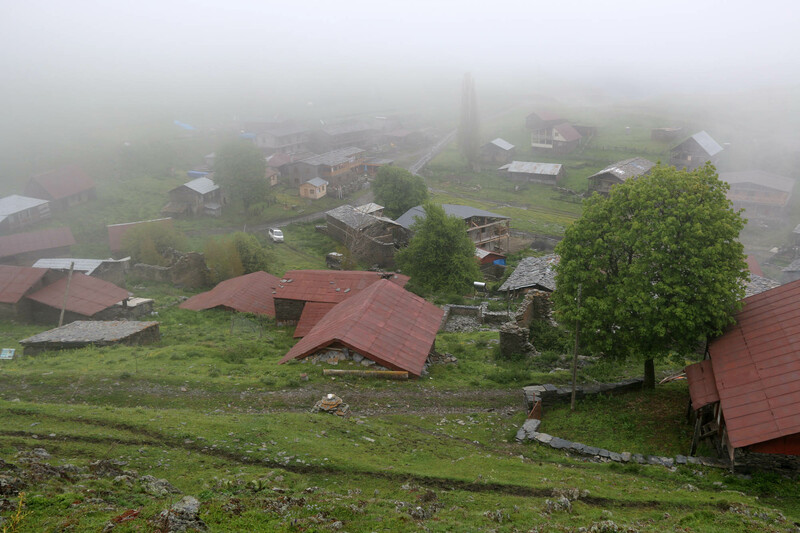 The Tush, though they had moved down to the valleys, apparently consider their ancestral village their real home, even if they only spend their summers here. 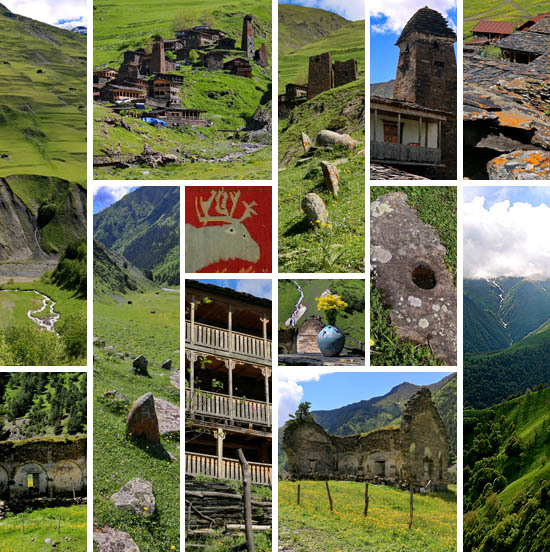 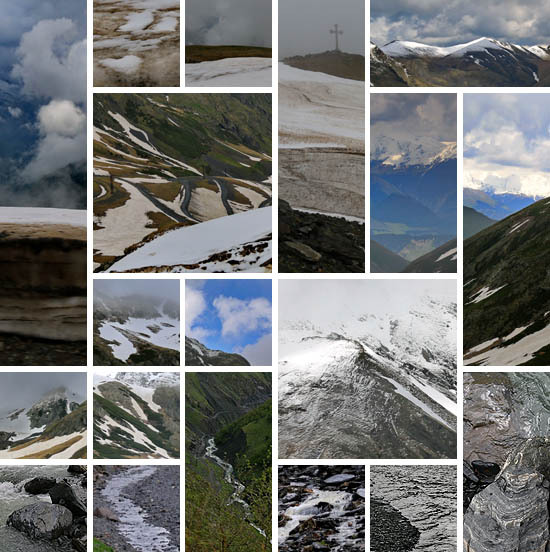 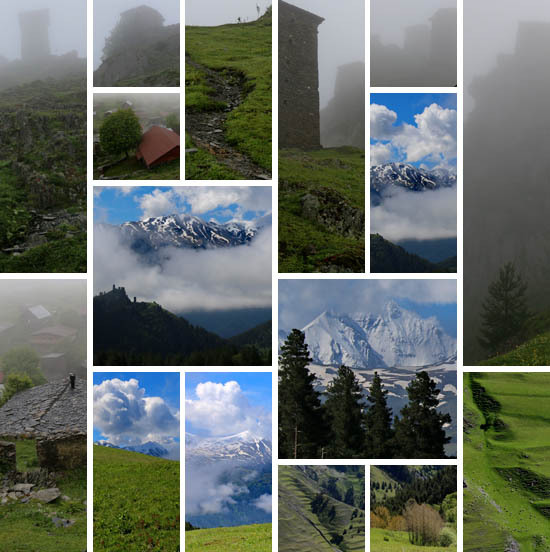 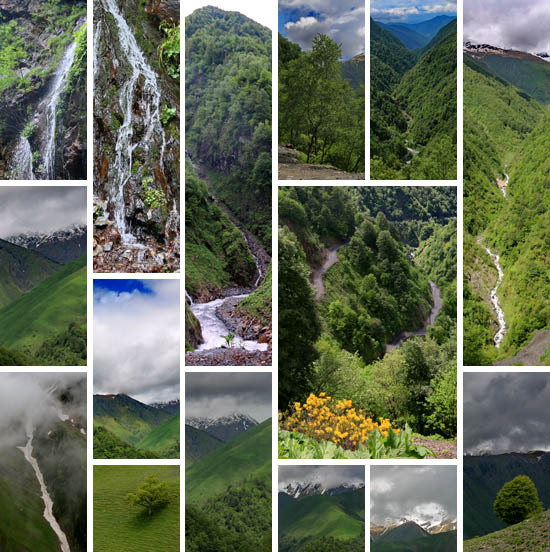 Next summer we lead a group to Tusheti and the neighboring Georgian regions again. 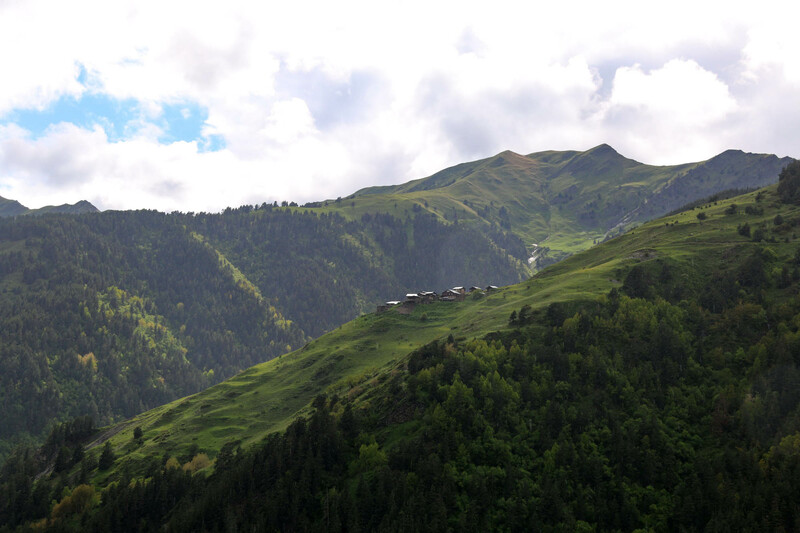 If you want to come with us, write to us at wang@studiolum.com.